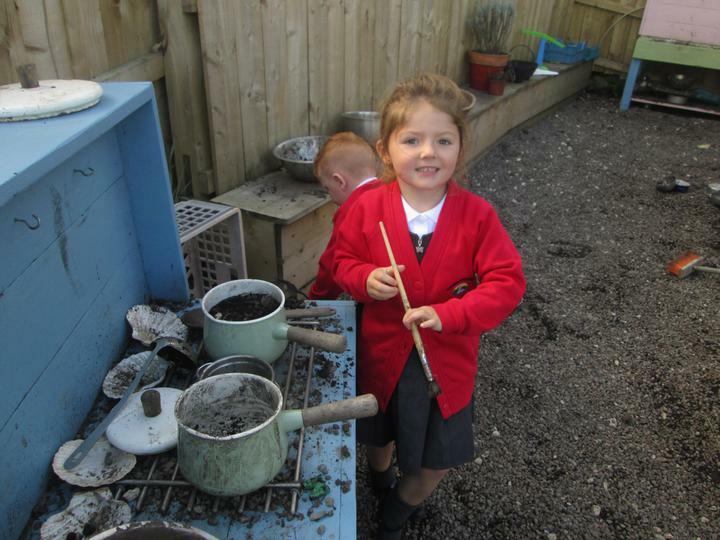 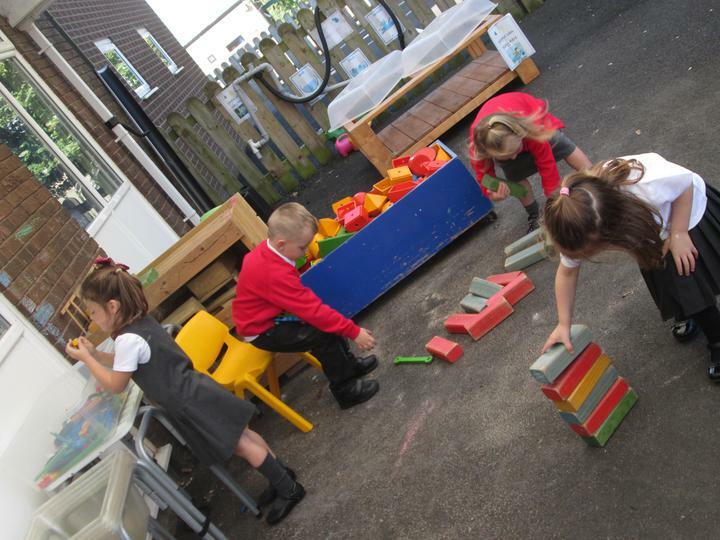 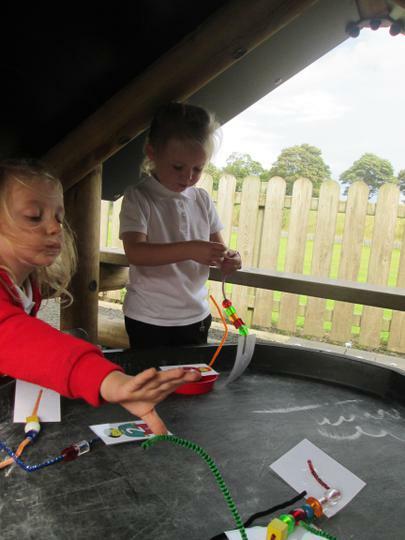 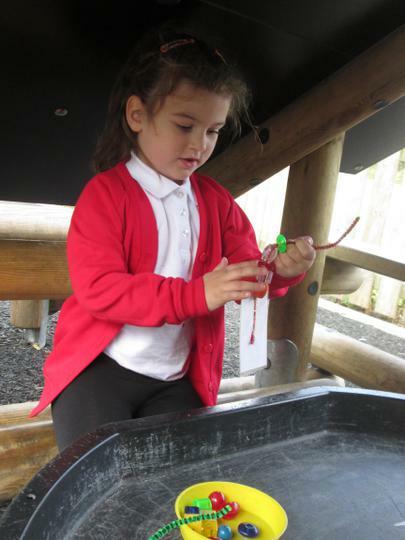 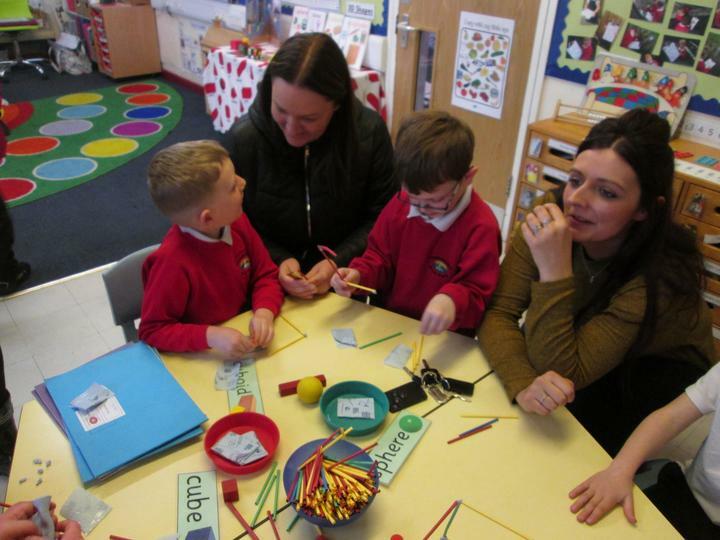 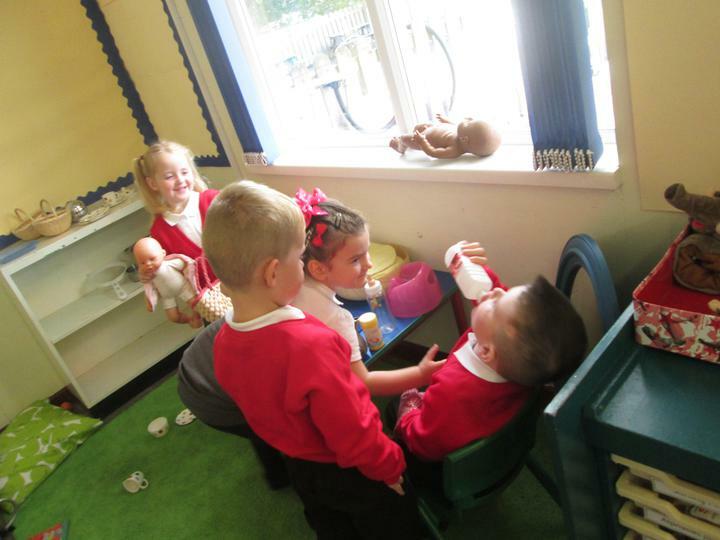 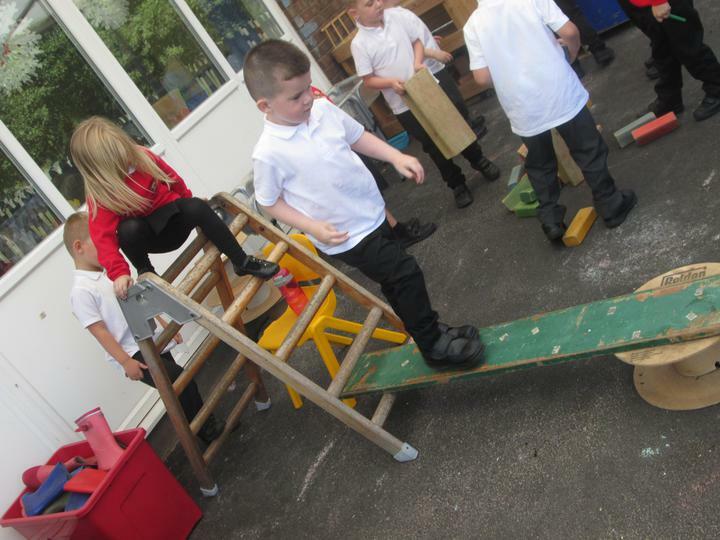 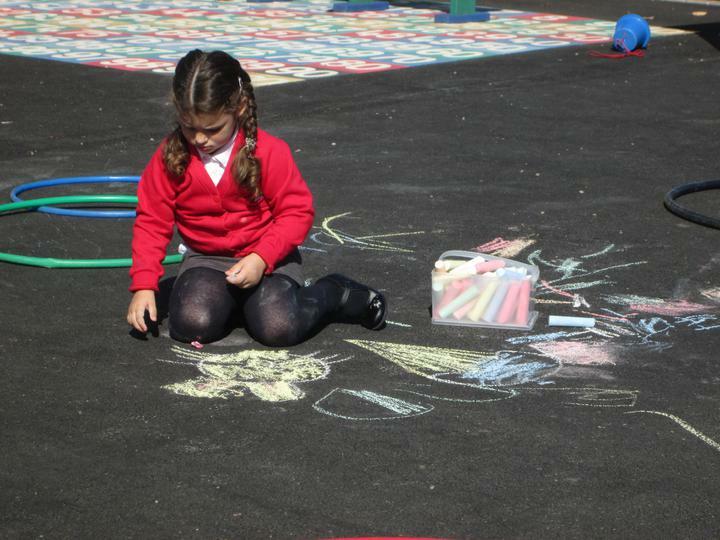 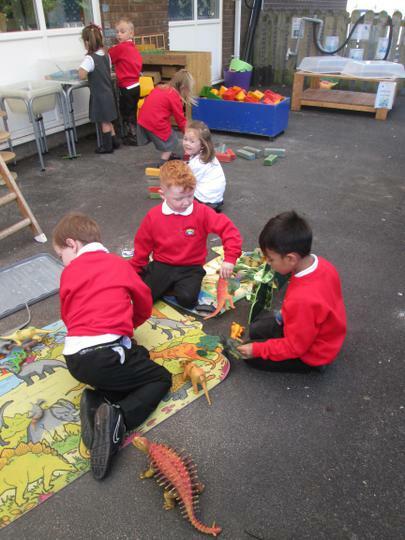 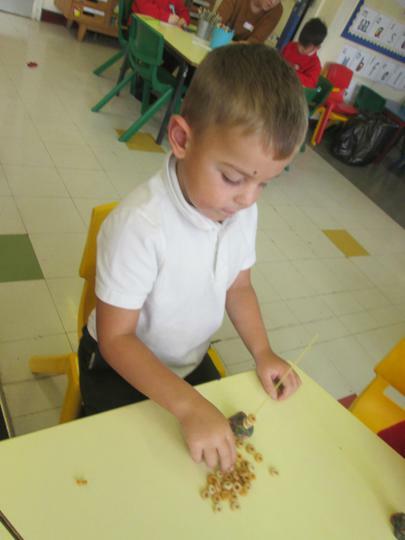 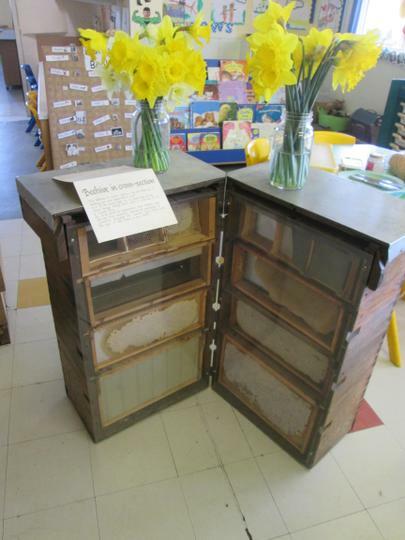 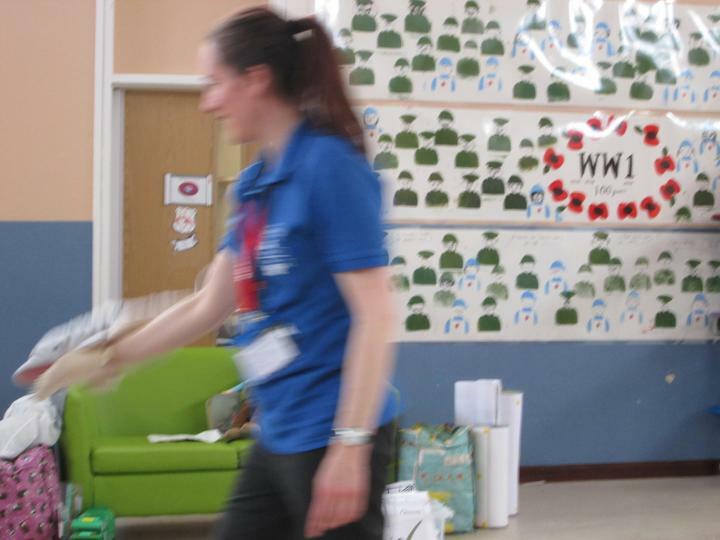 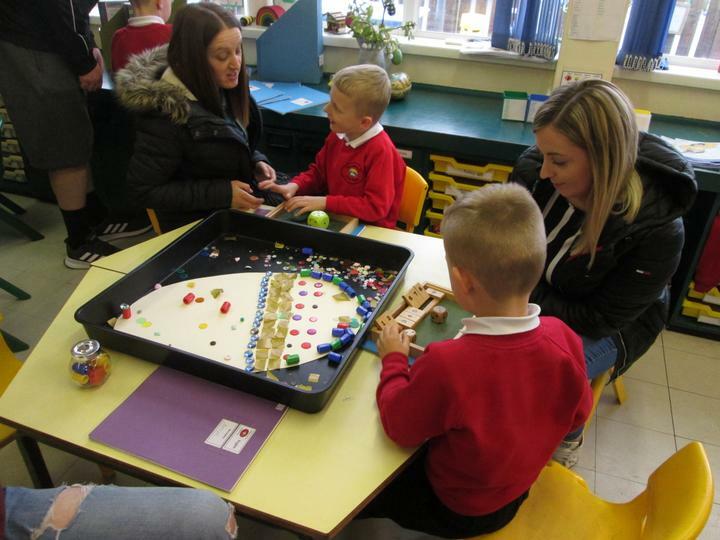 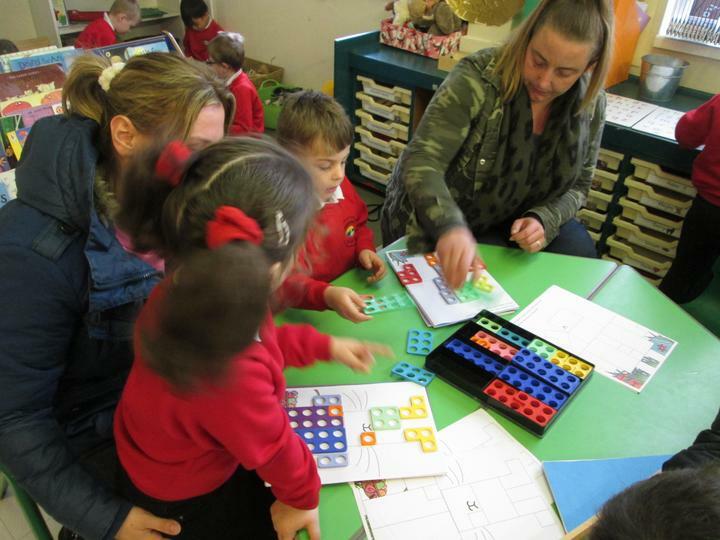 Miss White, Mrs Purves and Mrs Hargreaves are the staff in Reception Class. 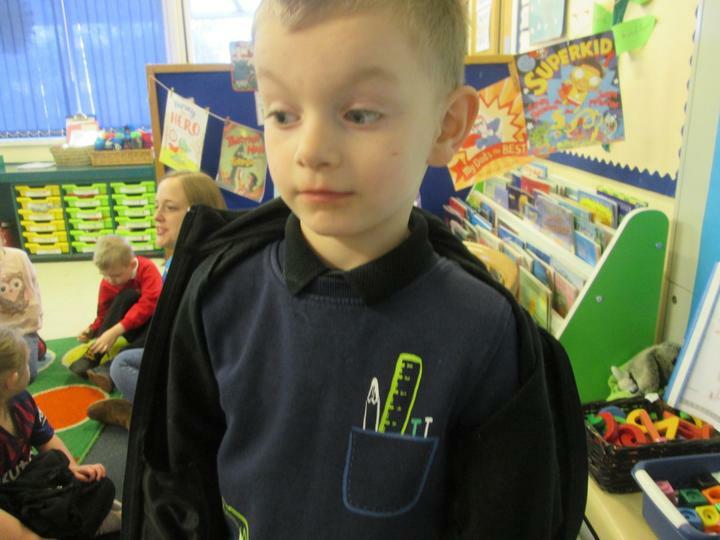 Please remember your bookfolder, water bottle and coat every day. 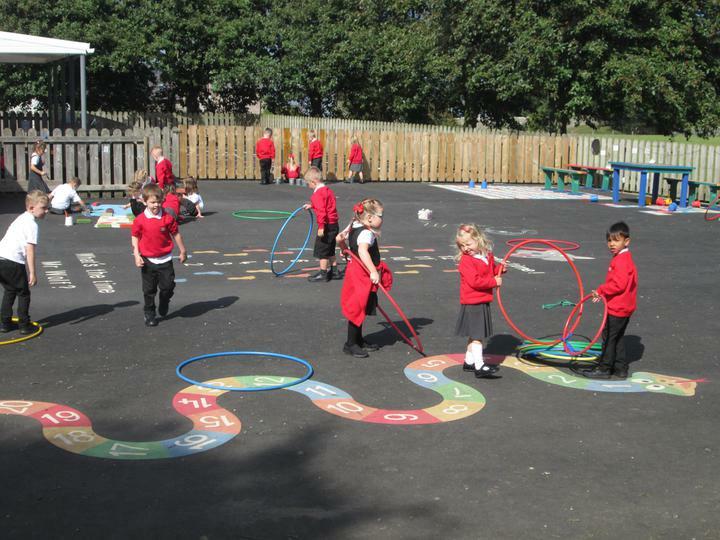 We have P.E. 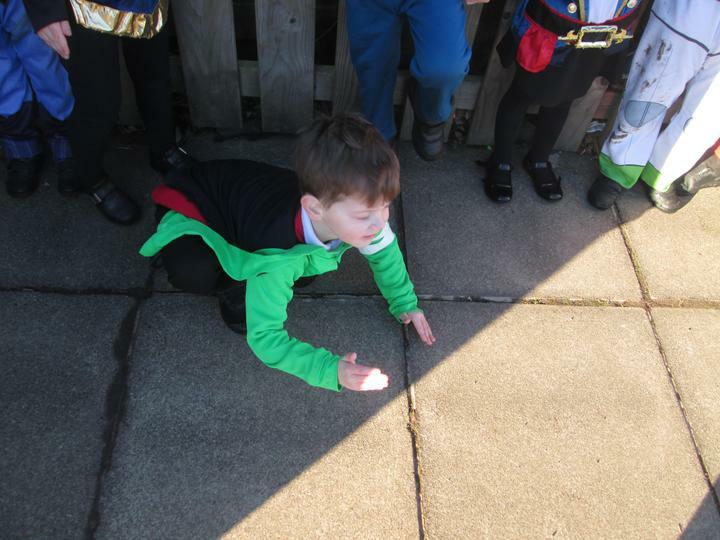 on Wednesday and Friday. 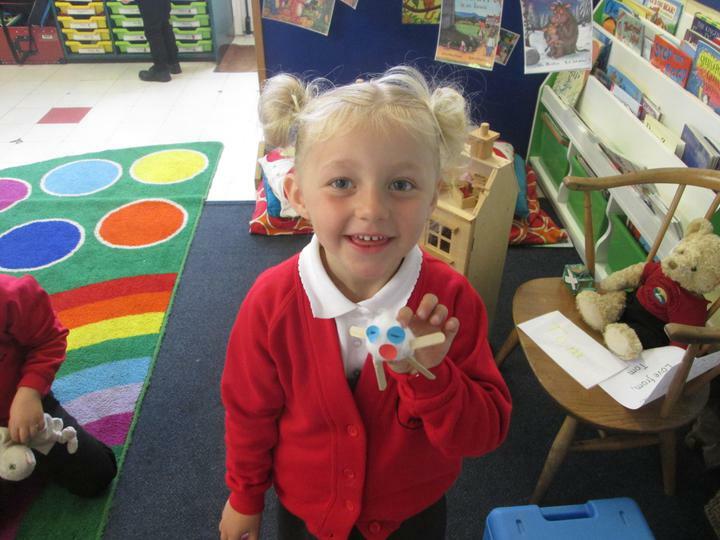 Please make sure earrings are removed for those days otherwise the child can not take part. 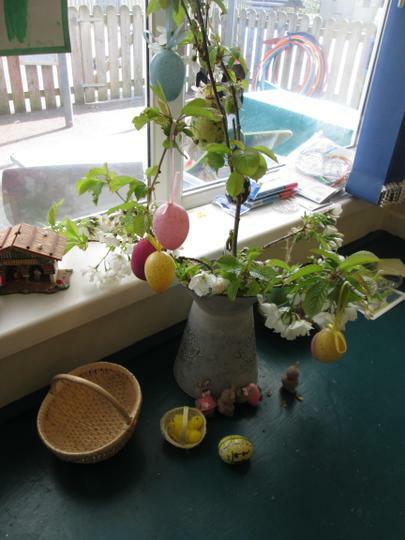 Happy Easter to everyone. 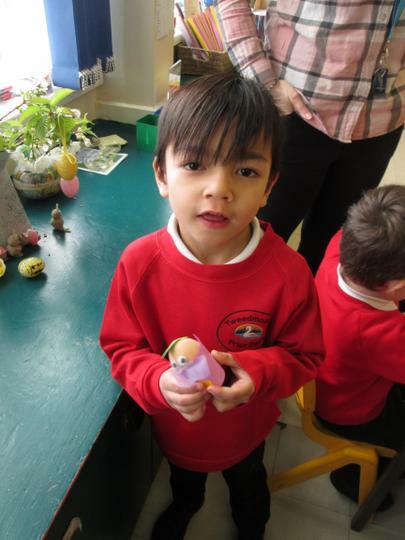 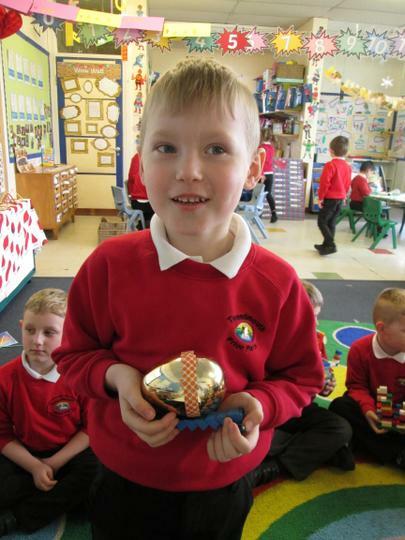 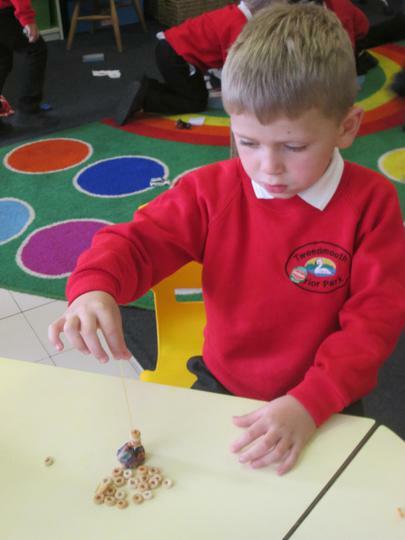 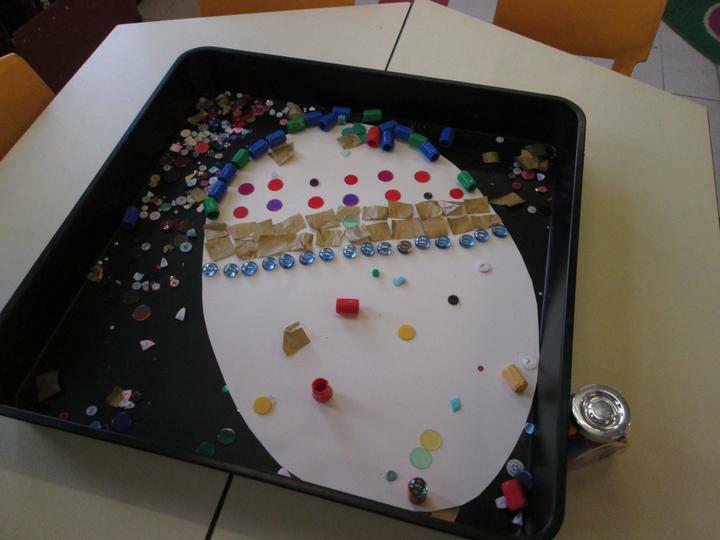 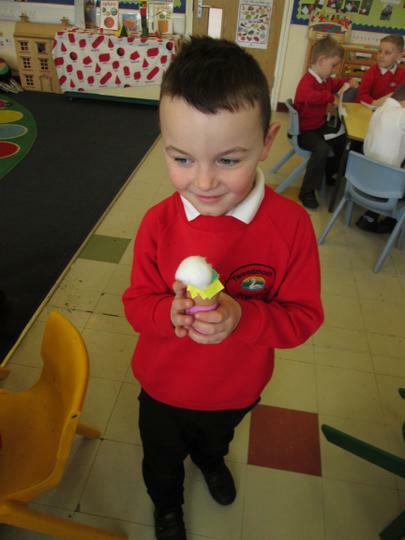 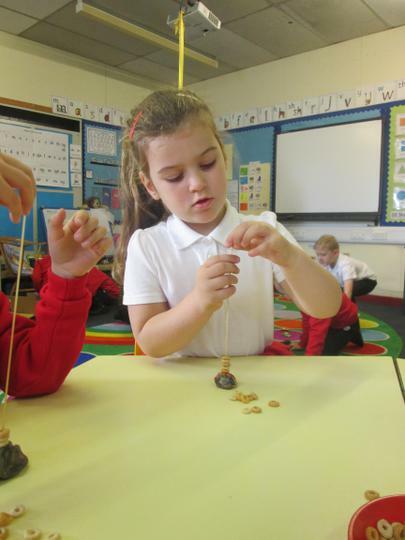 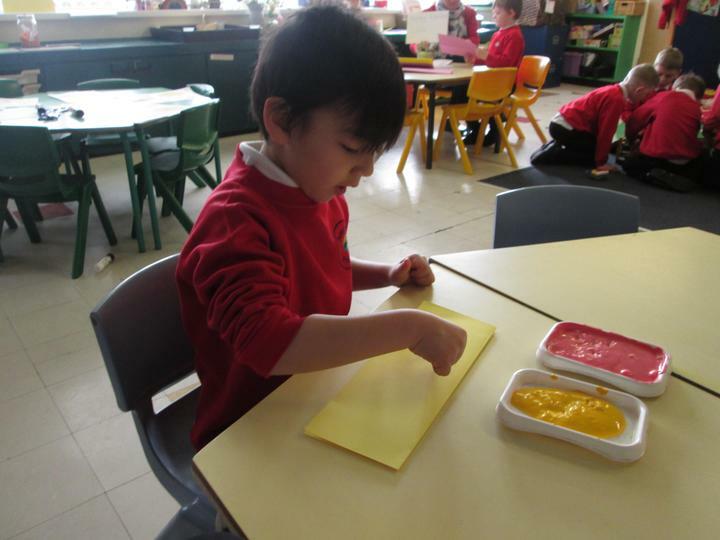 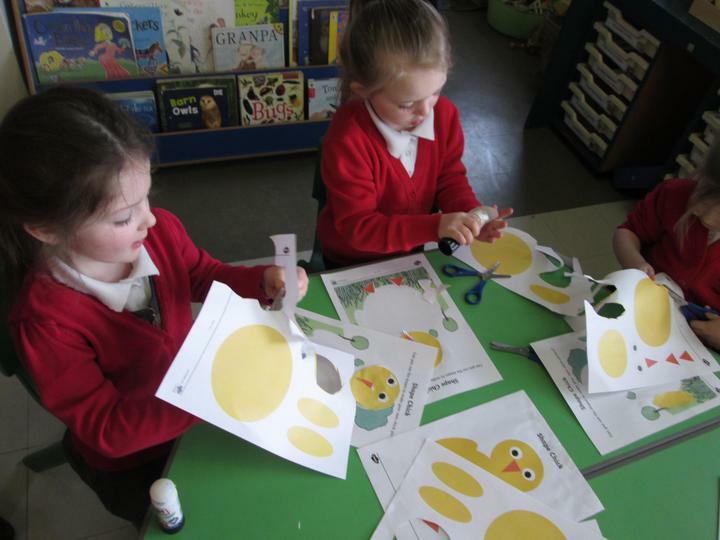 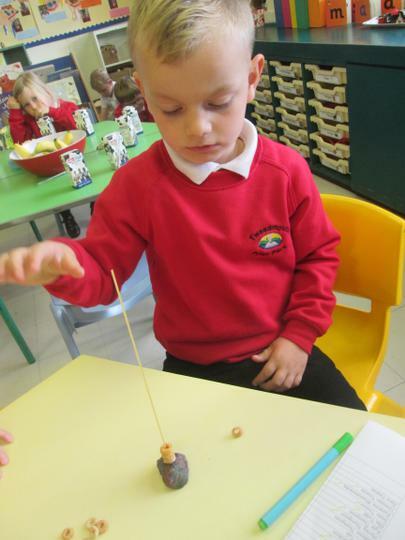 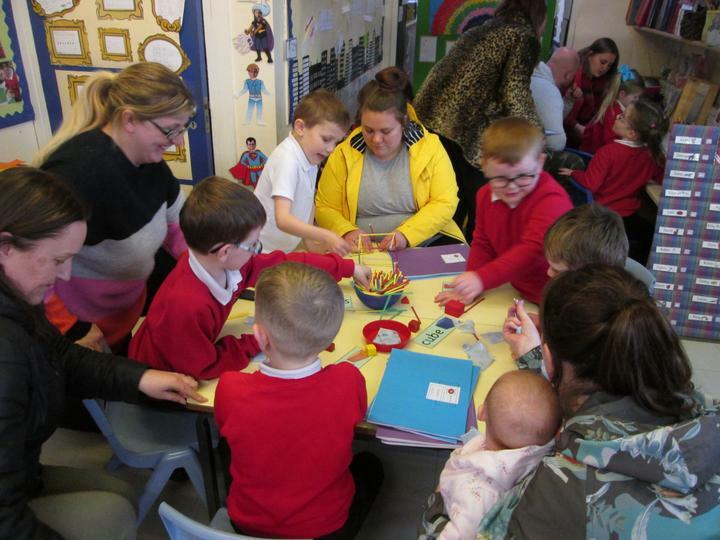 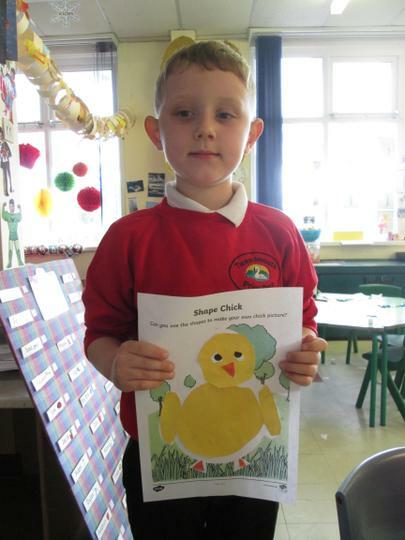 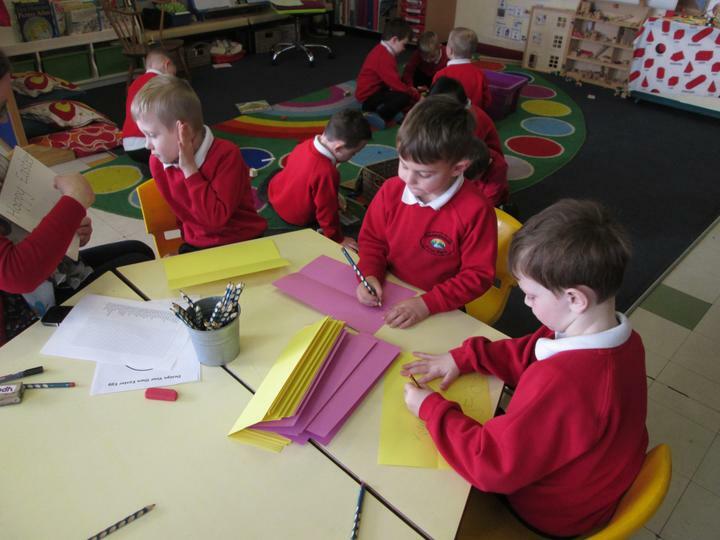 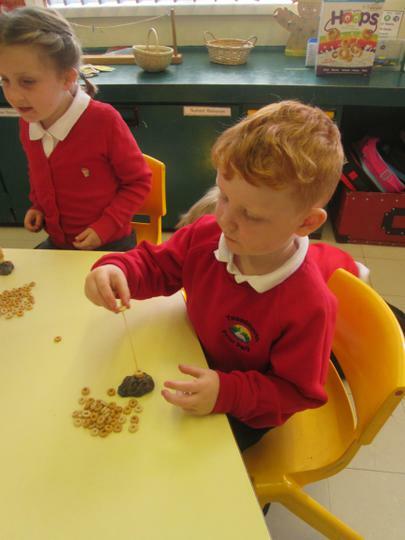 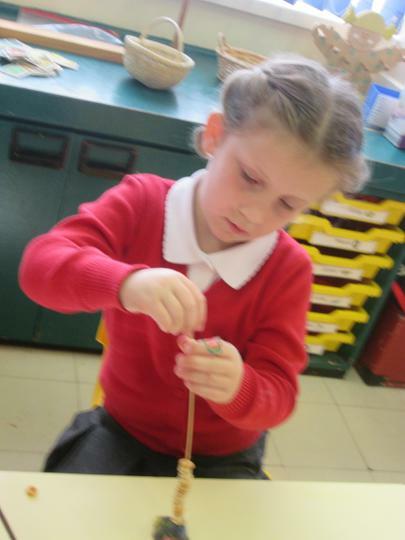 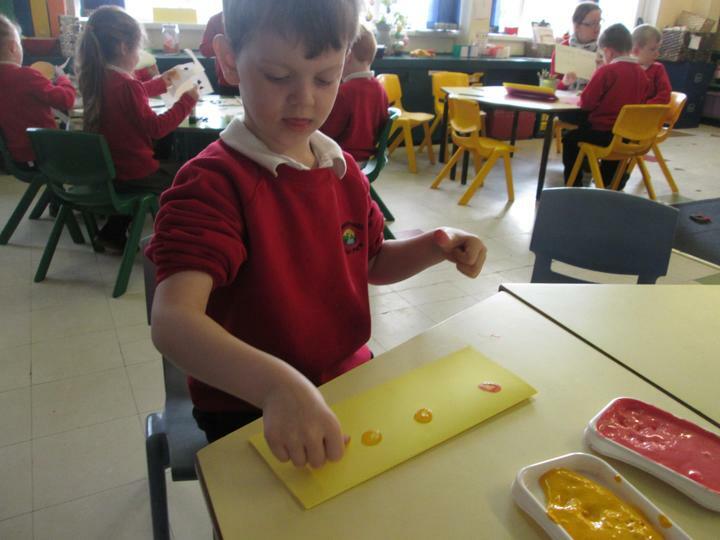 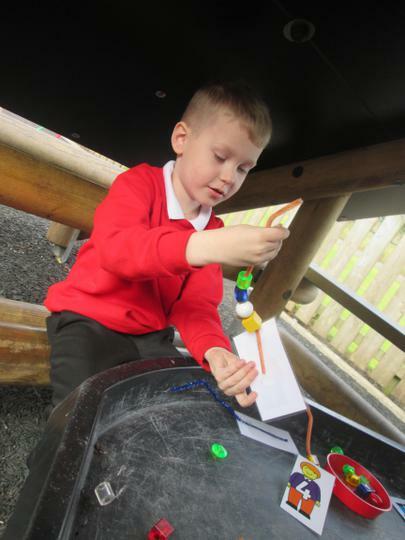 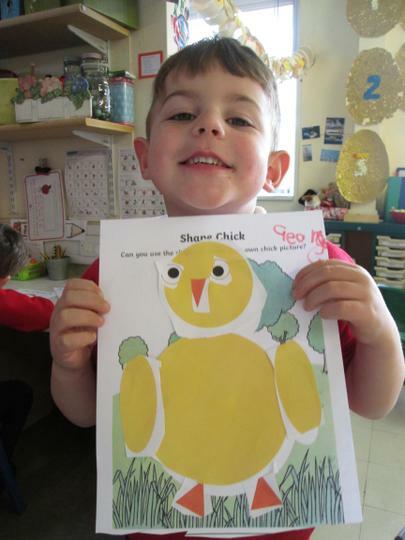 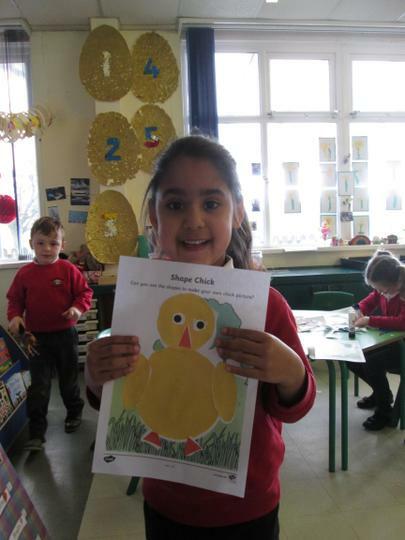 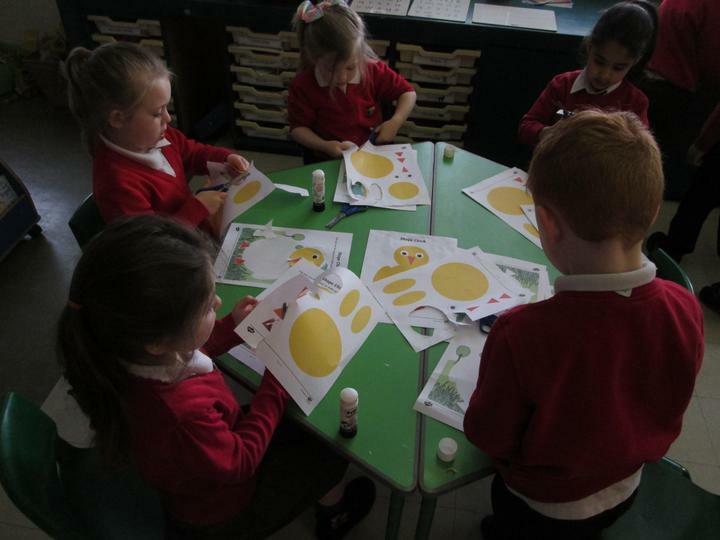 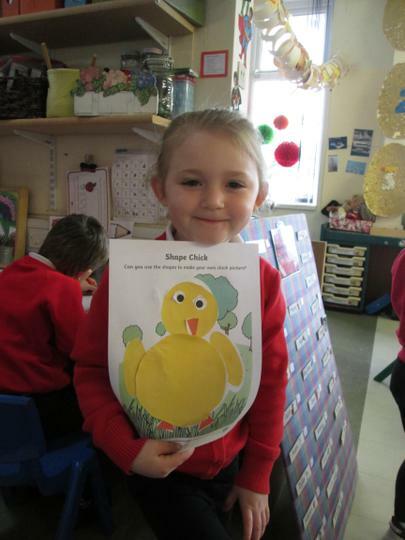 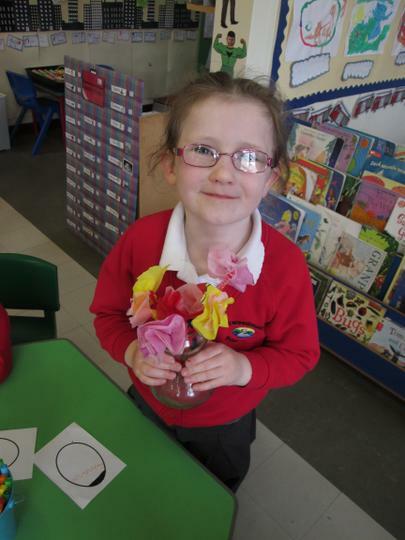 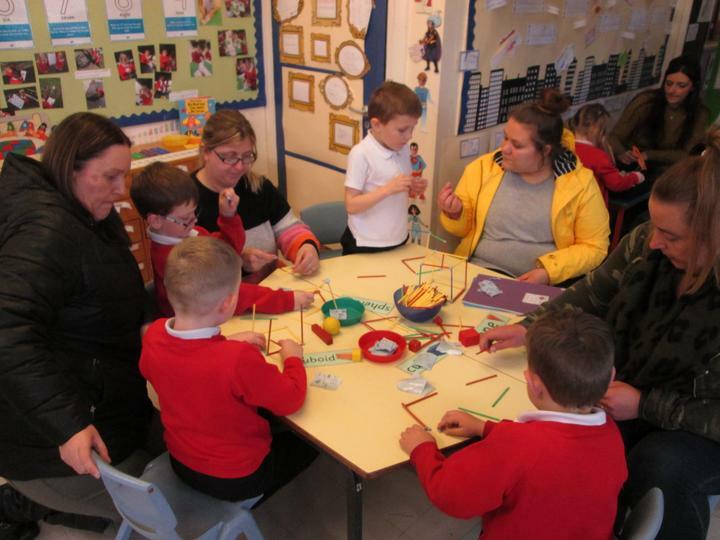 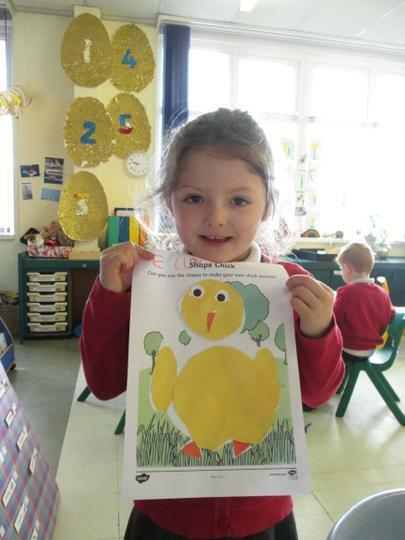 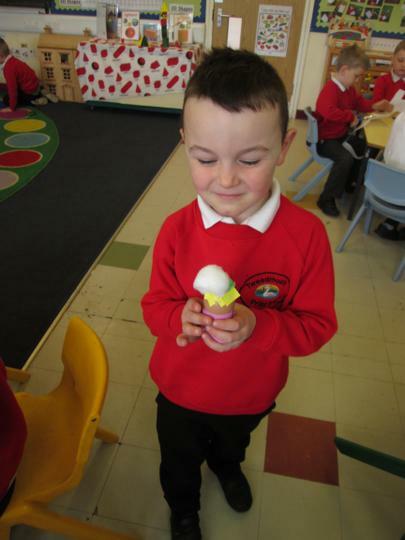 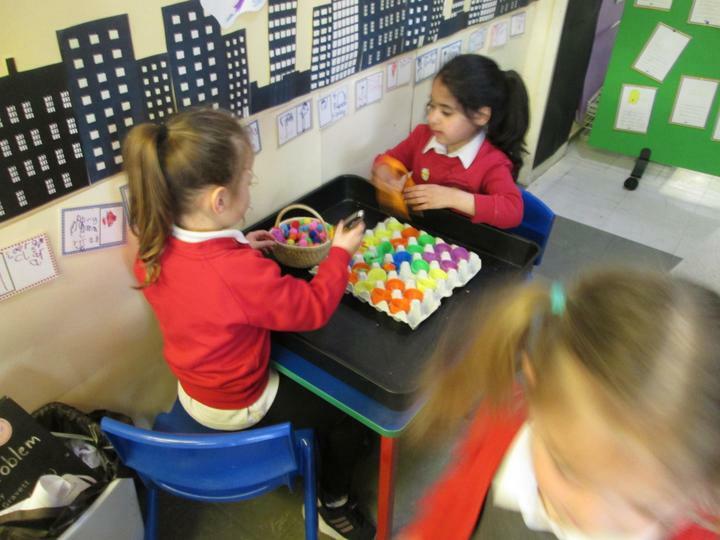 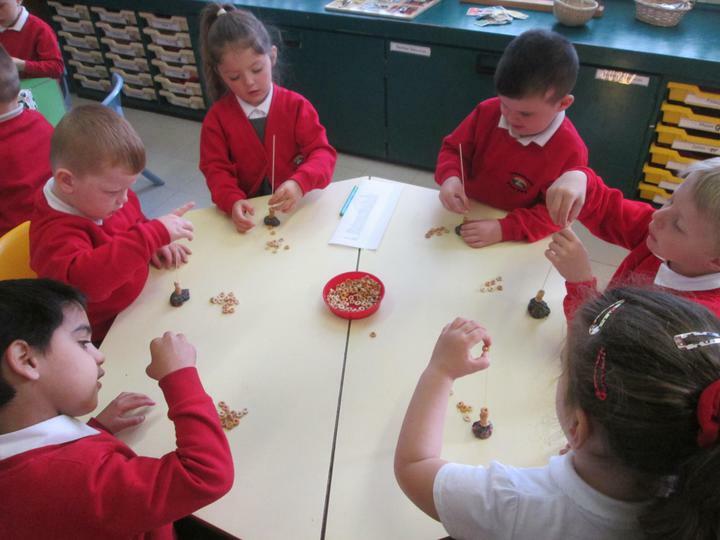 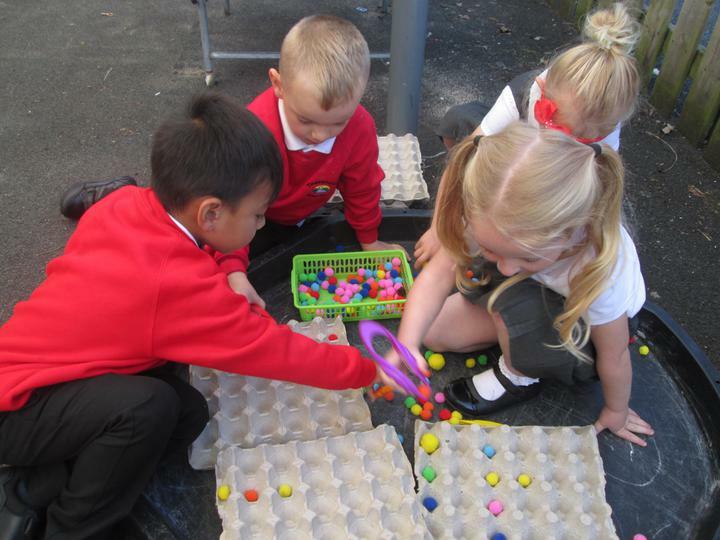 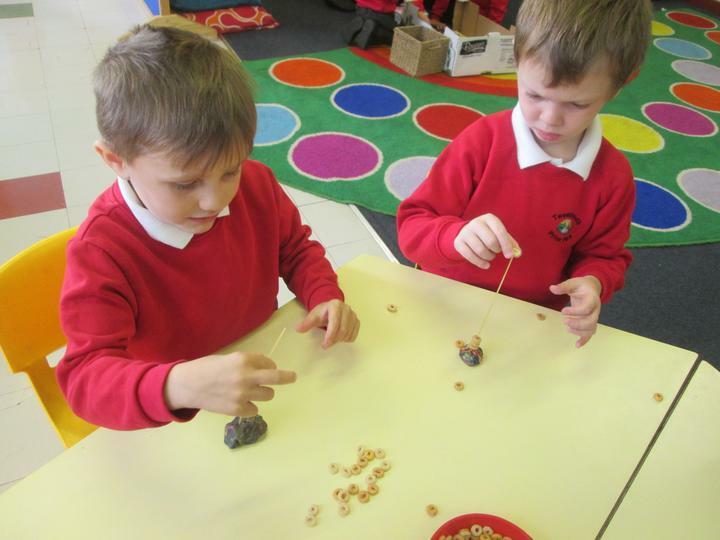 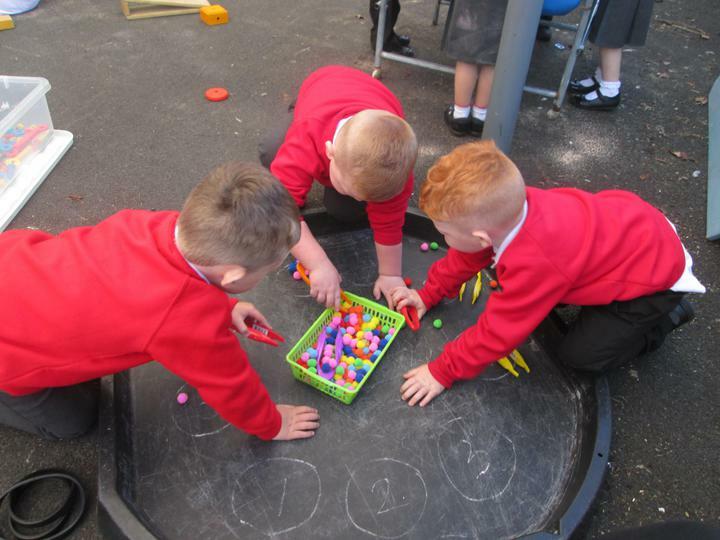 We have enjoyed making Easter cards and decorations to celebrate Easter. 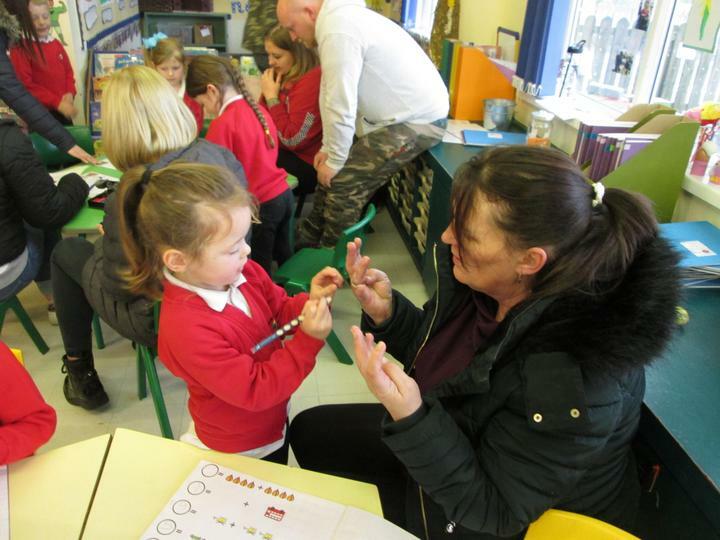 All our parents came to visit our class today. 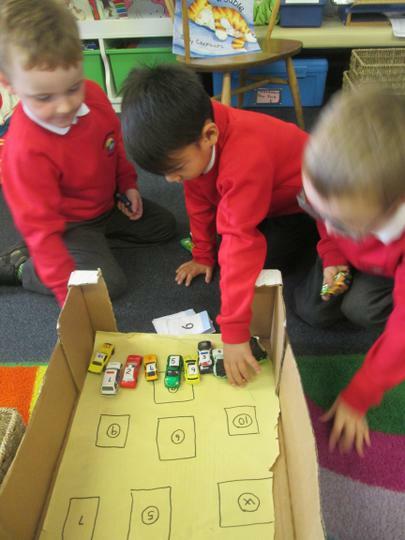 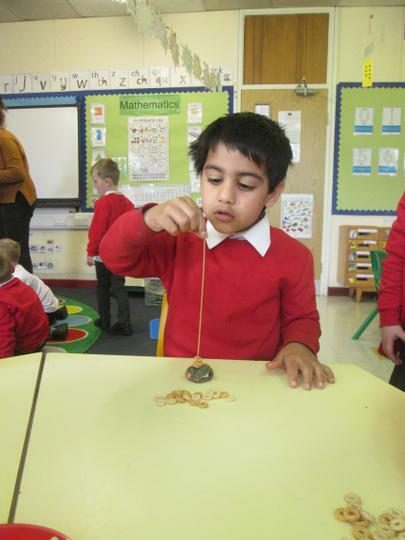 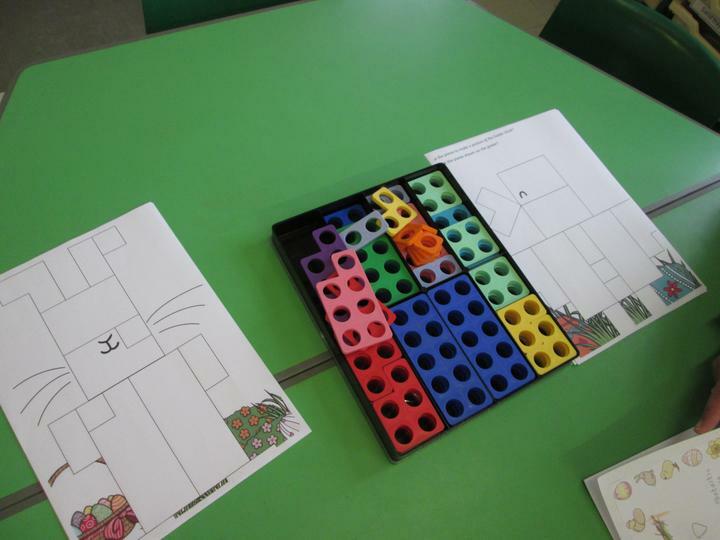 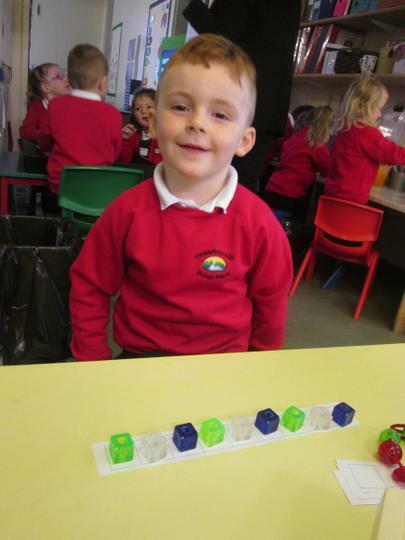 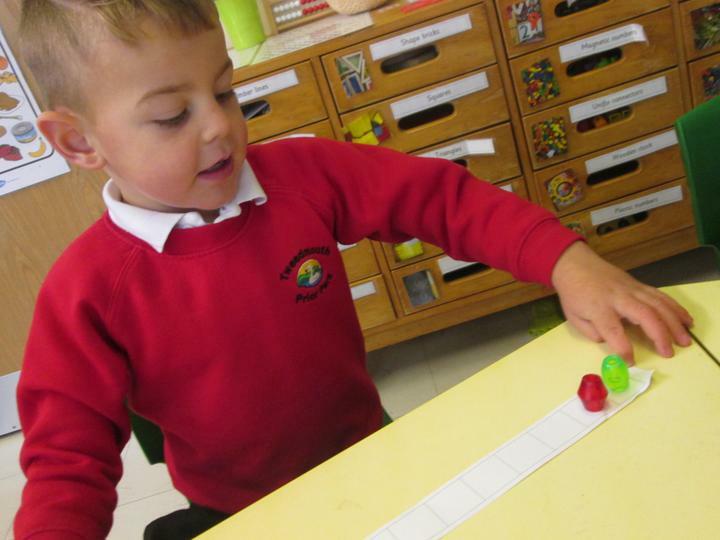 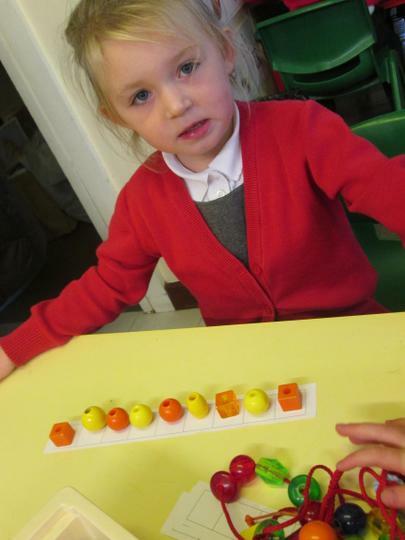 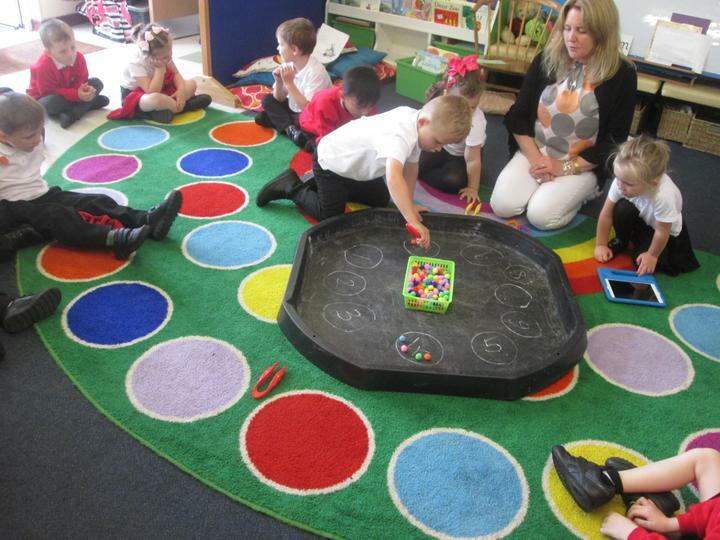 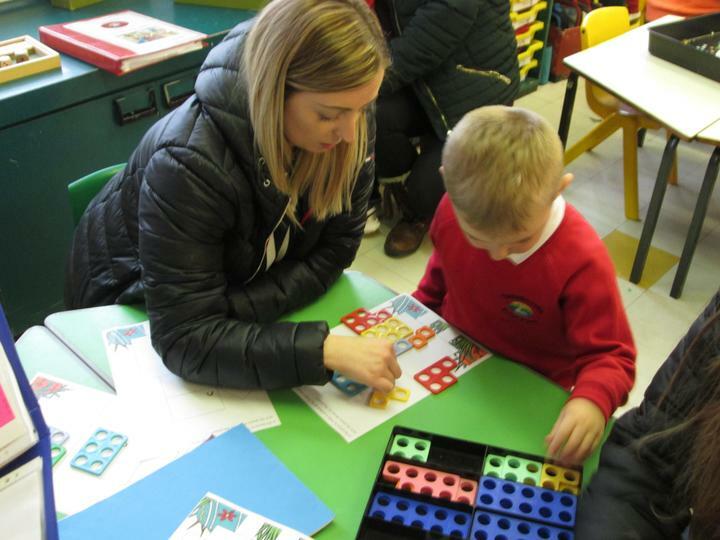 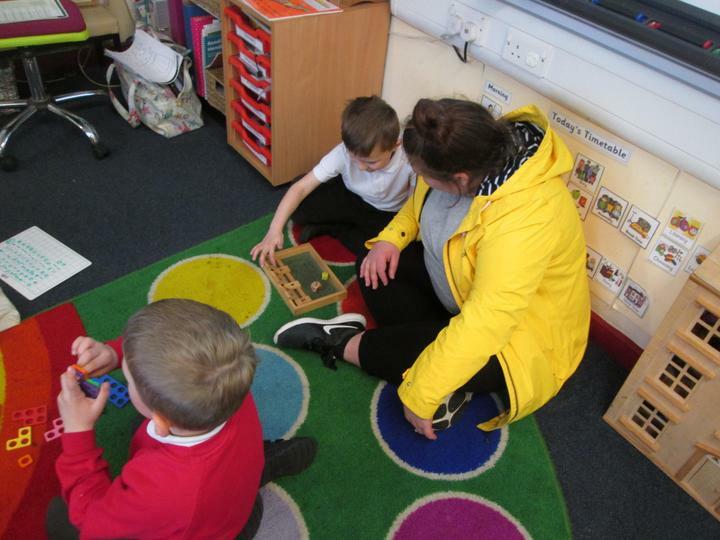 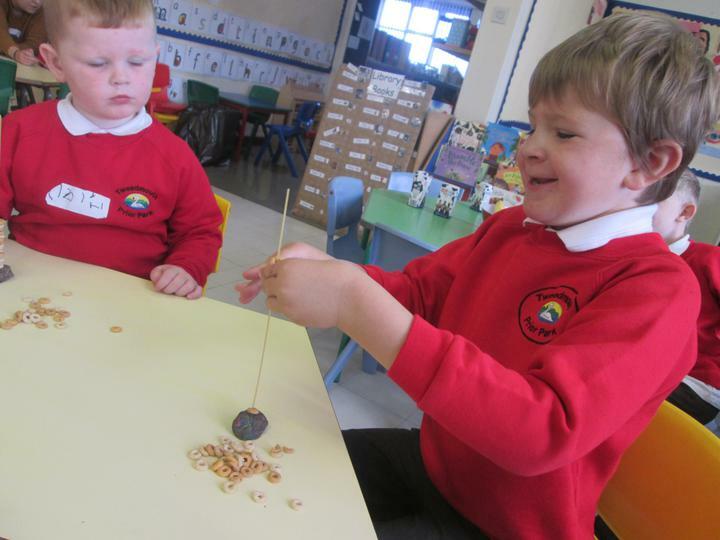 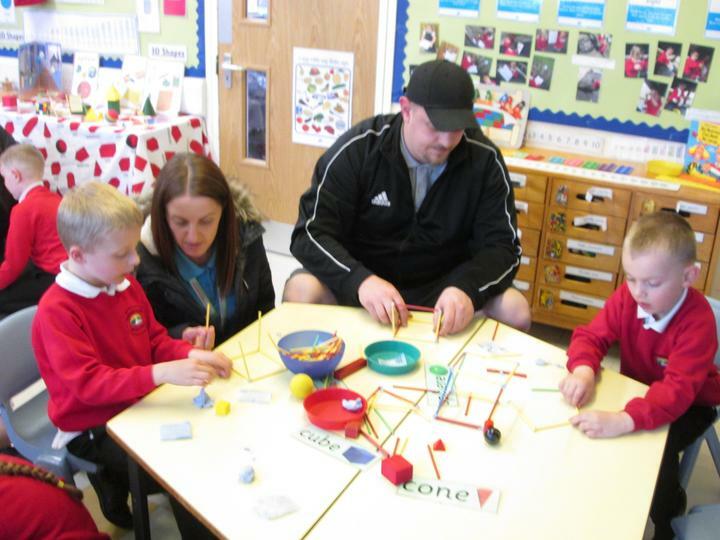 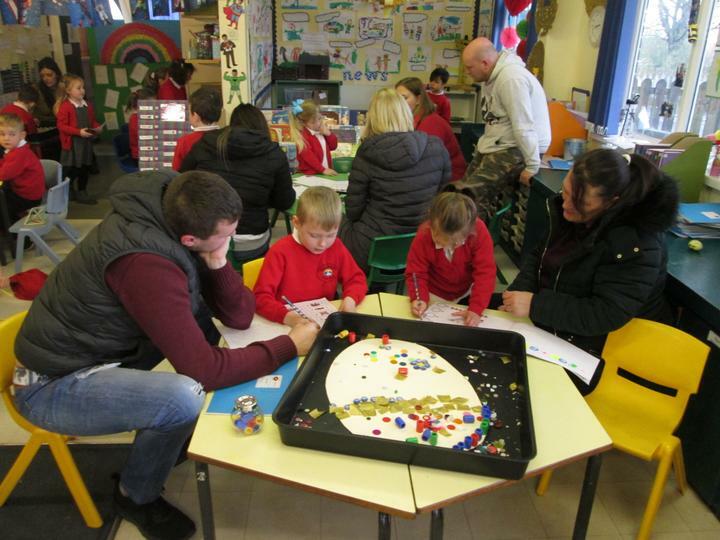 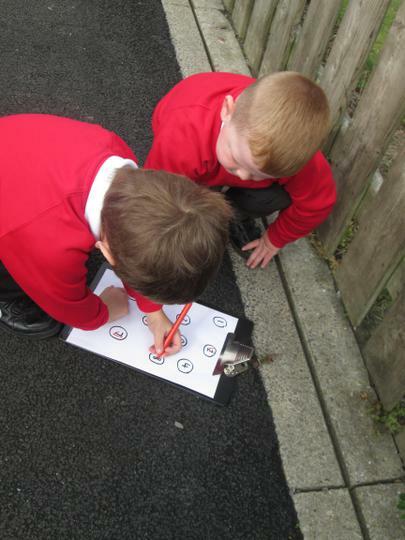 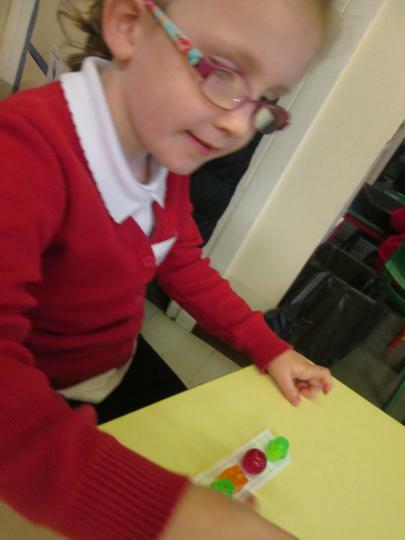 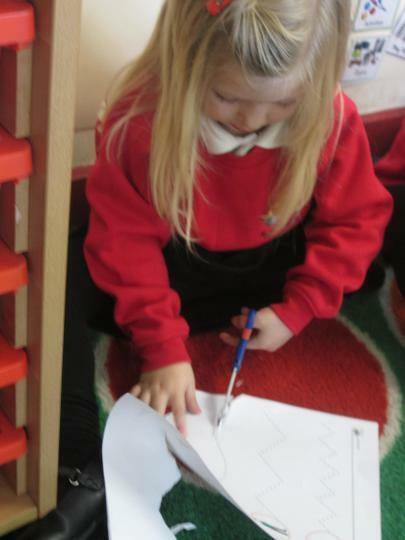 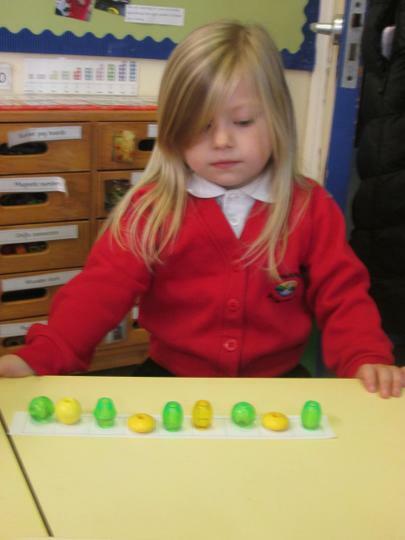 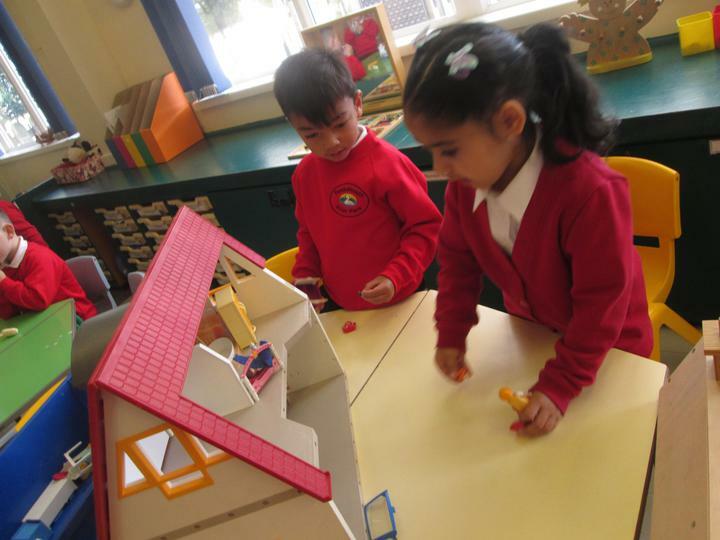 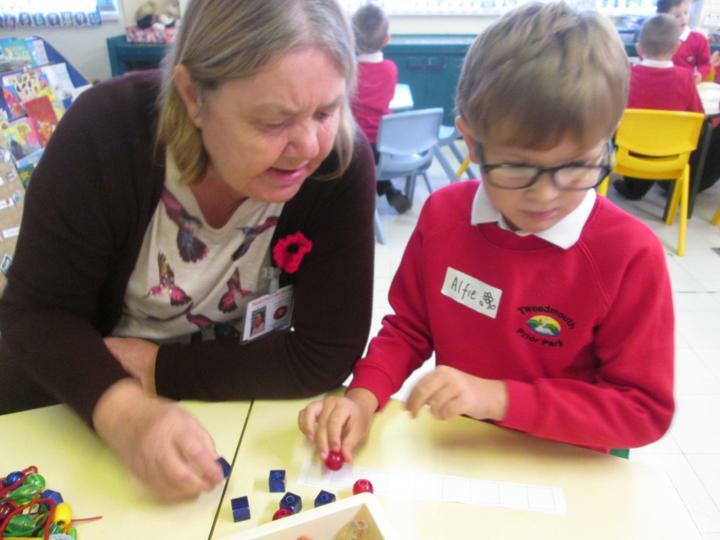 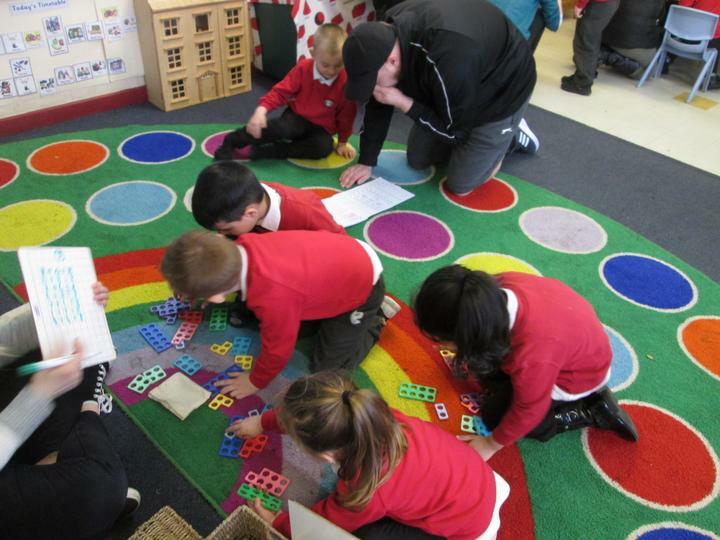 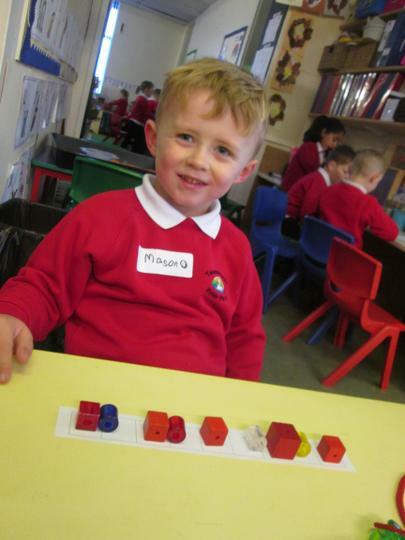 We played lots of maths games and the parents enjoyed solving shape and number problems. 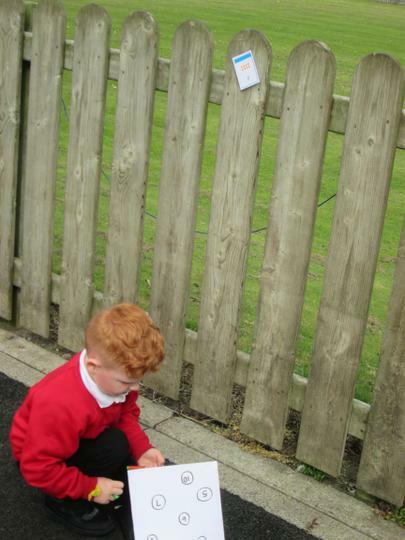 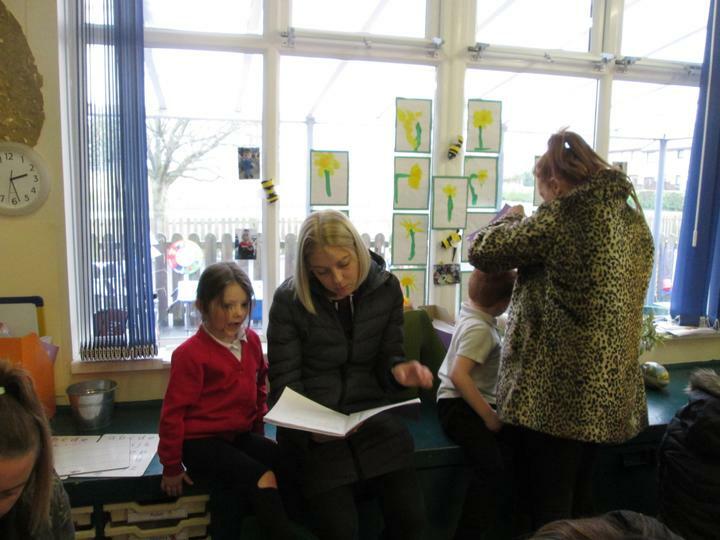 Our parents also had a chance to look at our learning journals and our workbooks. 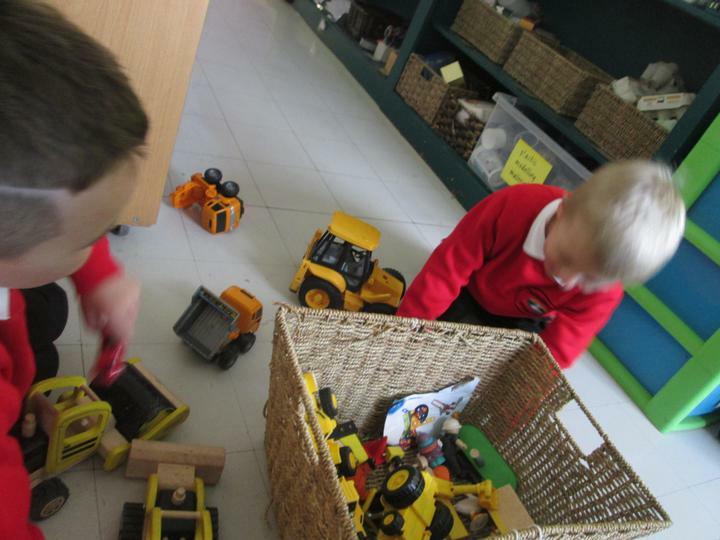 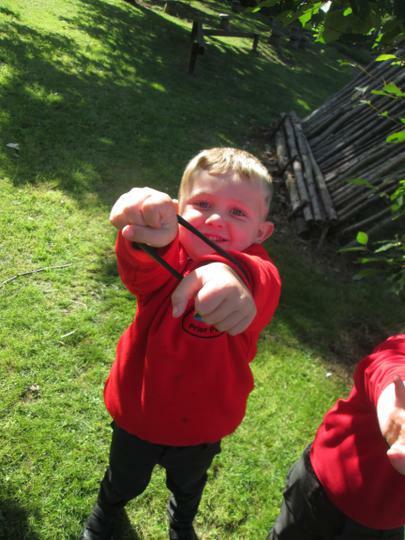 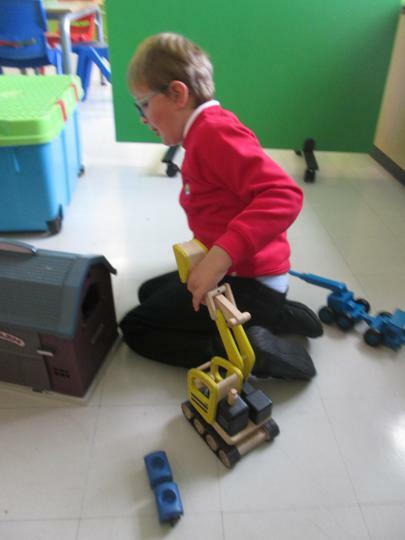 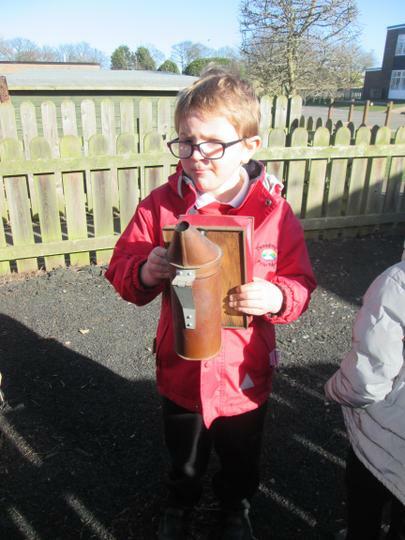 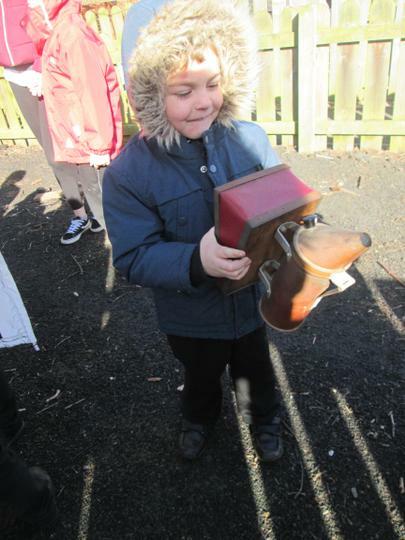 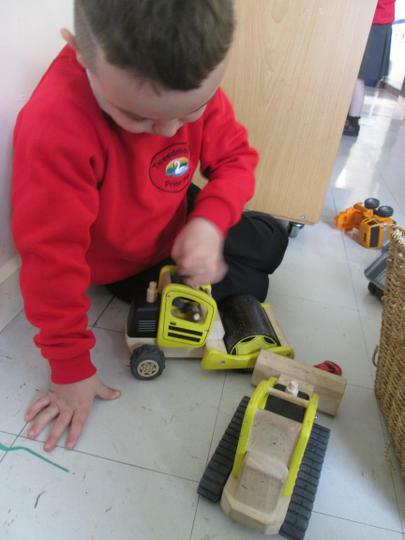 This term our topic is 'Oh what have I found!' 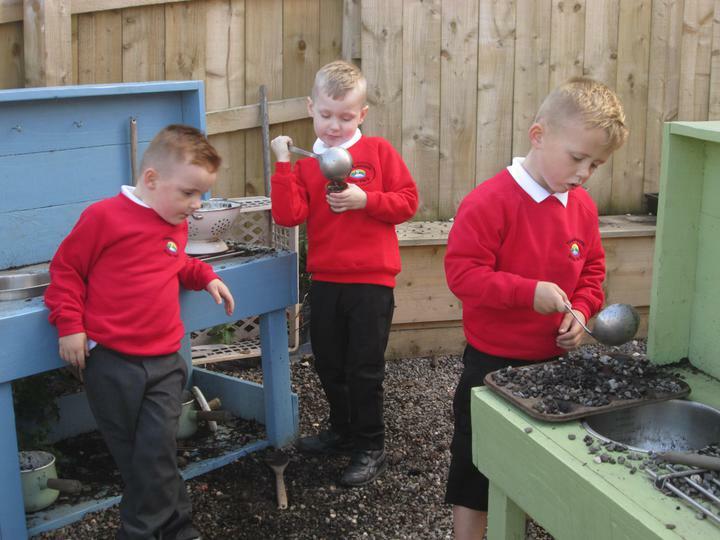 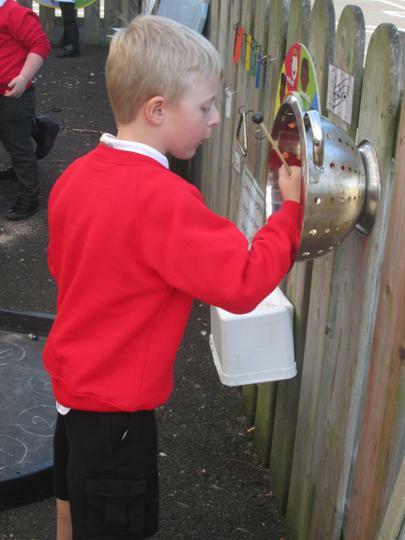 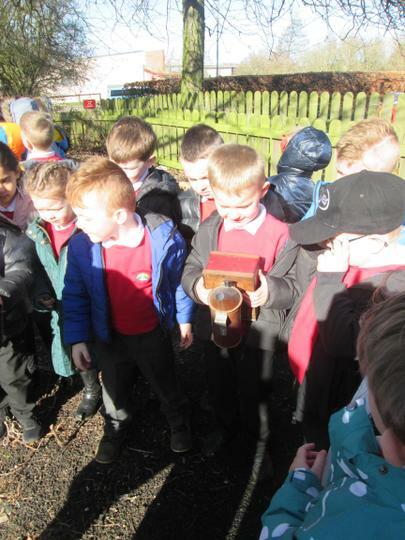 and we are hoping to investigate and find out about lots of different things. 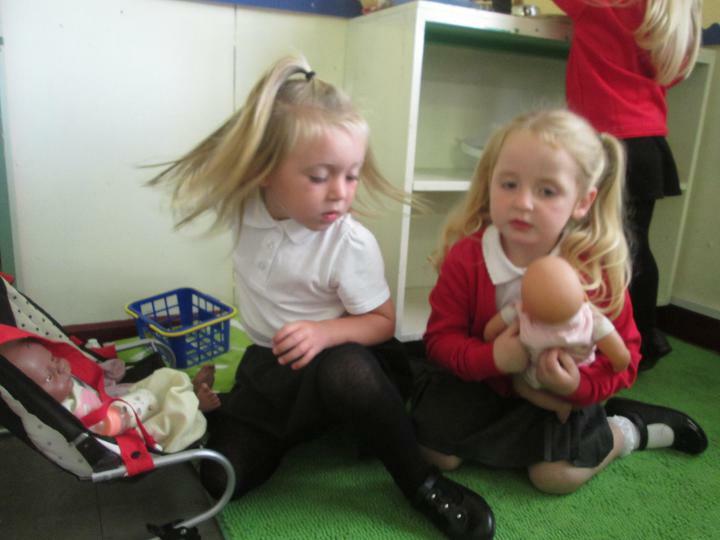 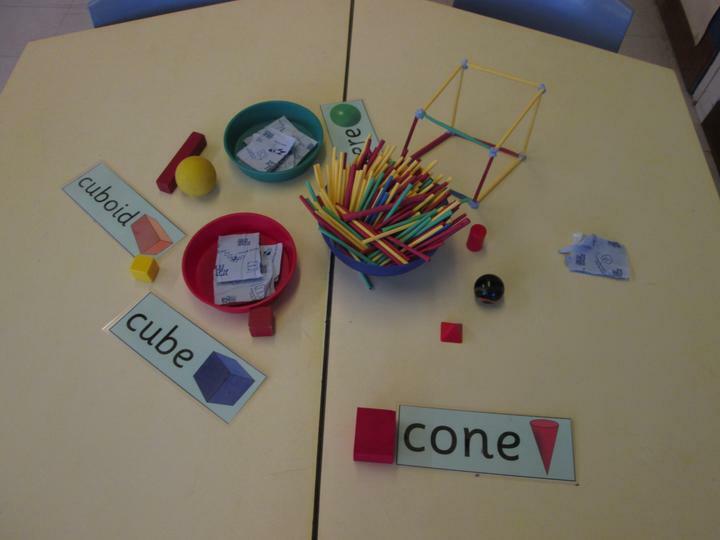 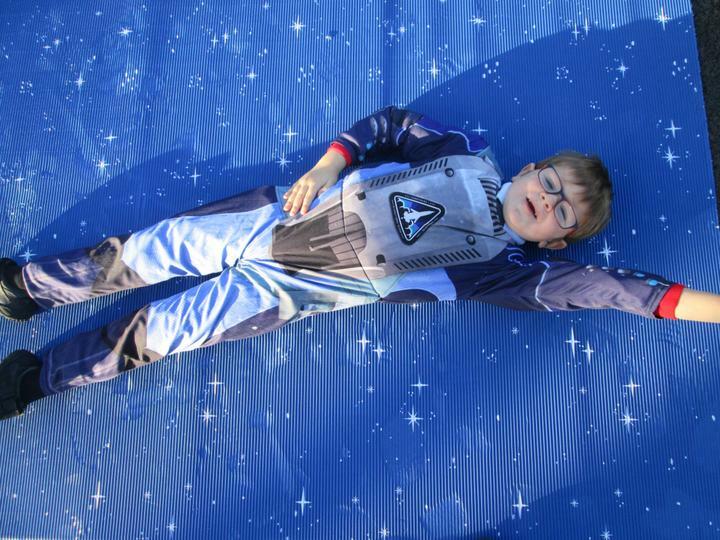 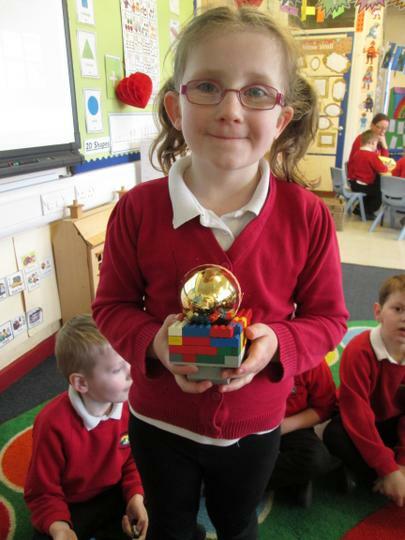 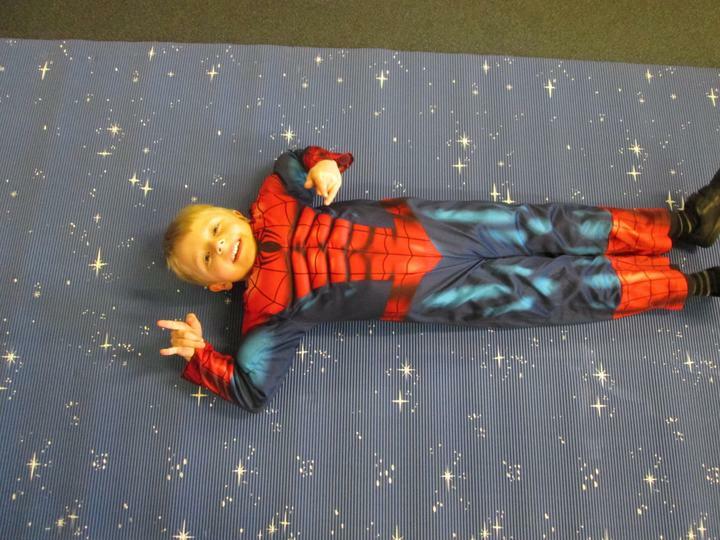 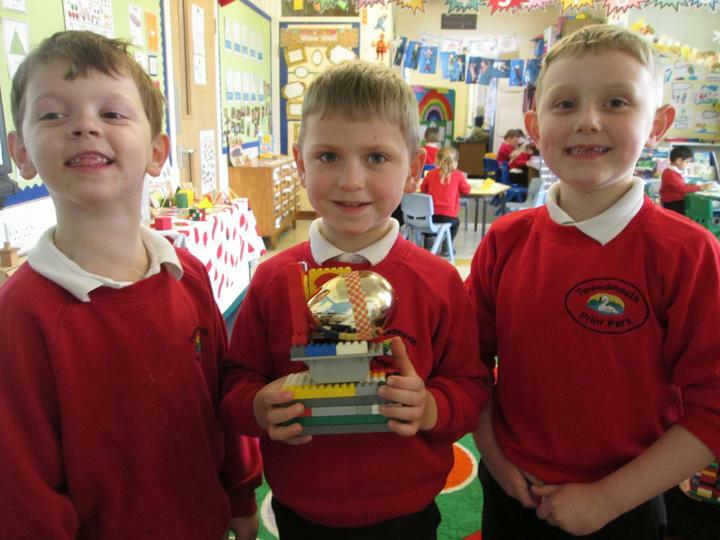 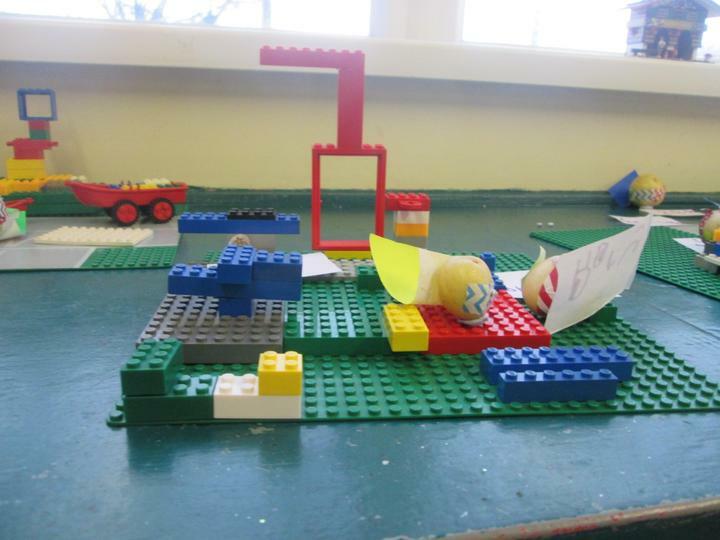 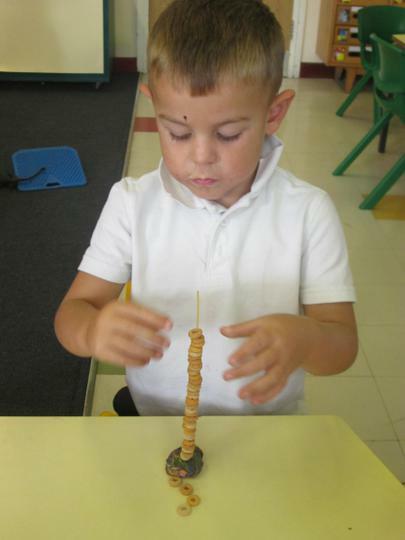 Please look at the topic web to find out about what we are learning this term. 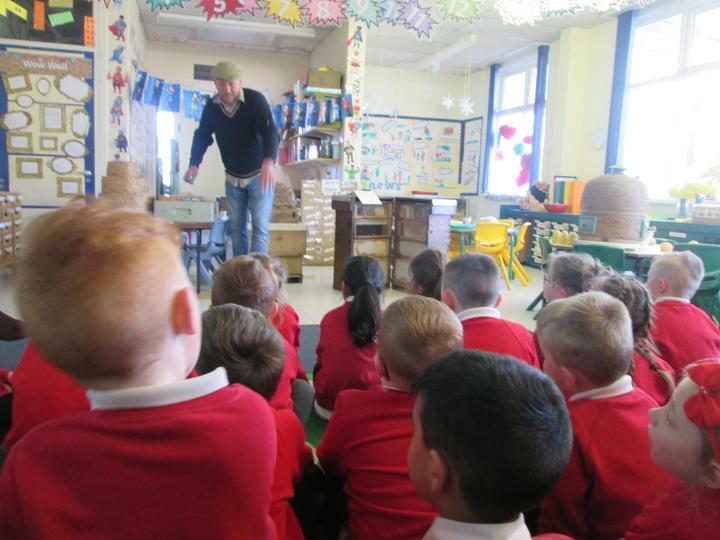 Wes Magee, a poet and children's author came to visit our school. 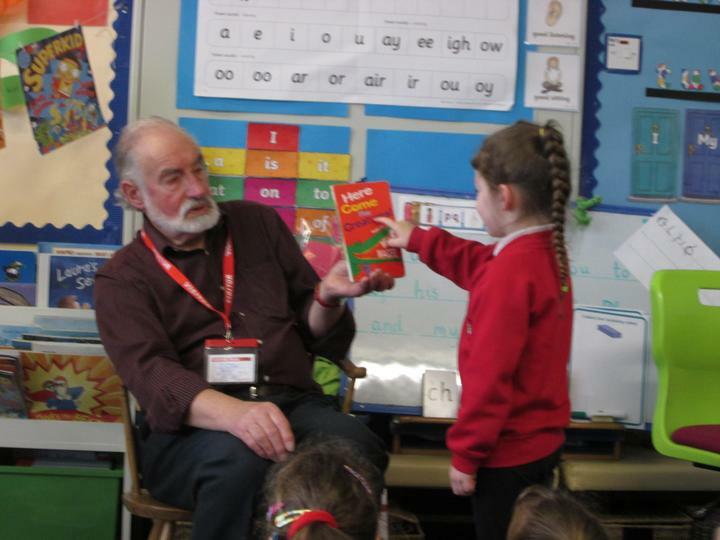 He shared poems and stories with us that he had written. 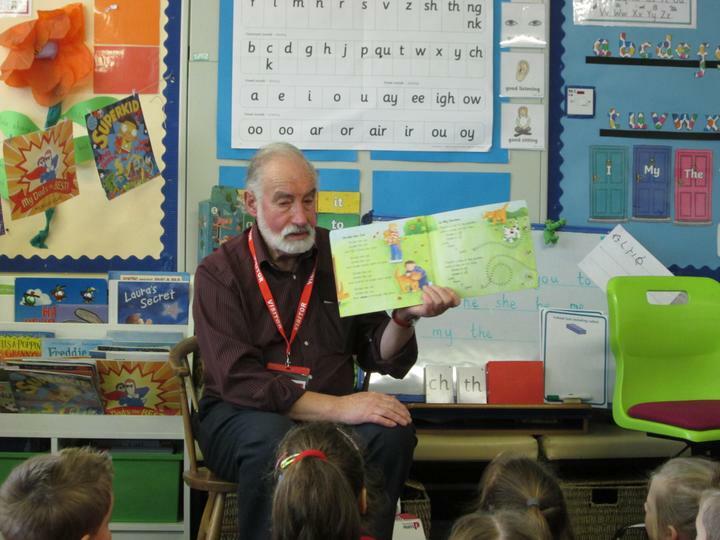 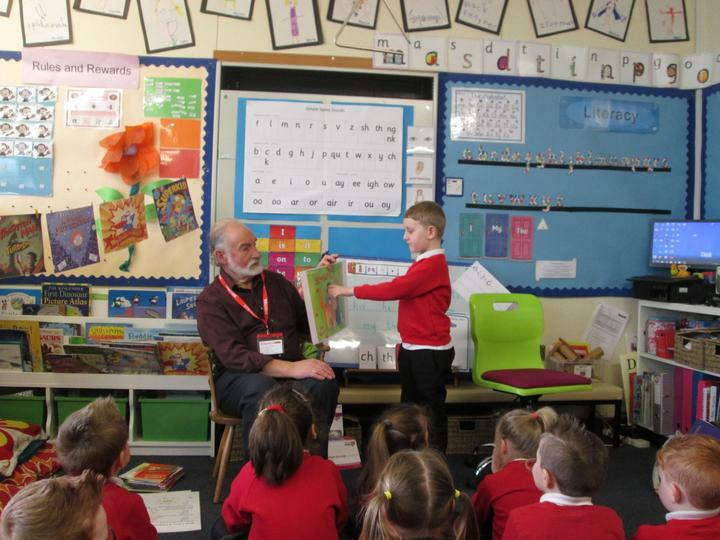 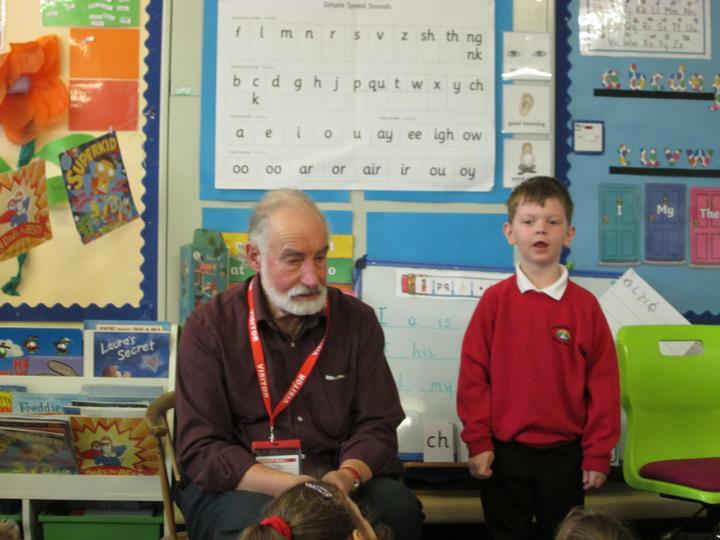 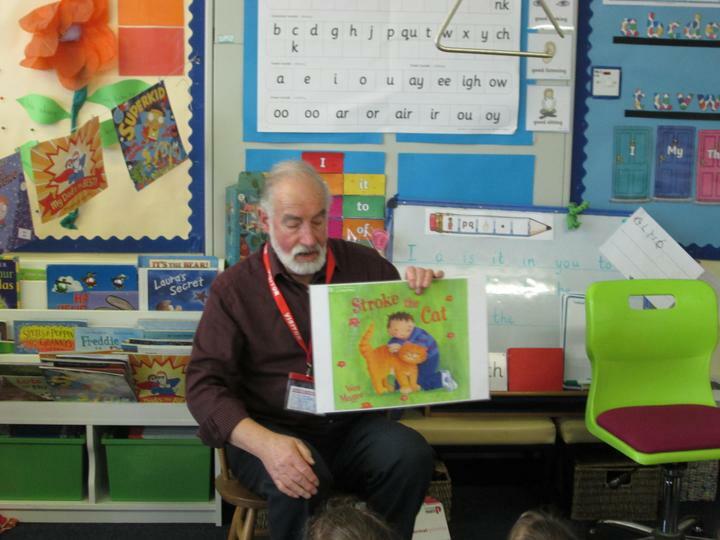 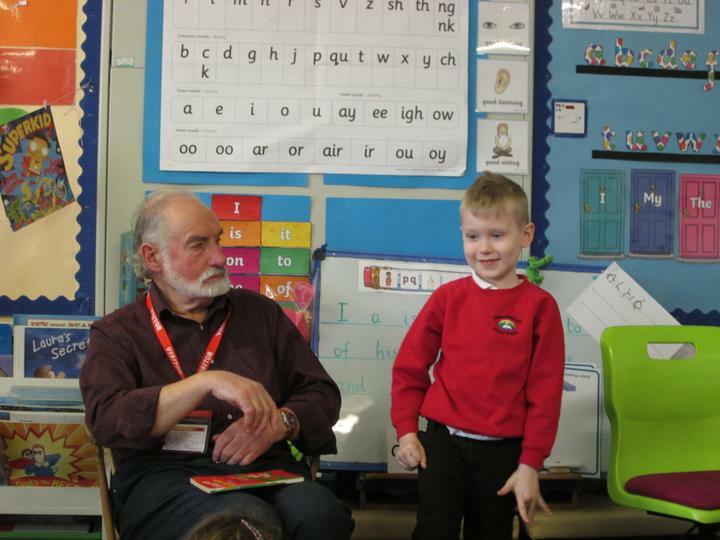 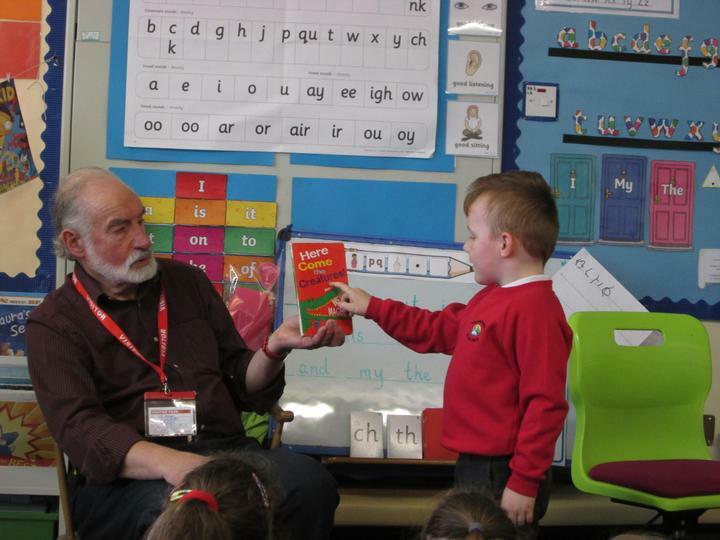 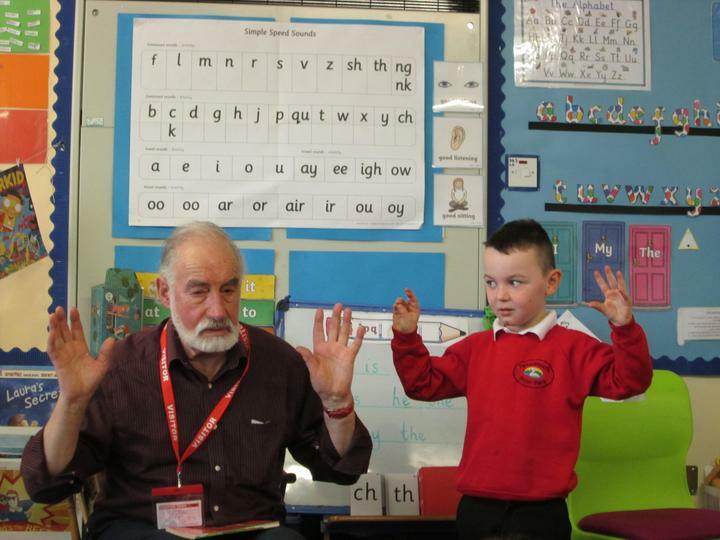 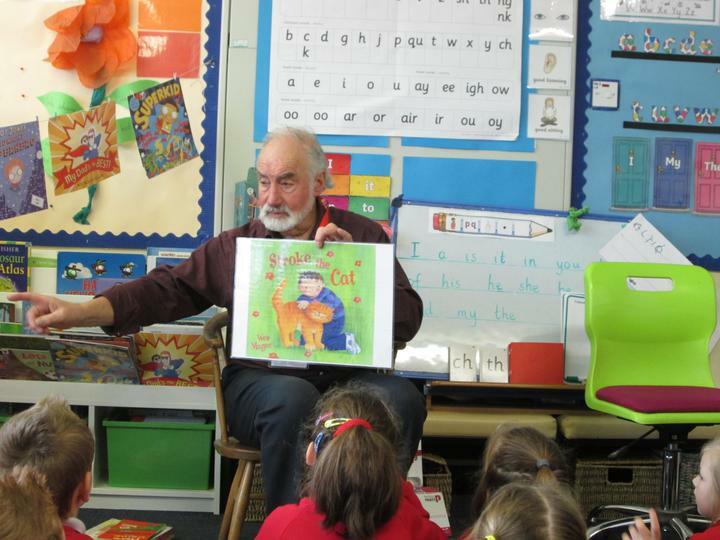 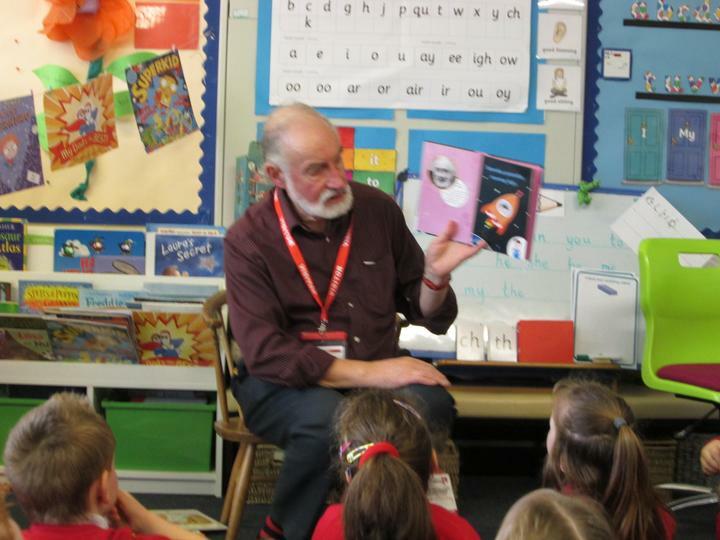 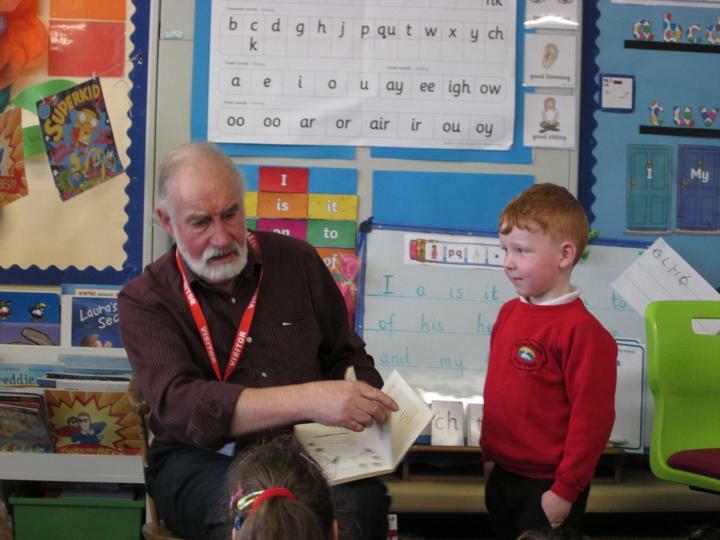 We learnt some his poems and we loved hearing his stories. 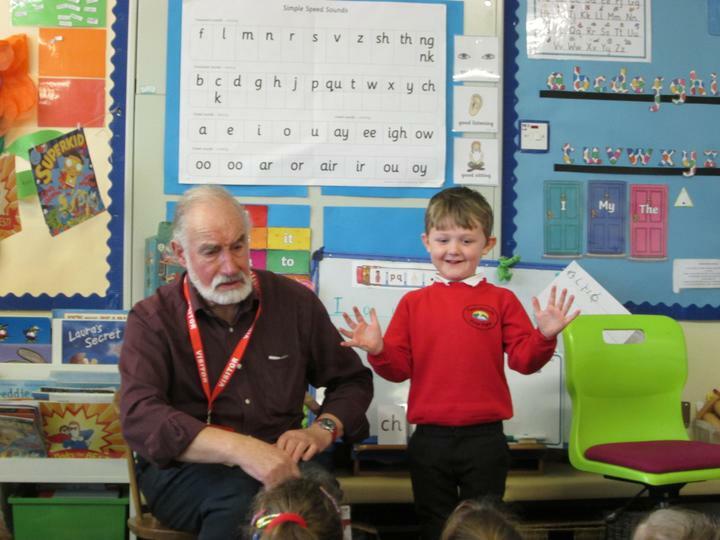 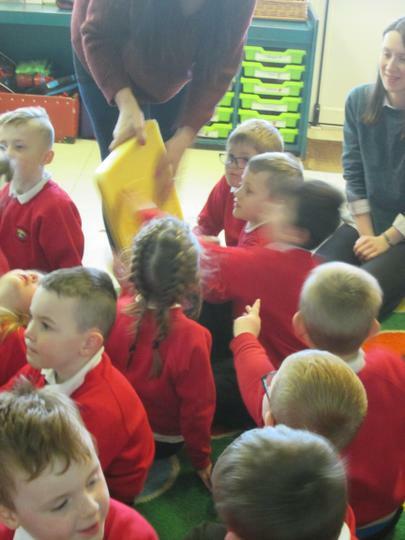 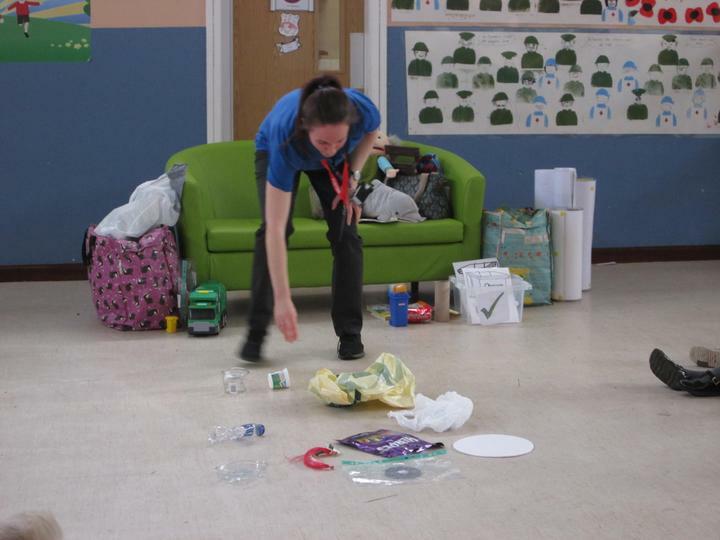 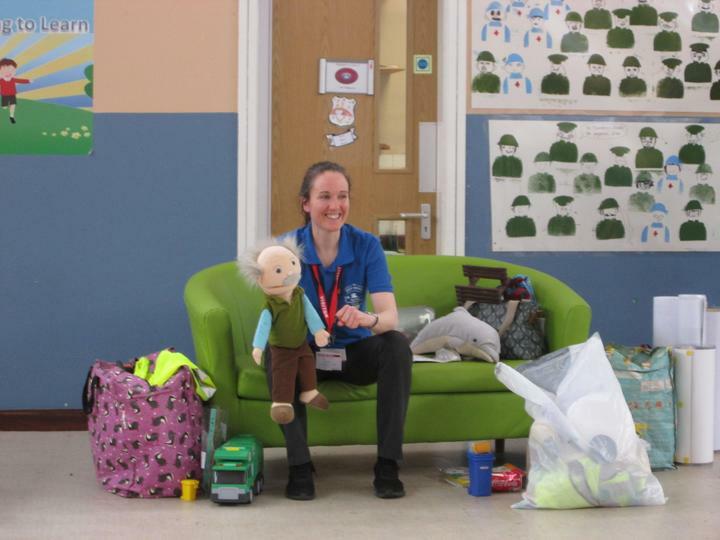 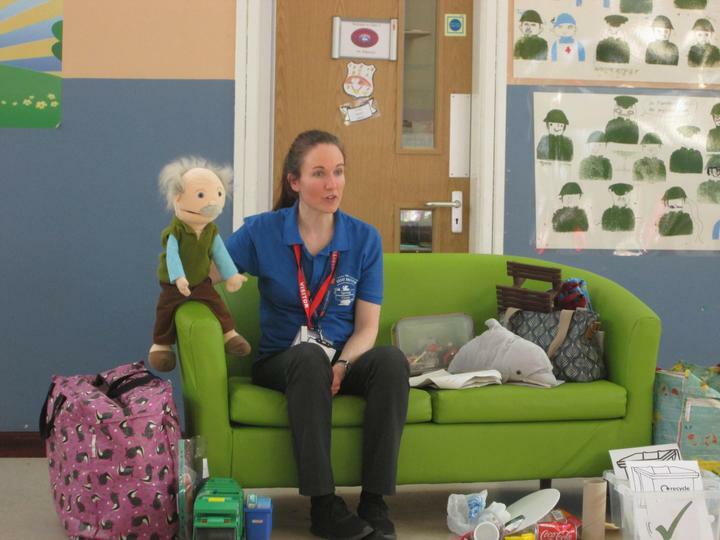 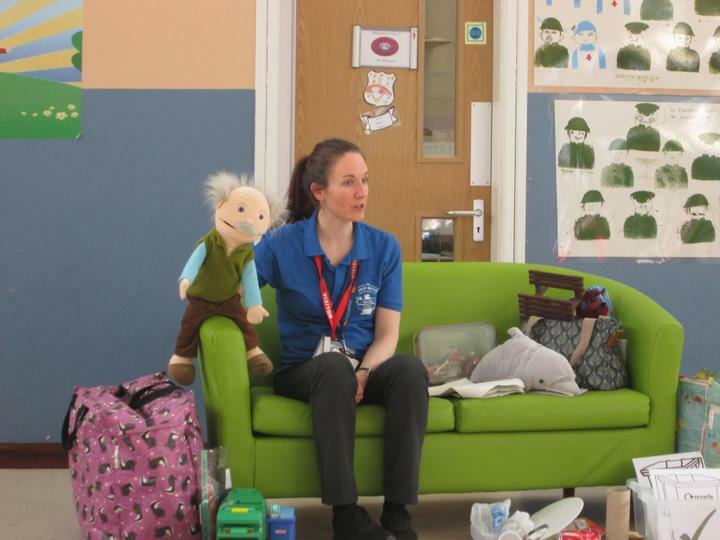 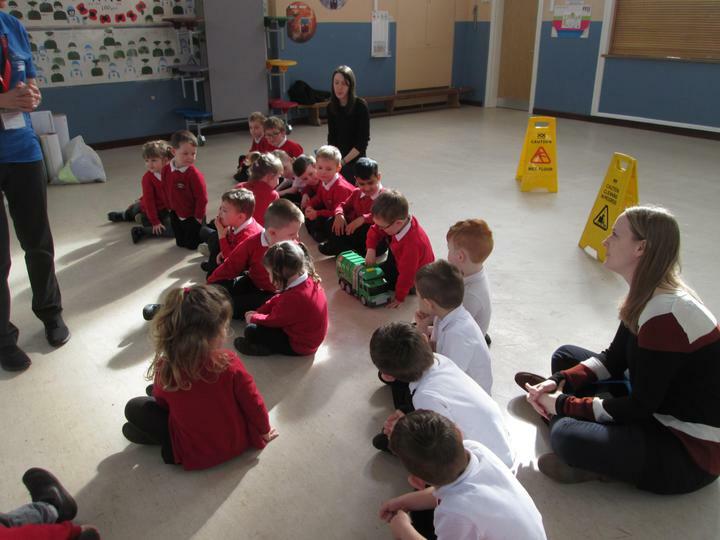 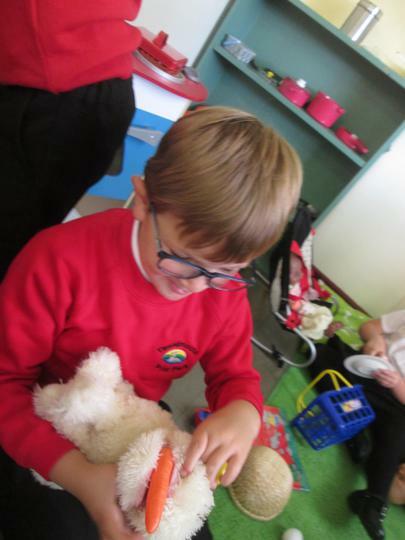 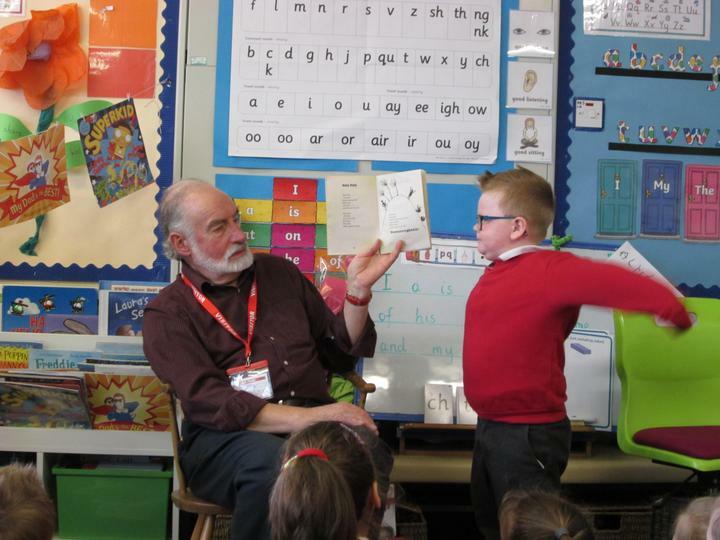 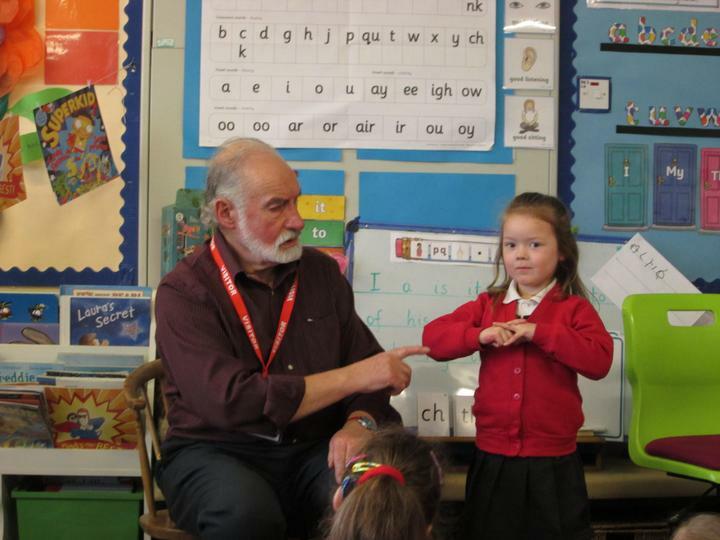 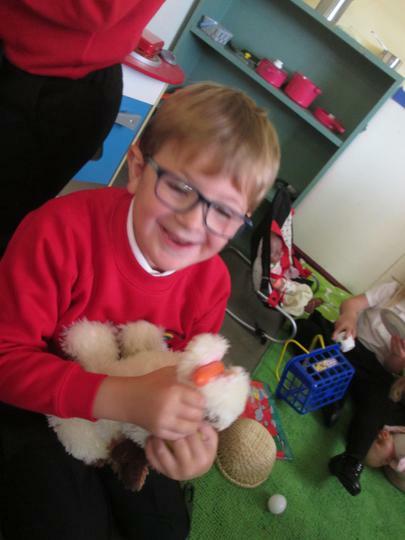 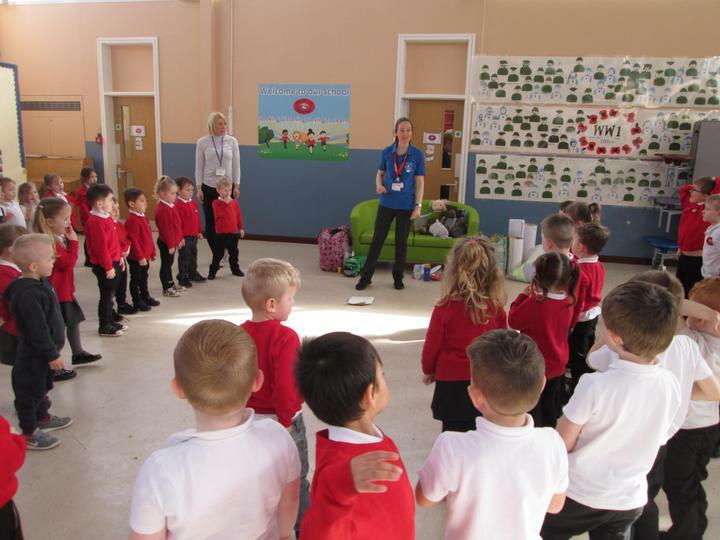 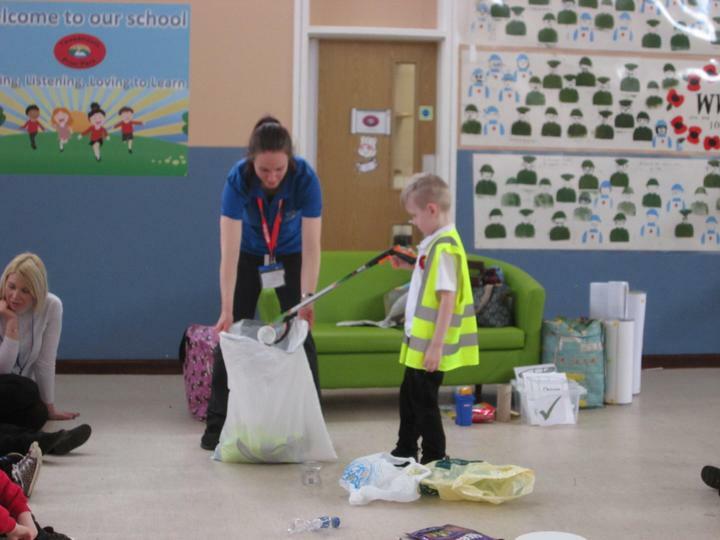 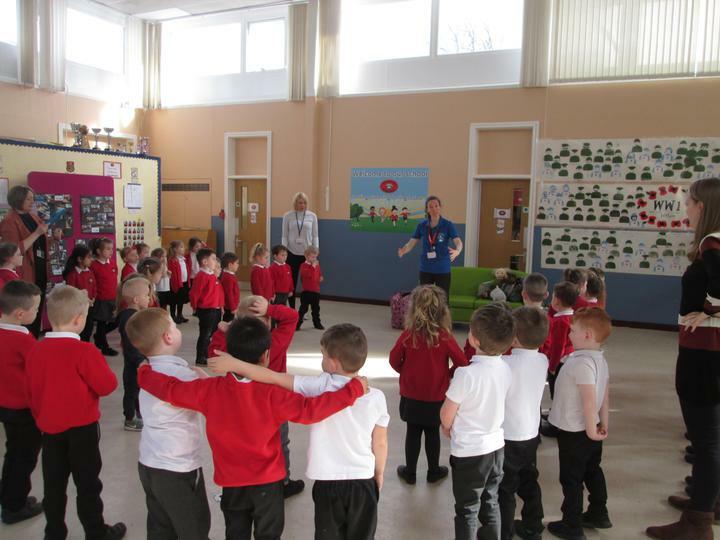 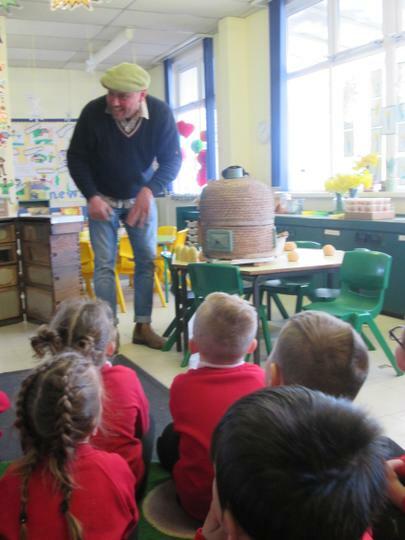 We took part in a recycling workshop and with help of Grandpa the recycling puppet, we learnt all about what we should recycle and what we should not. 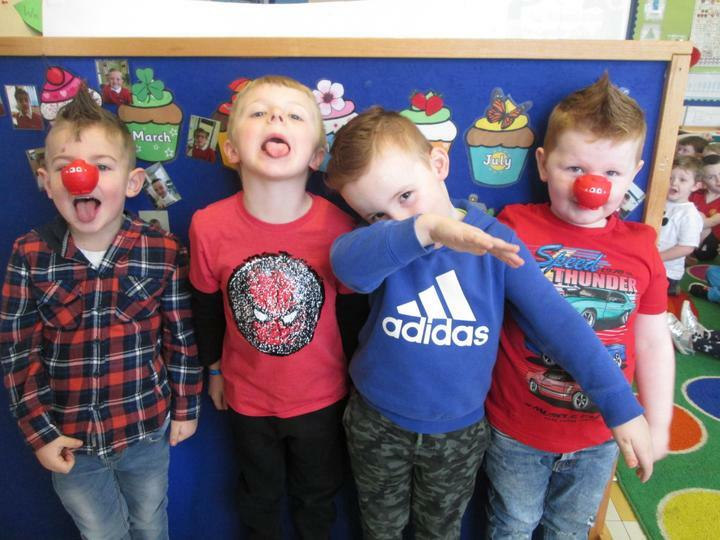 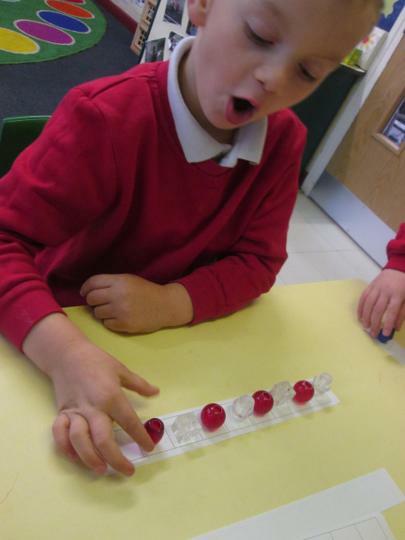 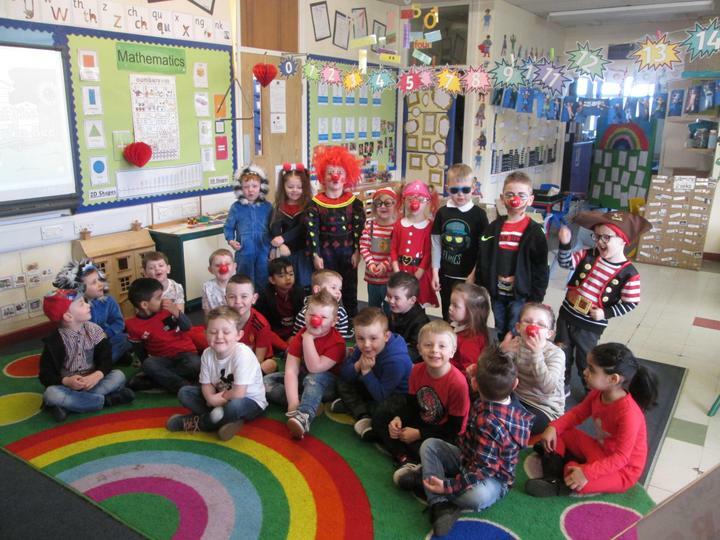 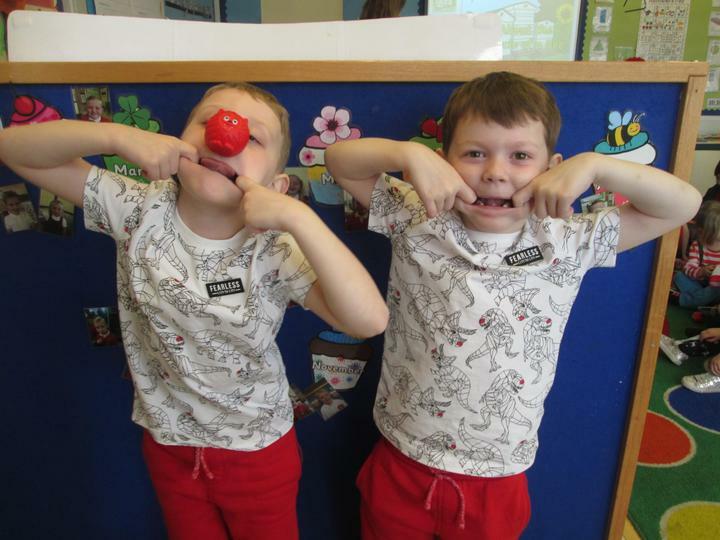 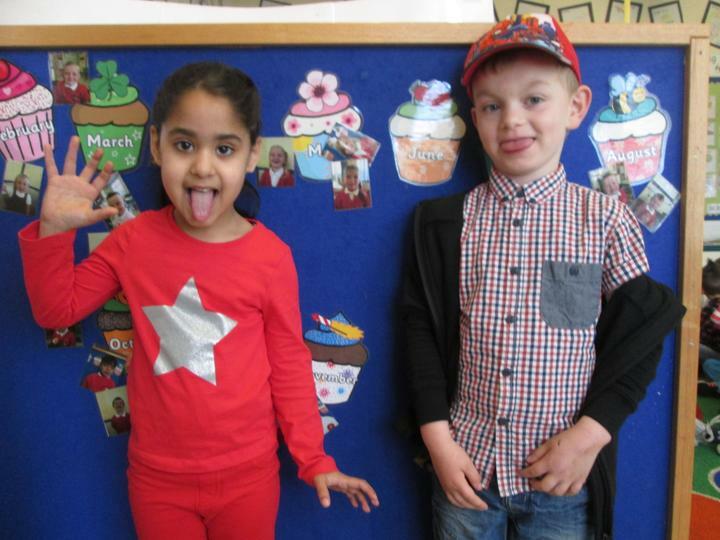 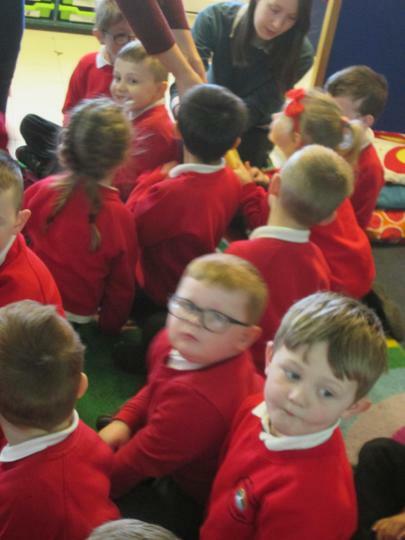 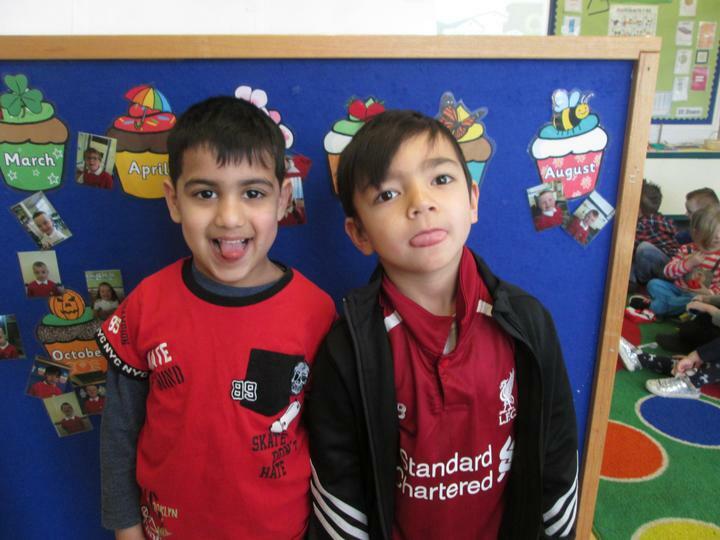 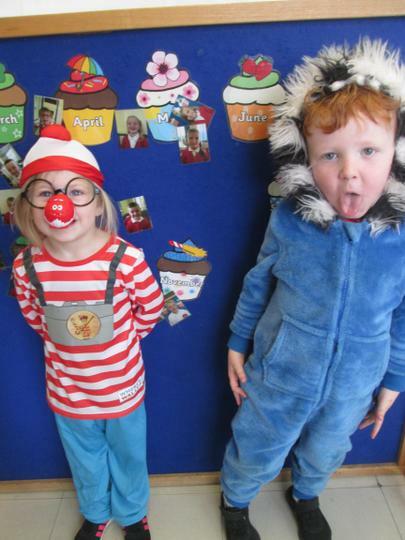 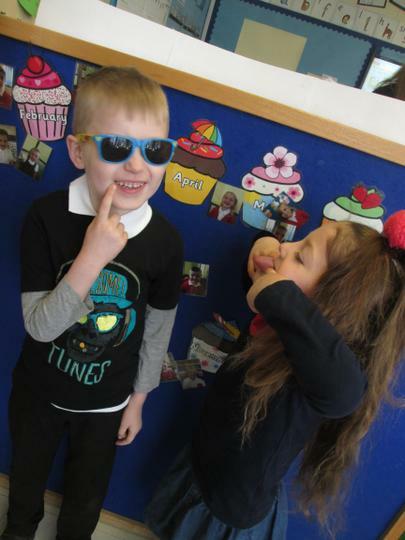 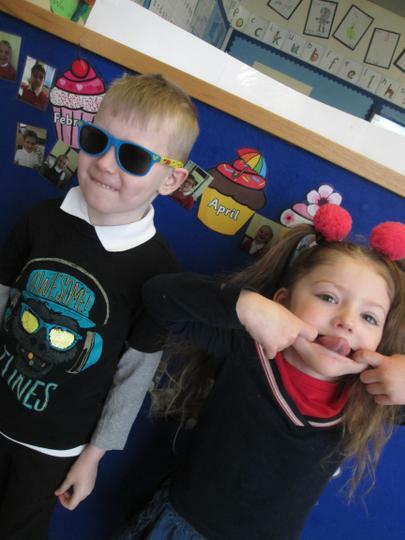 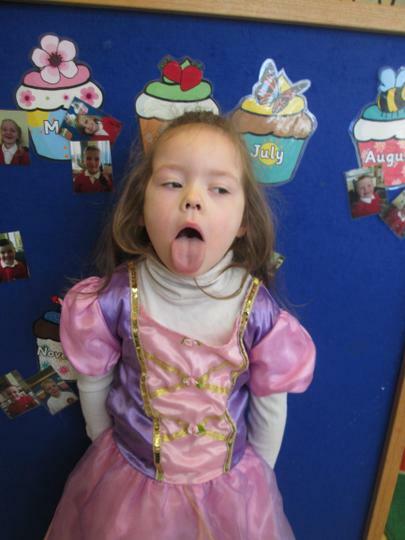 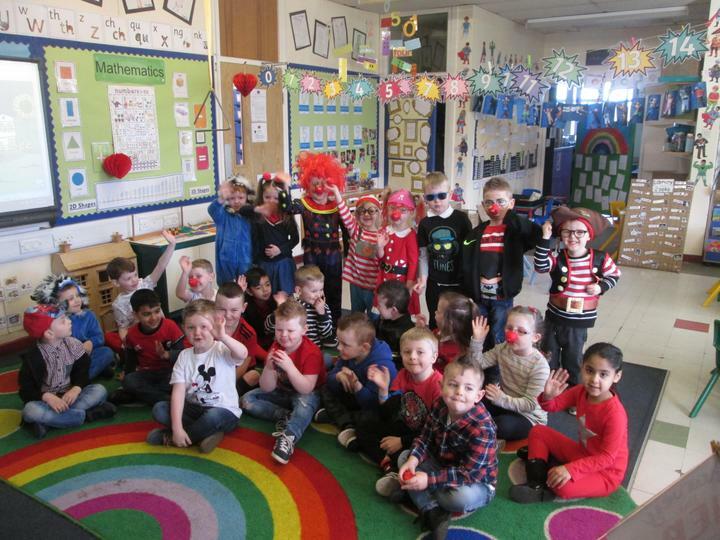 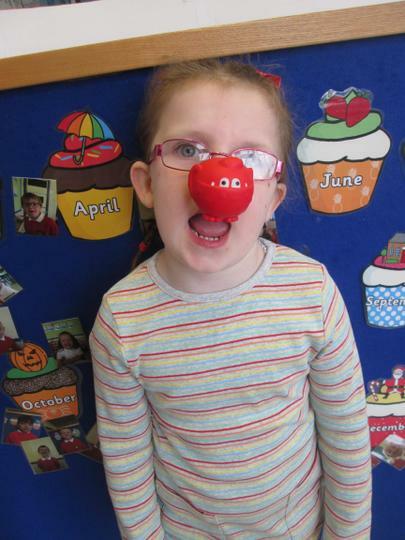 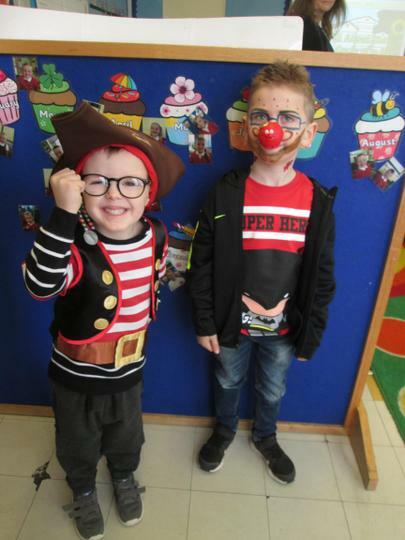 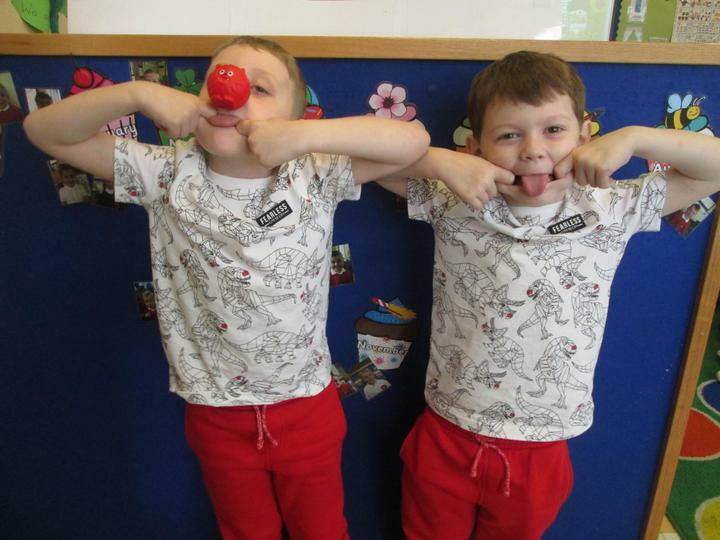 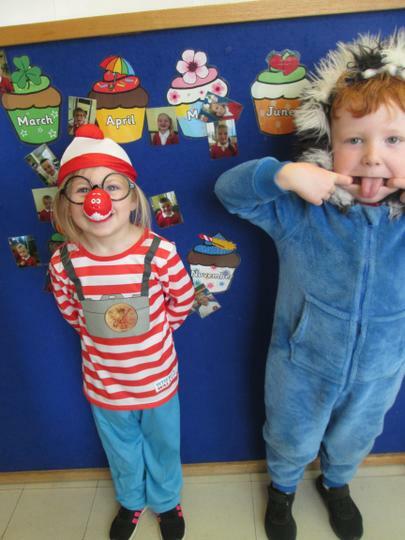 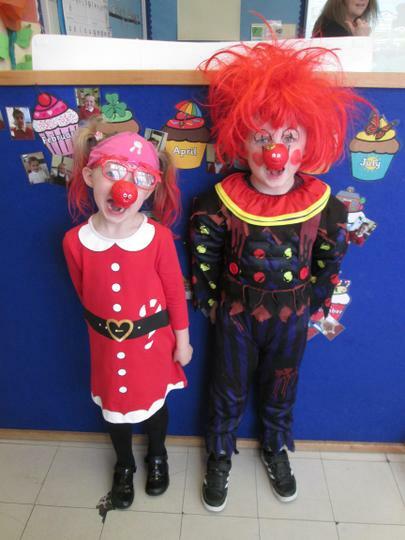 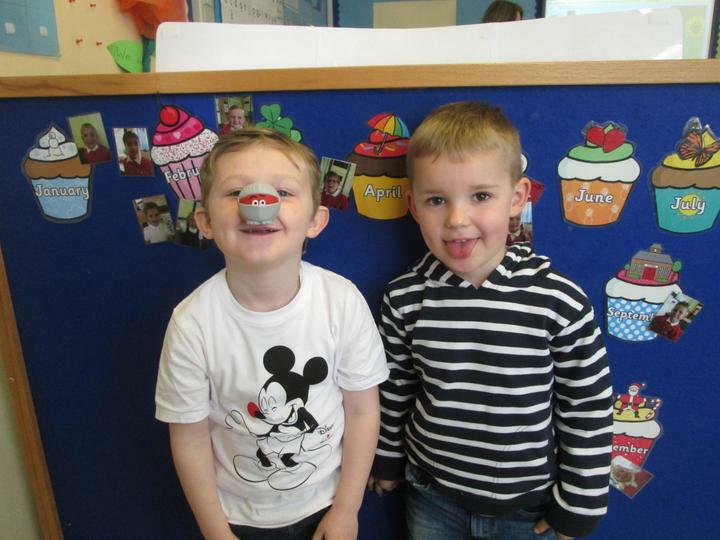 We have had great fun taking part in Red Nose Day and making funny faces in our funny outfits. 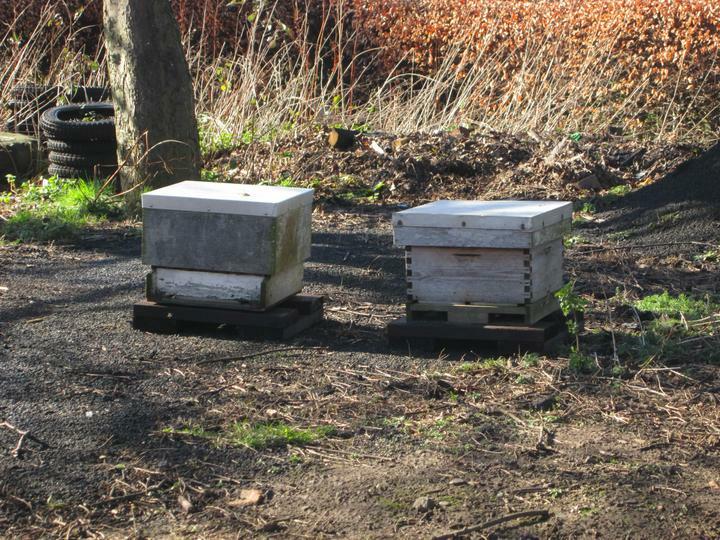 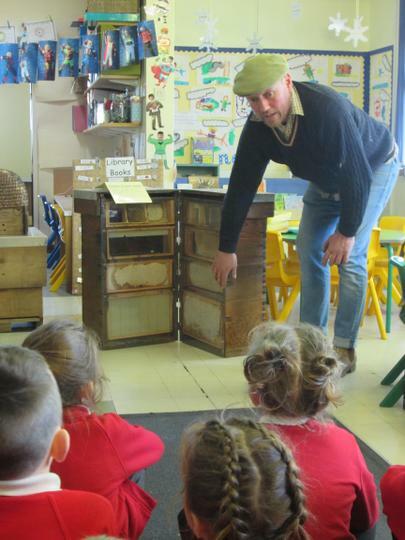 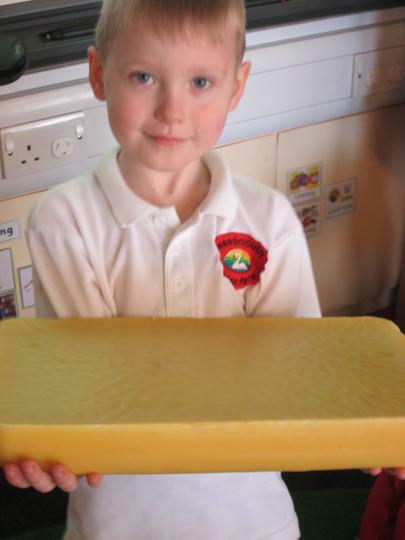 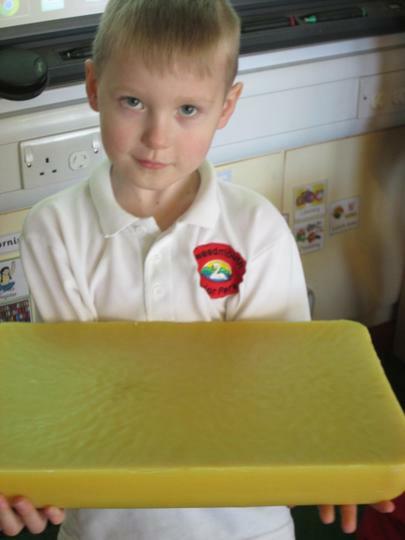 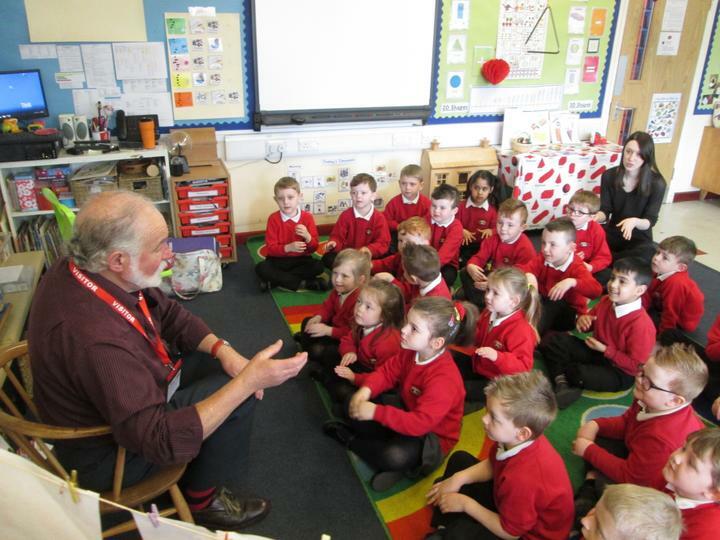 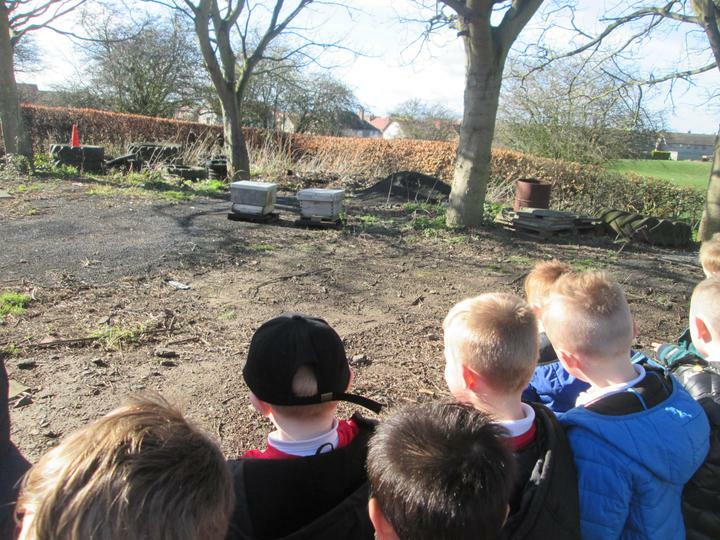 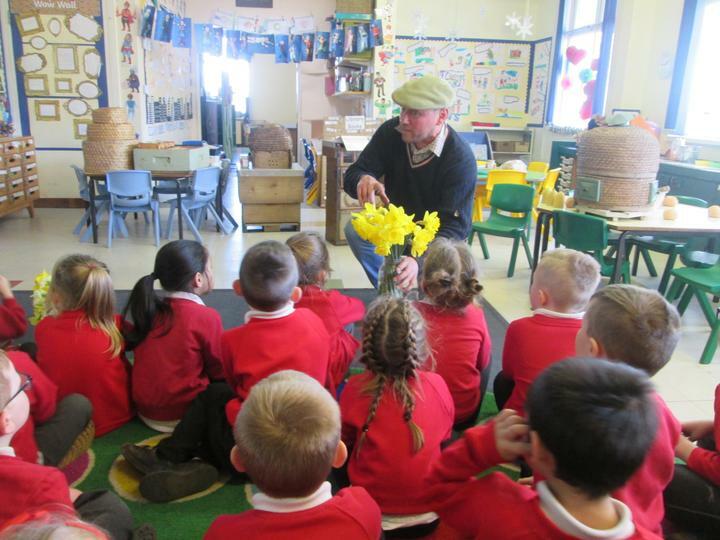 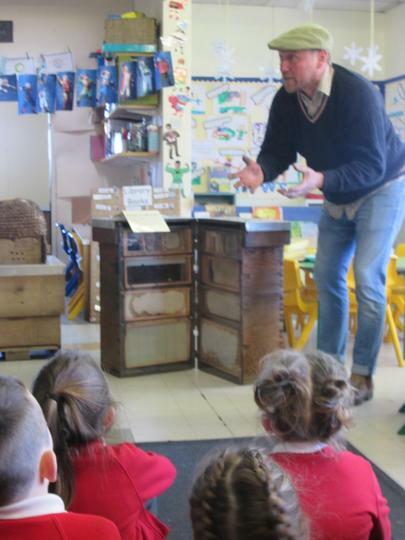 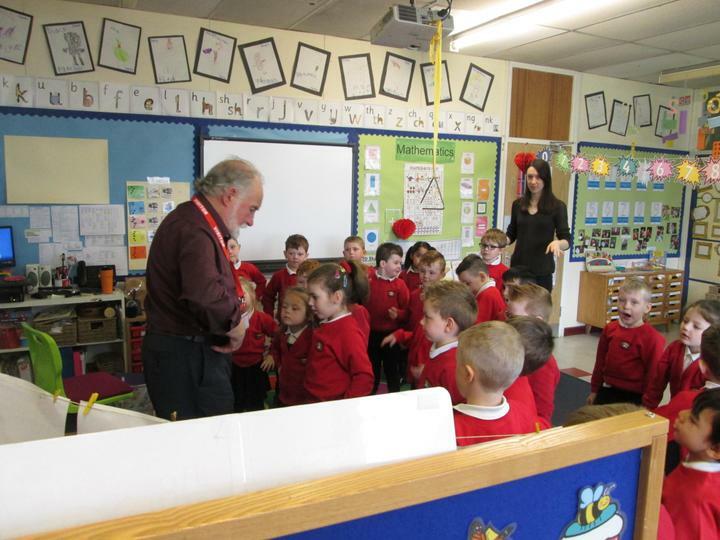 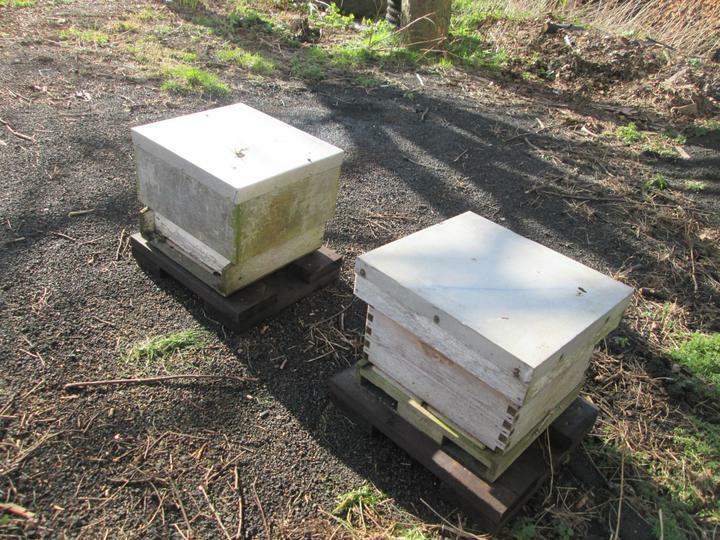 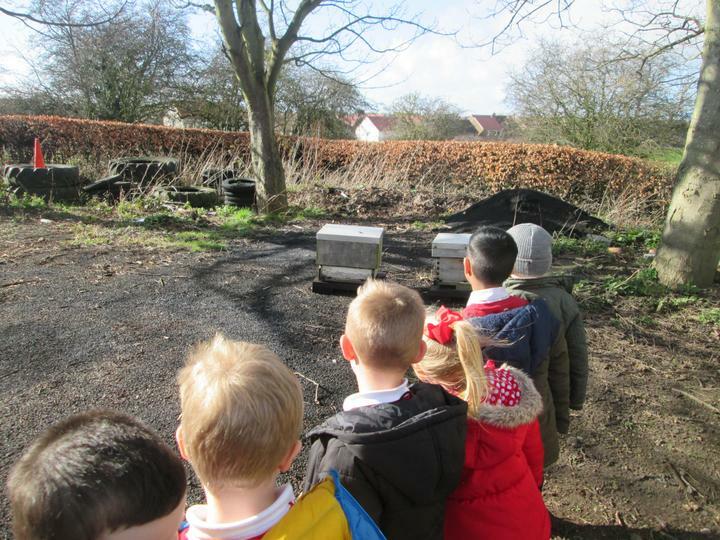 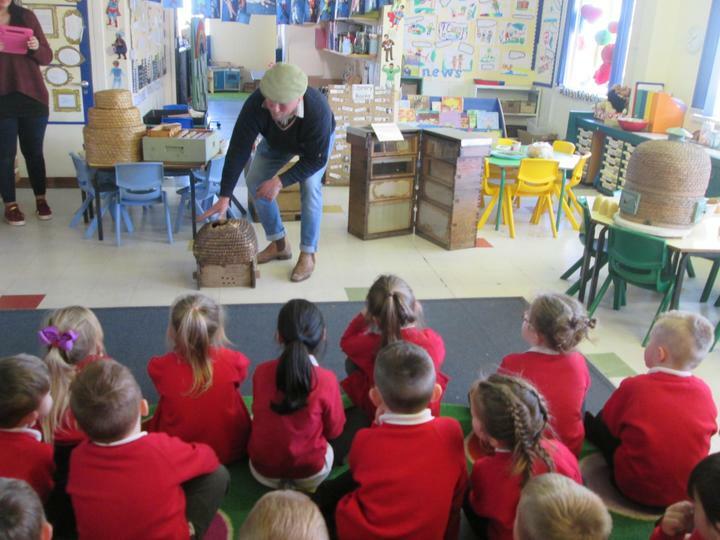 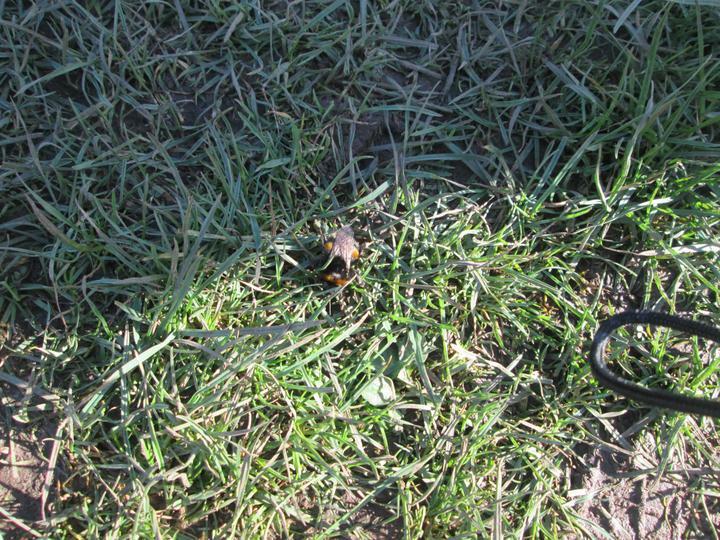 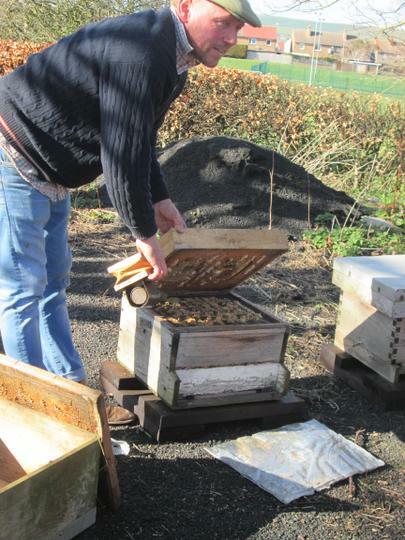 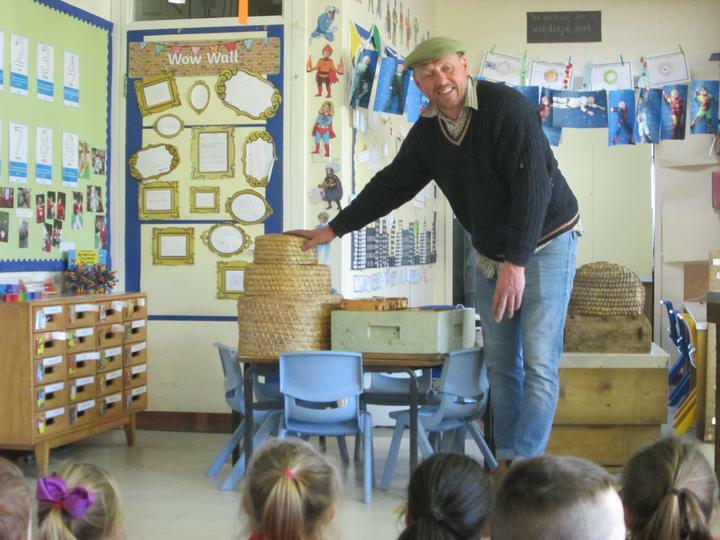 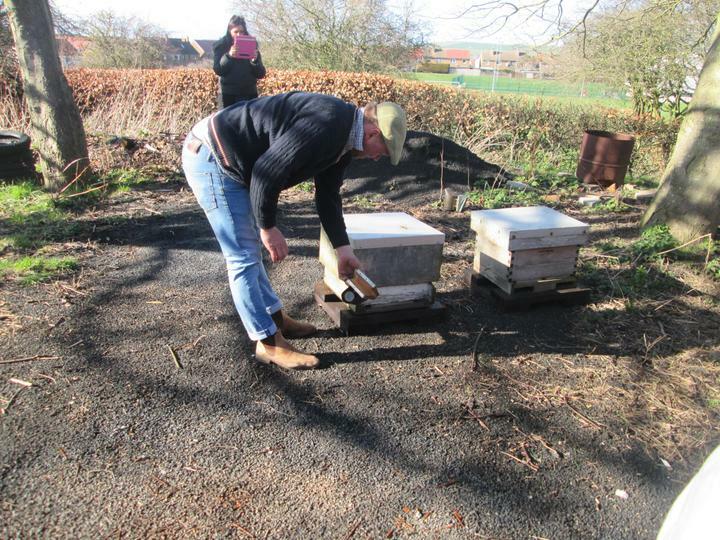 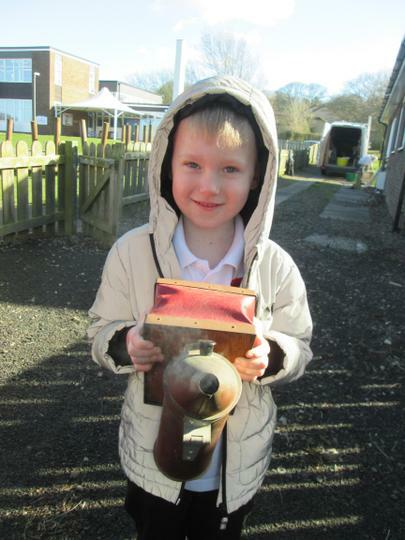 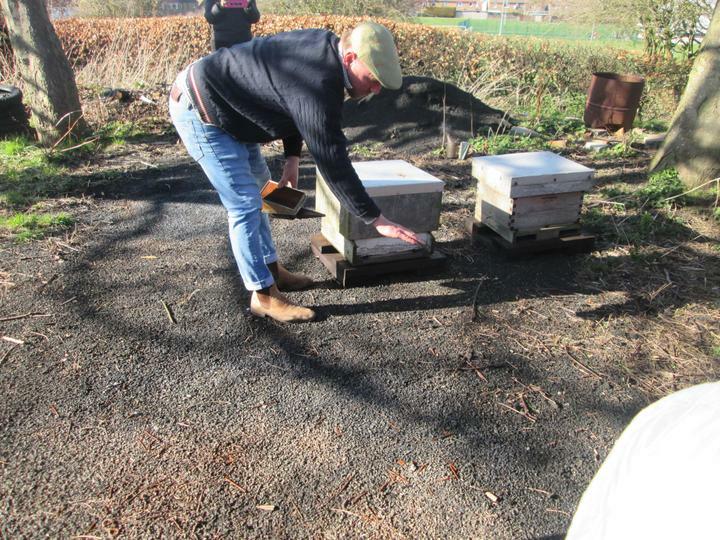 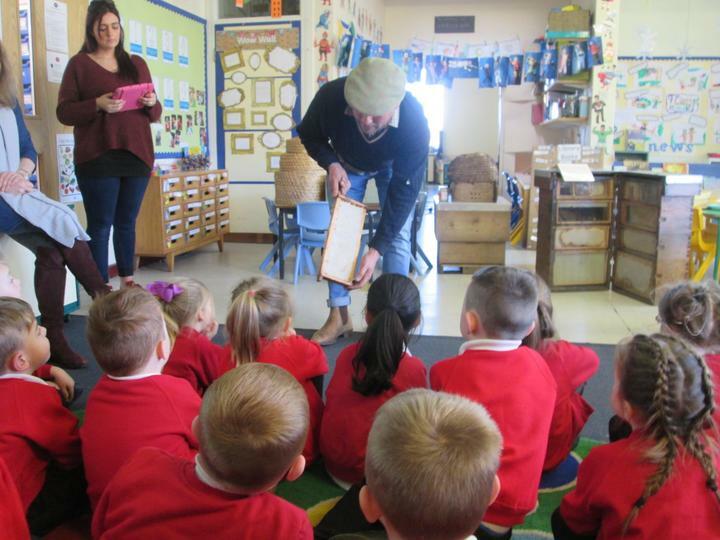 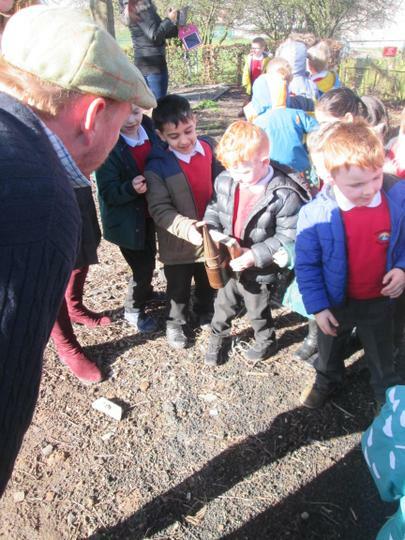 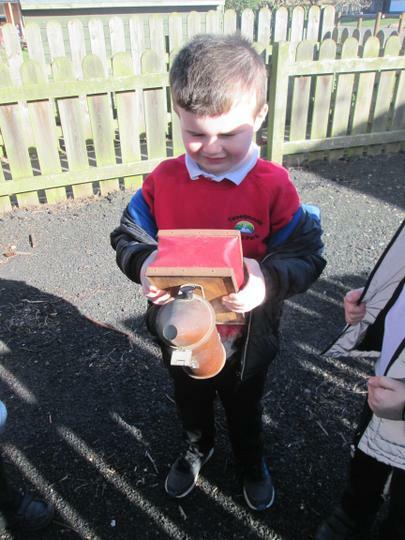 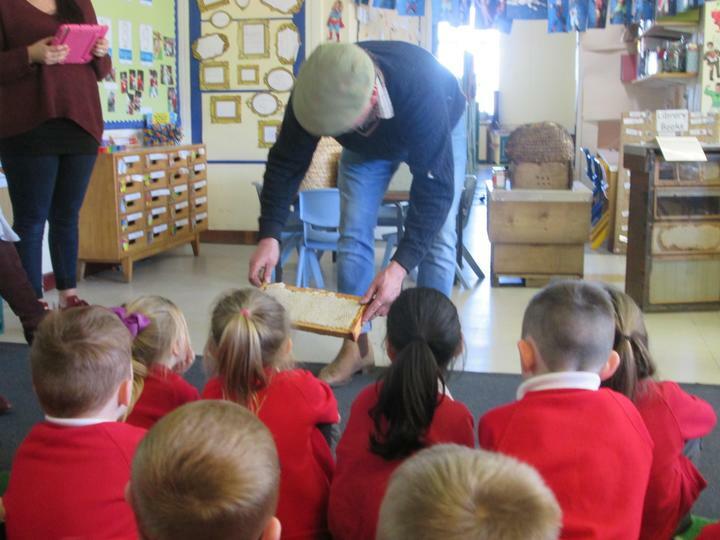 We had a visit from a beekeeper and we learnt all about bees and how honey is made. 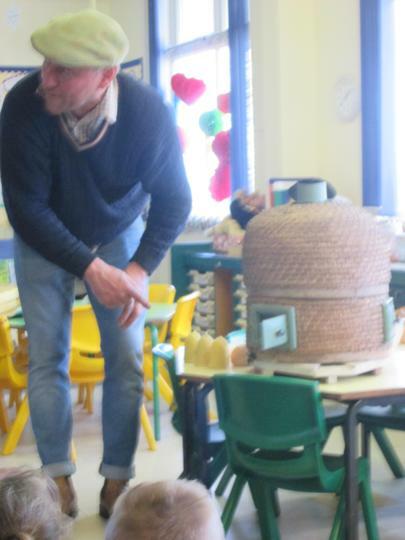 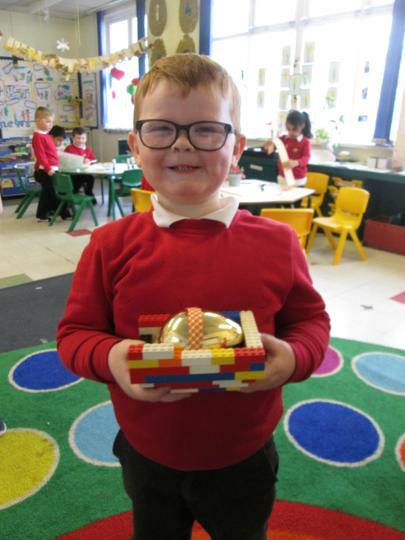 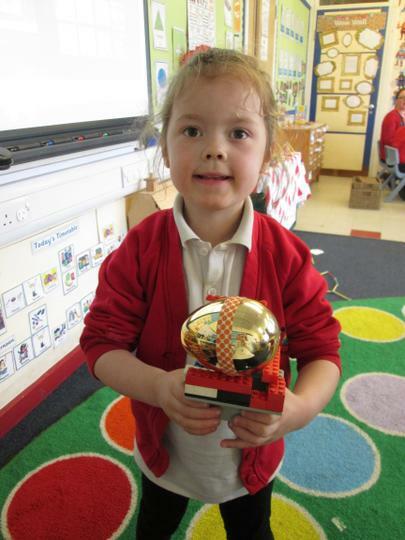 We all took honey home to share with our families and we all think it is delicious. 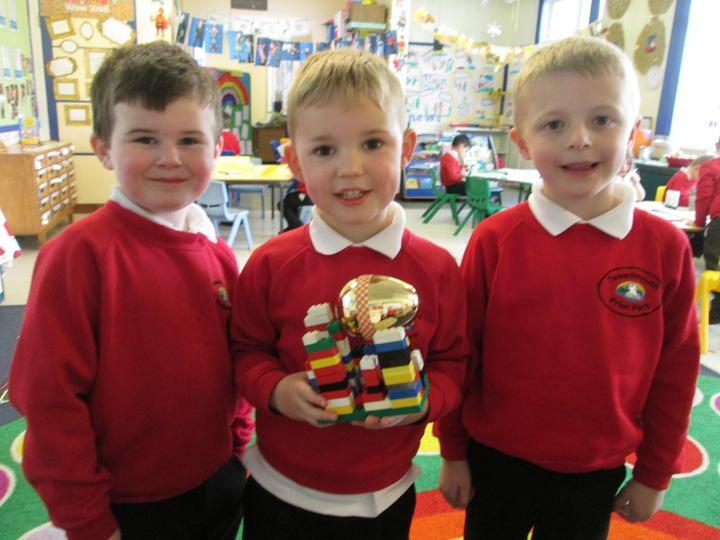 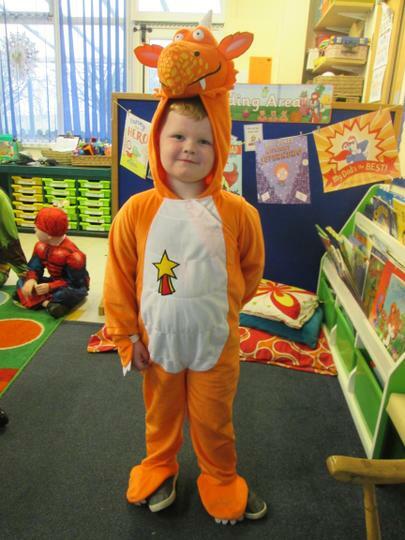 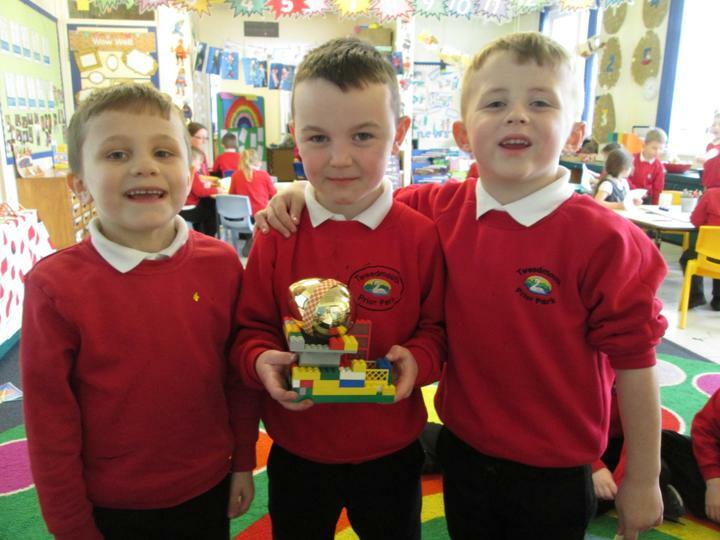 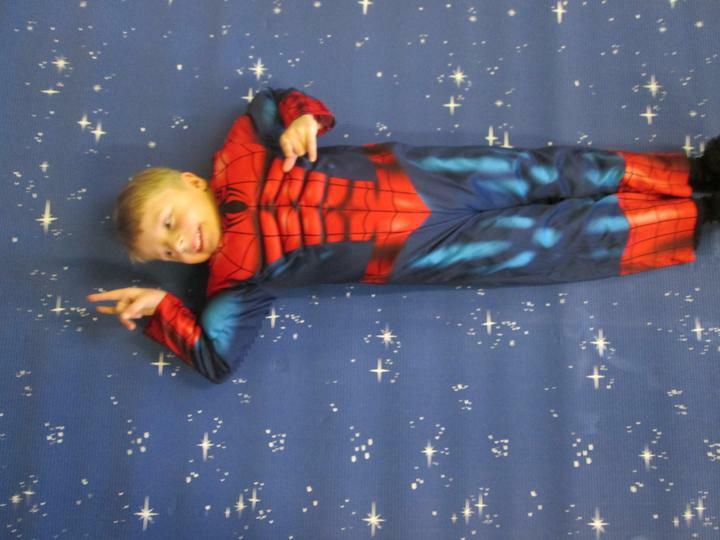 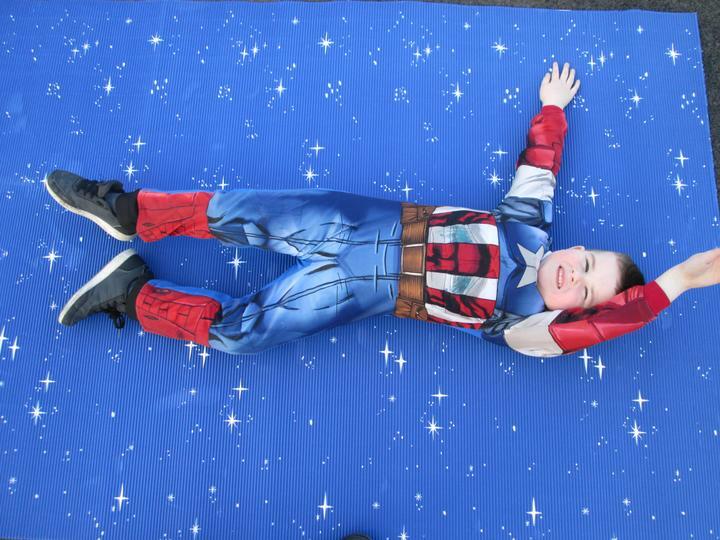 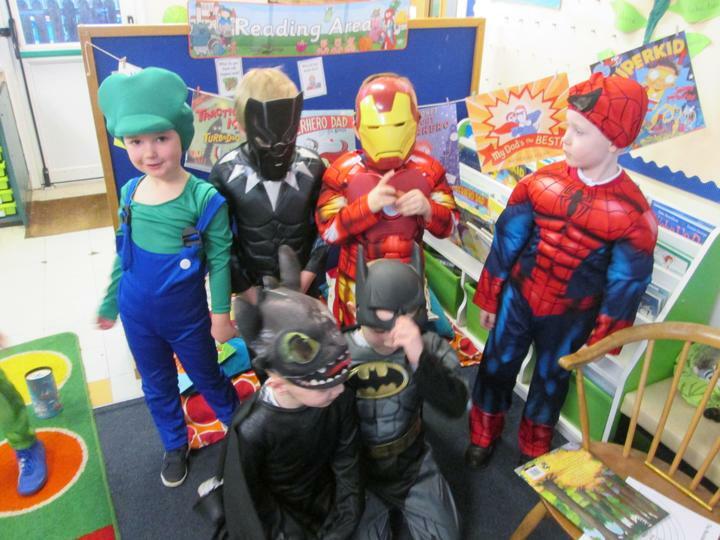 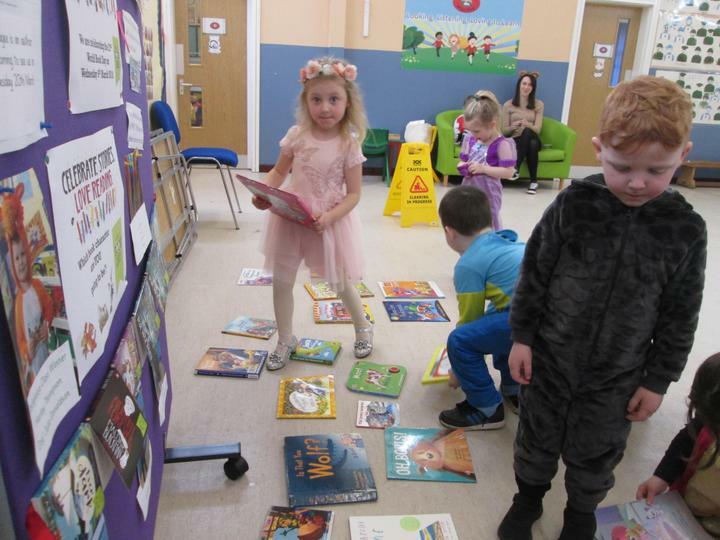 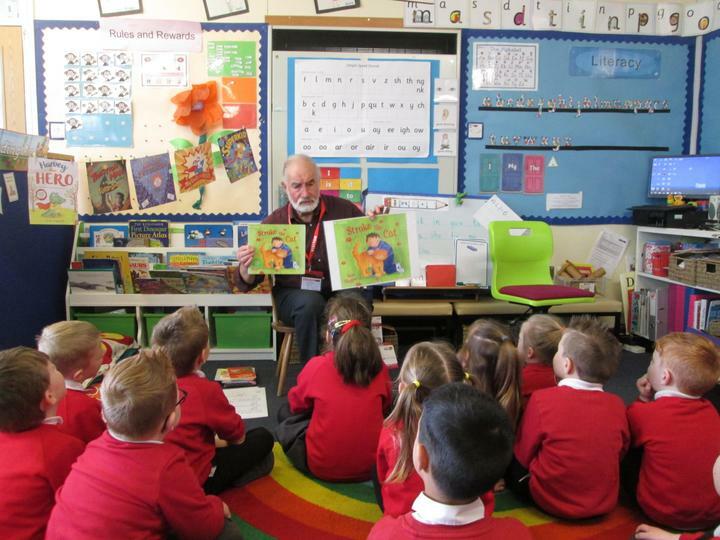 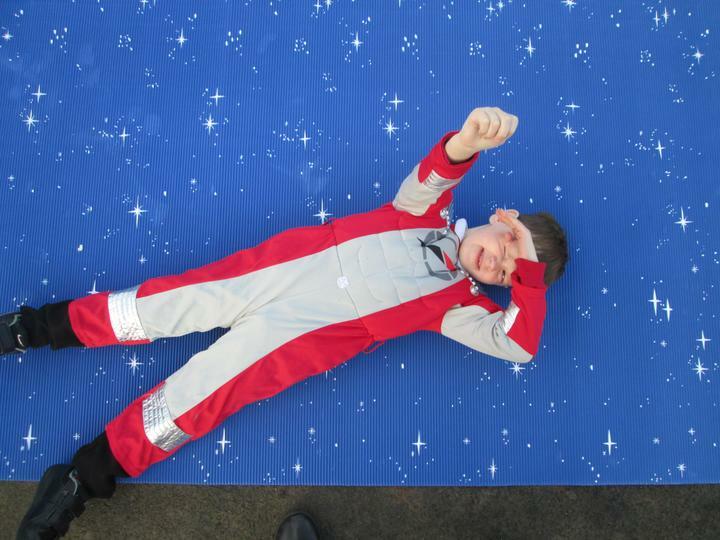 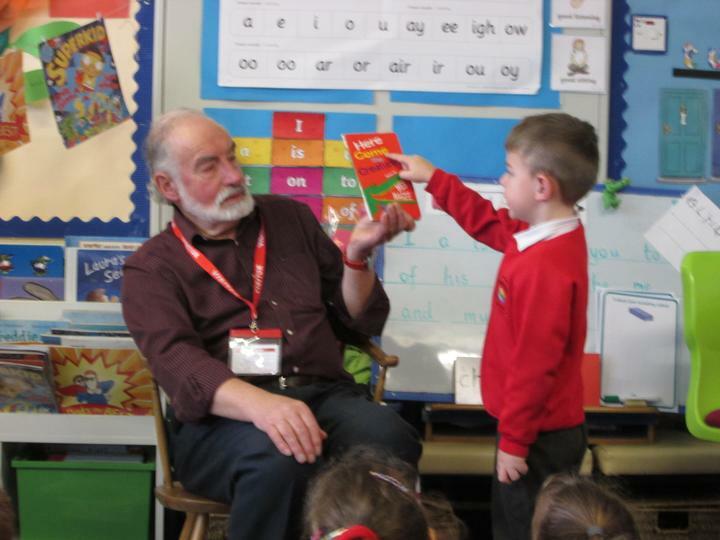 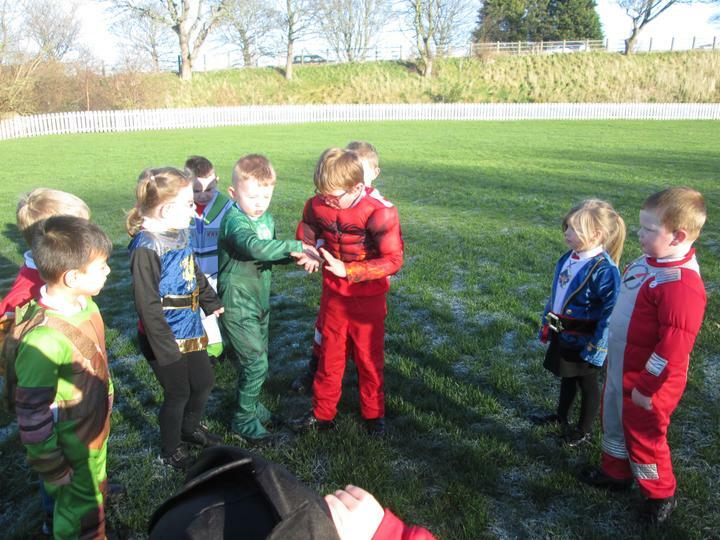 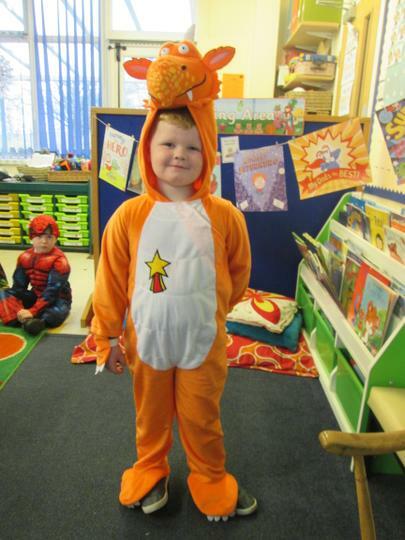 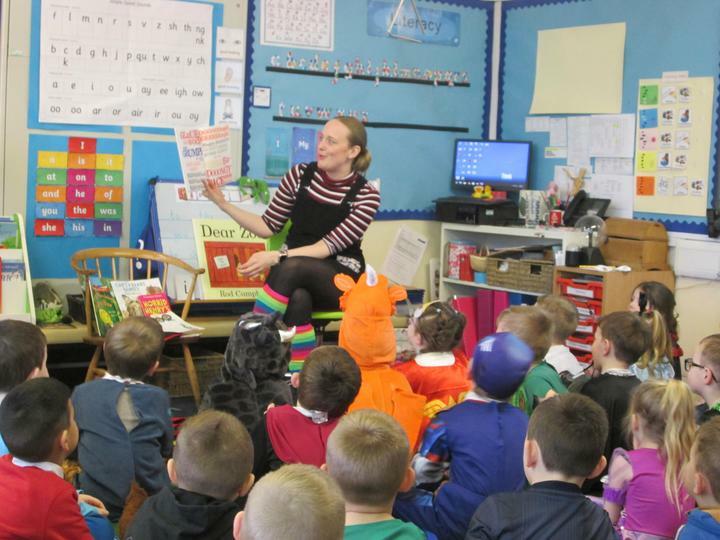 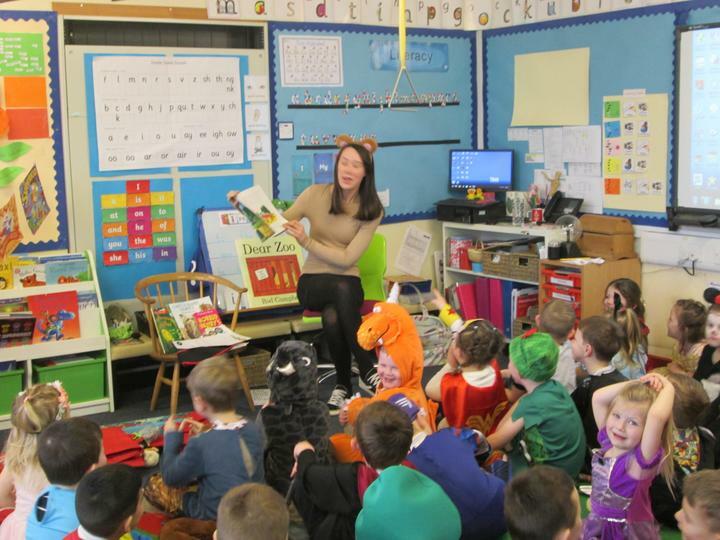 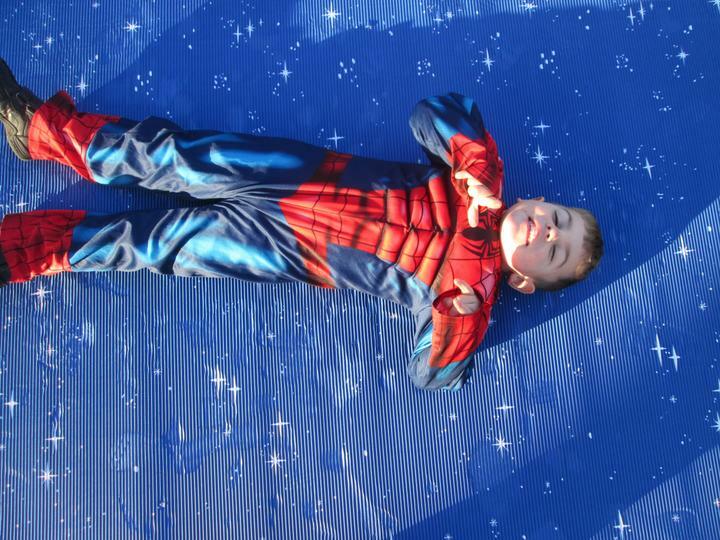 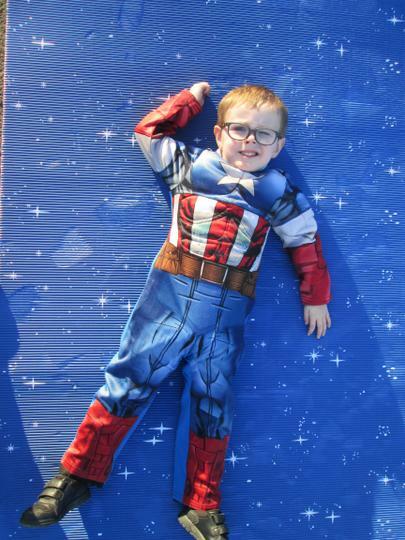 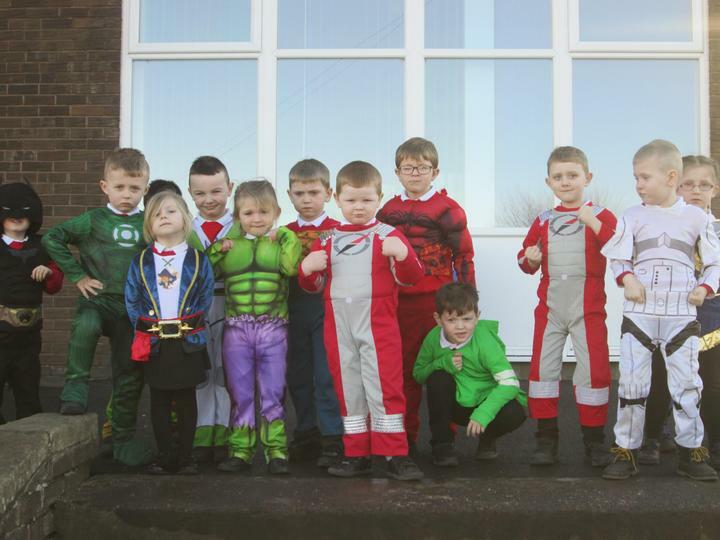 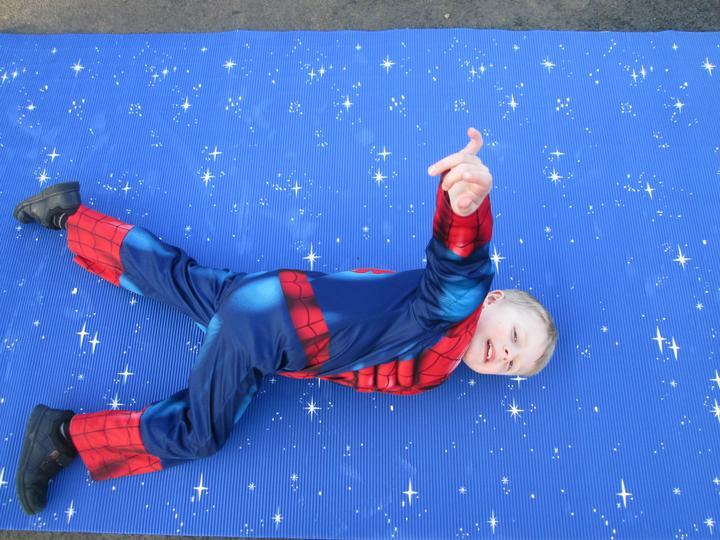 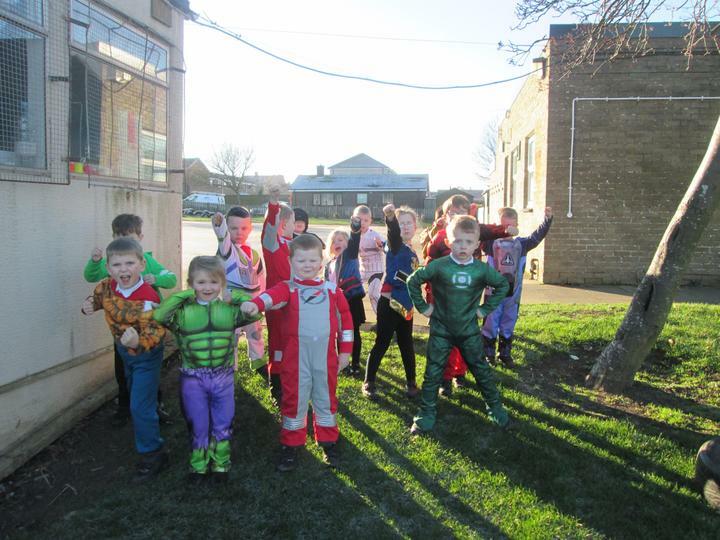 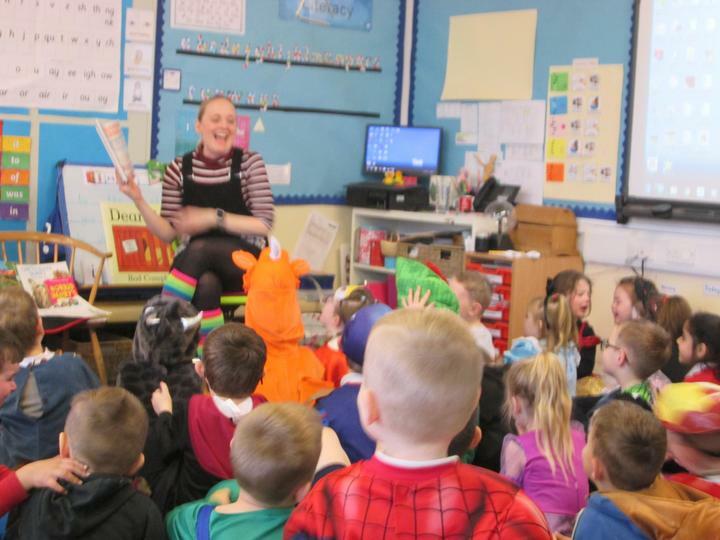 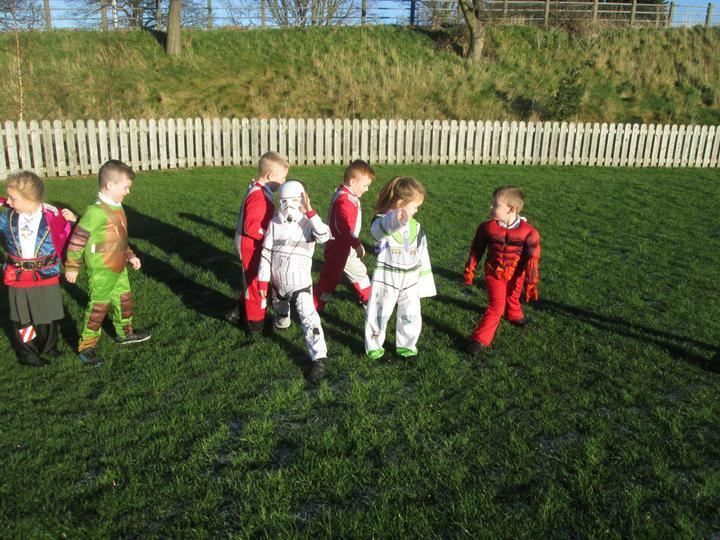 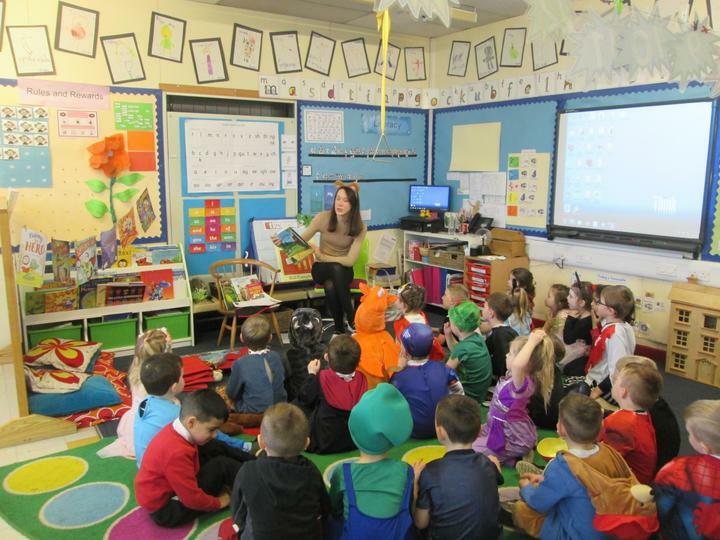 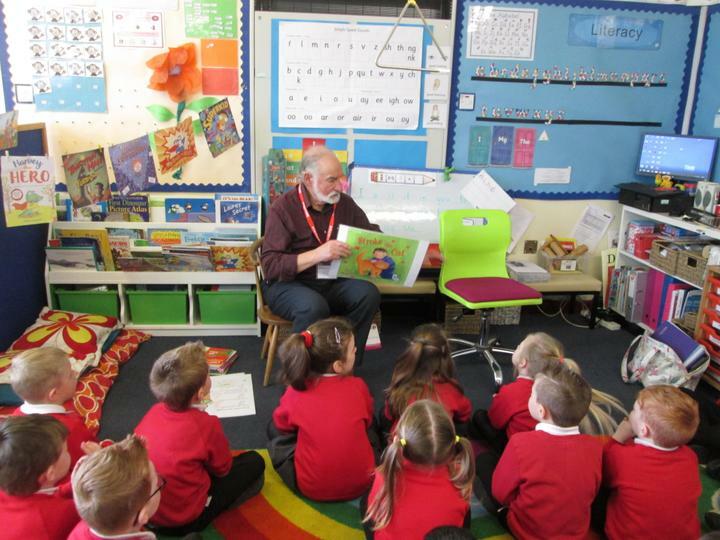 The 22nd World Book Day was celebrated in school on Wednesday 6th March. 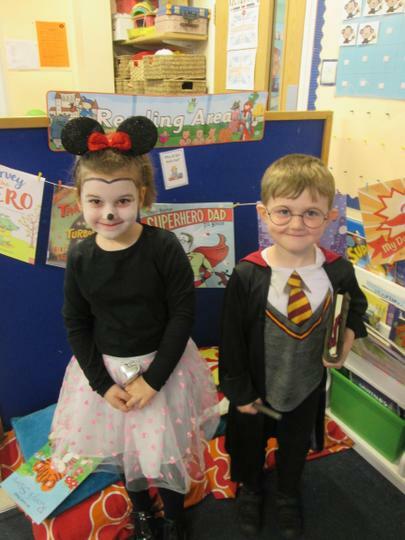 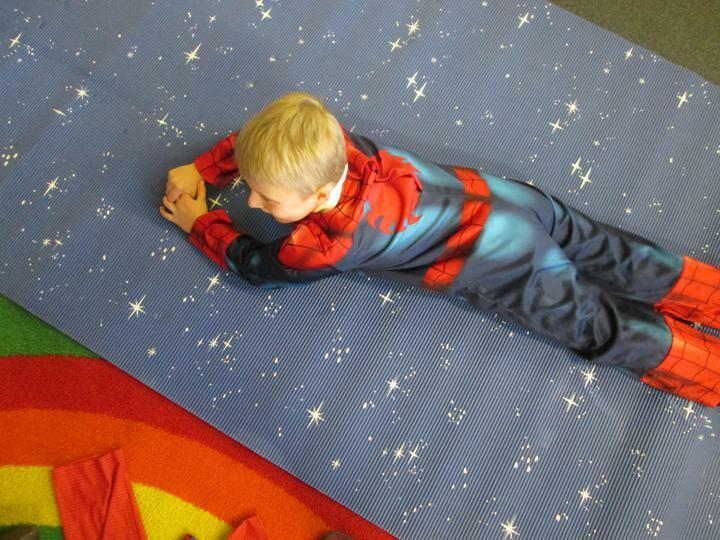 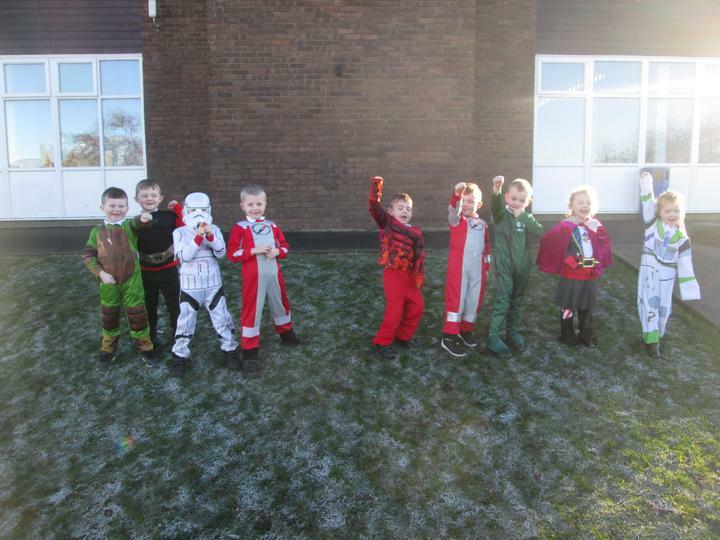 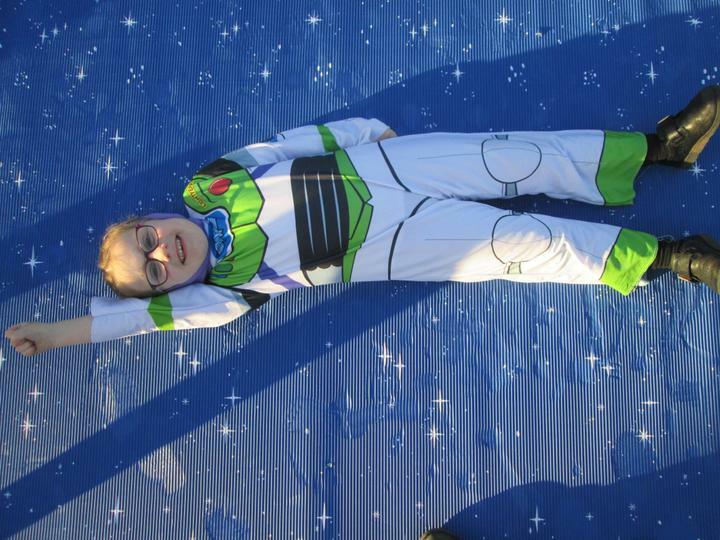 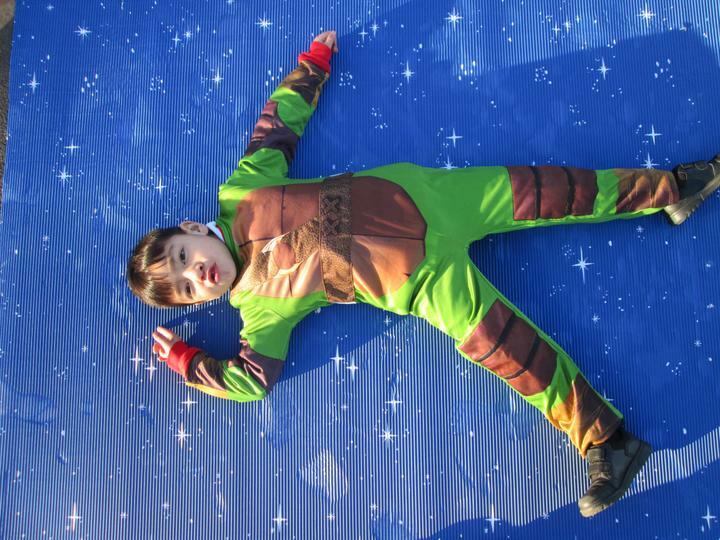 We loved dressing up as our favourite book characters. 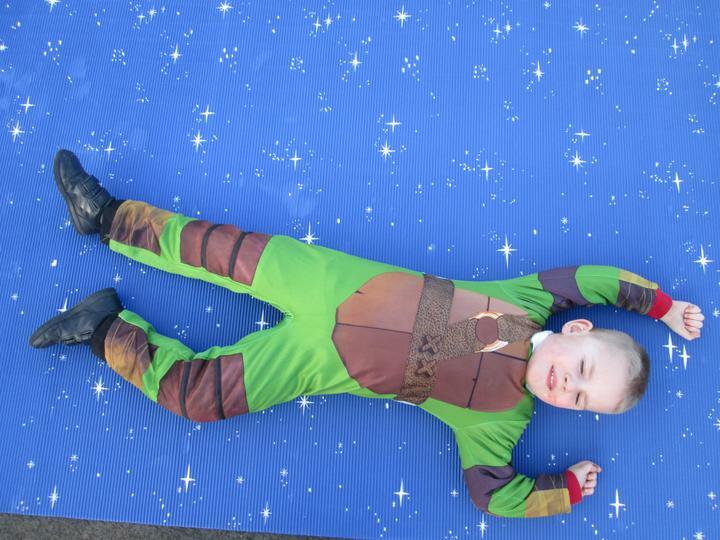 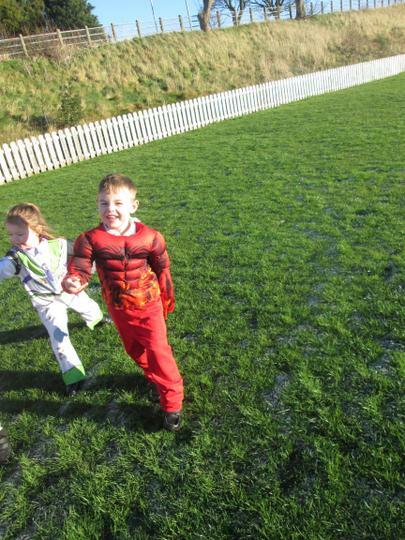 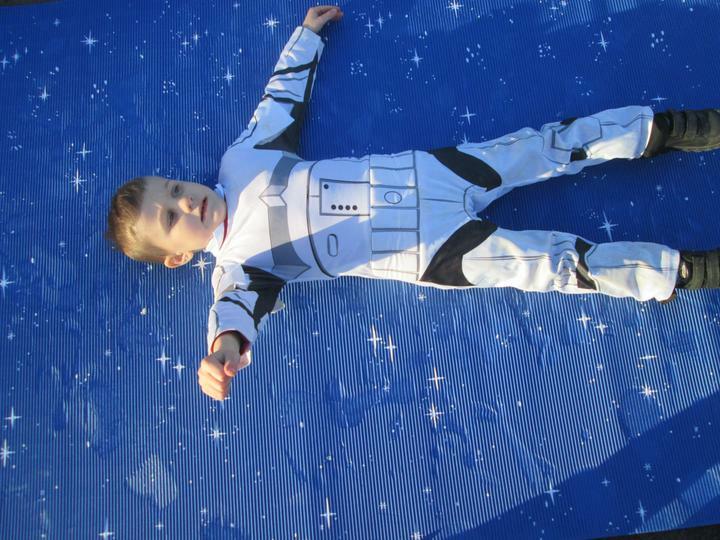 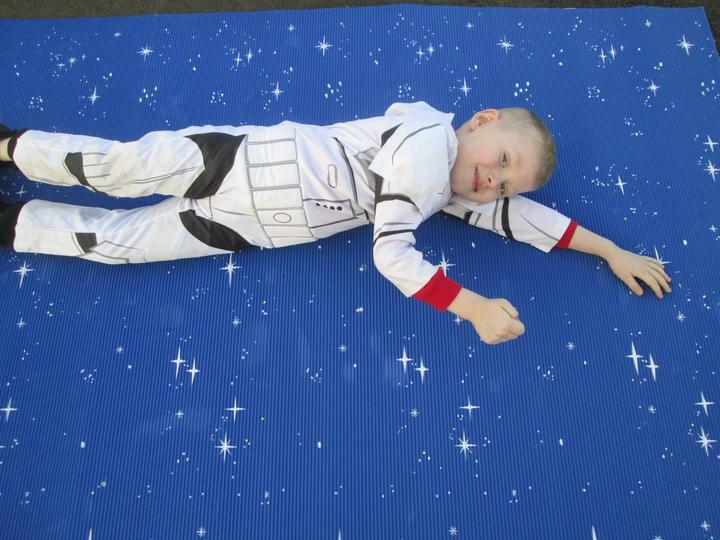 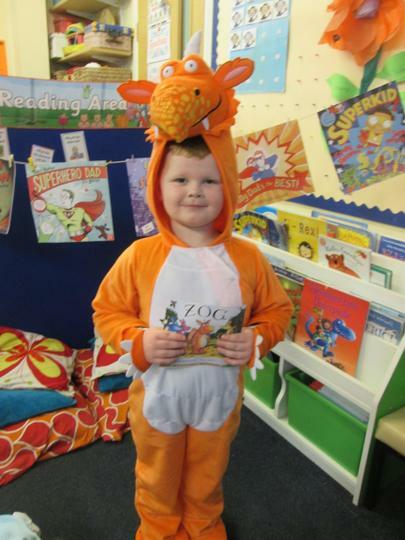 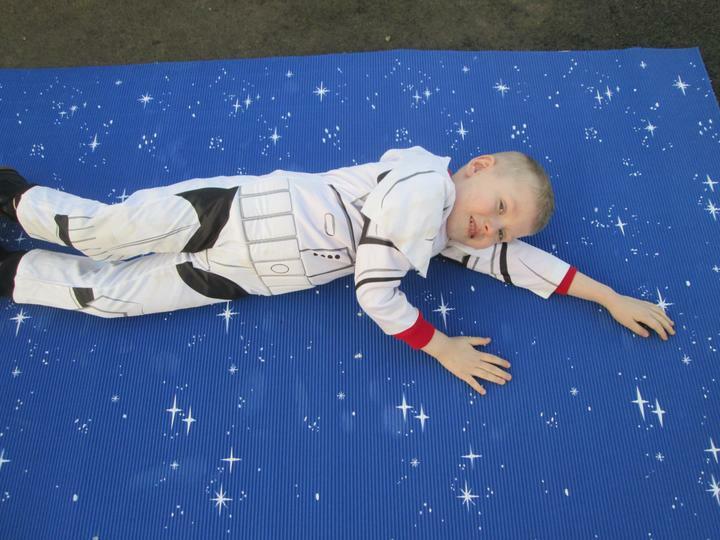 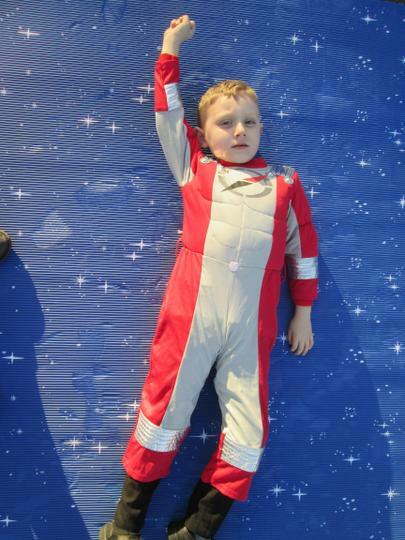 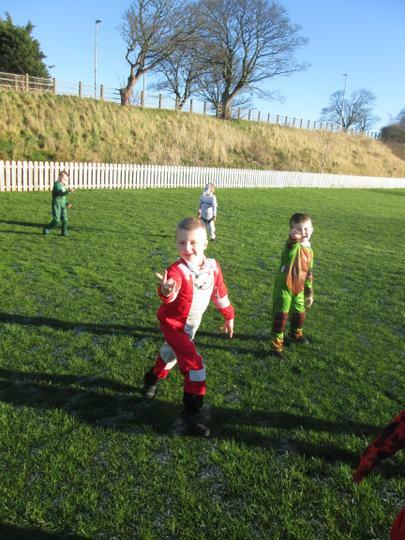 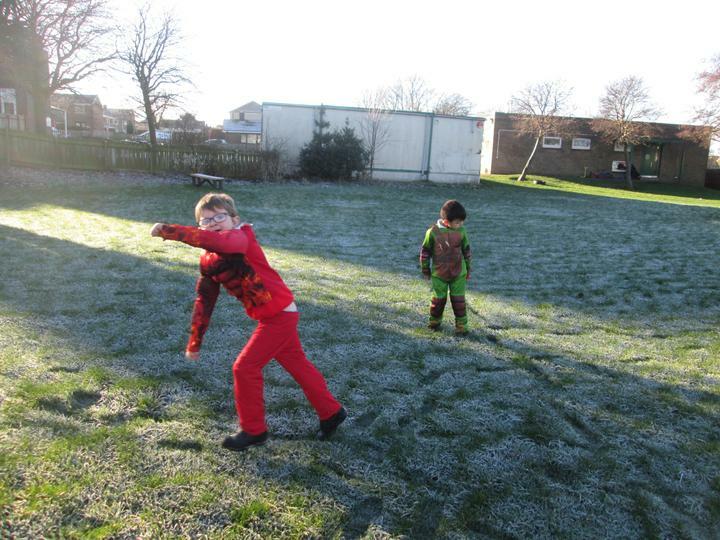 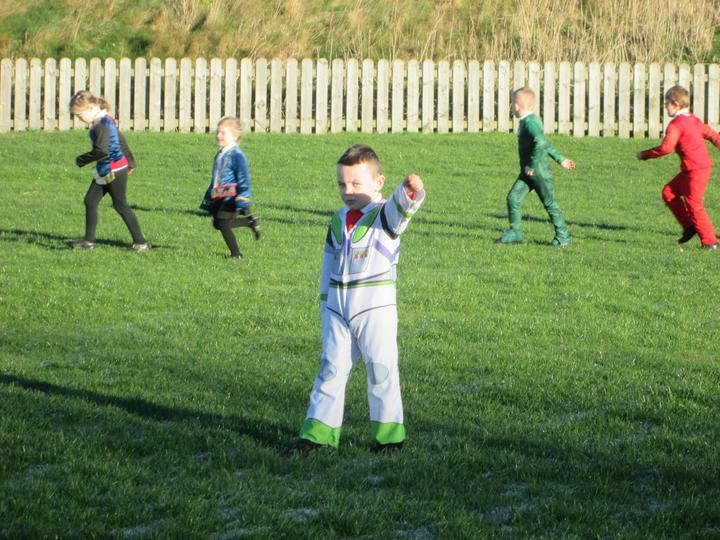 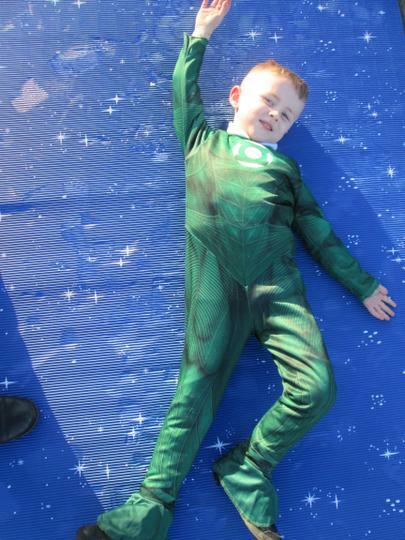 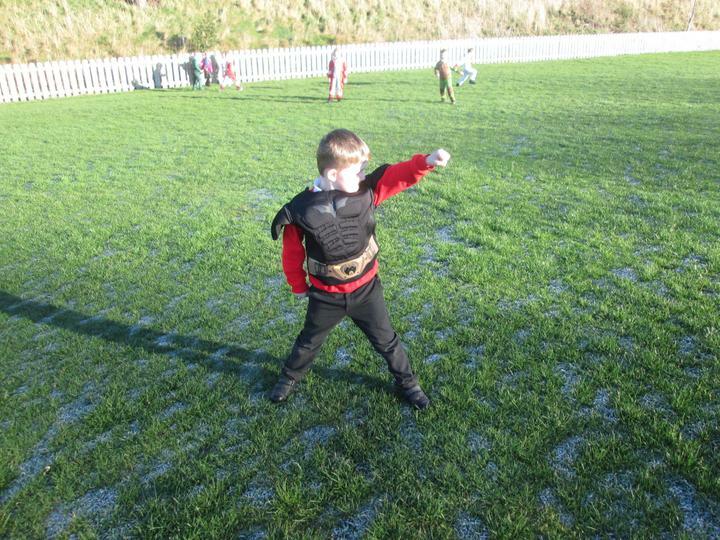 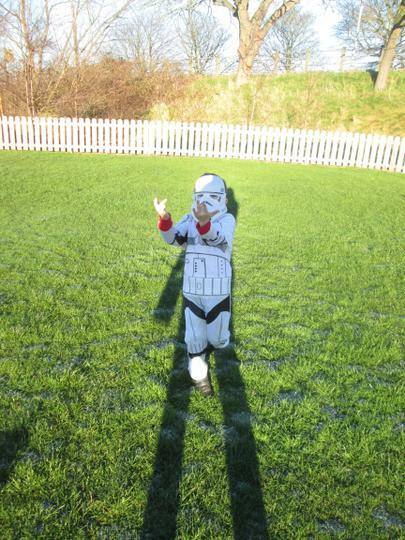 We also voted for our favourite costume and 'Zog' won. 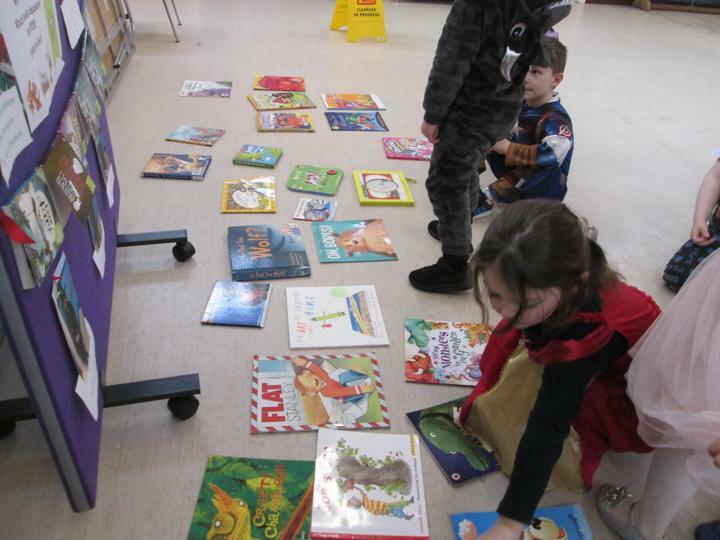 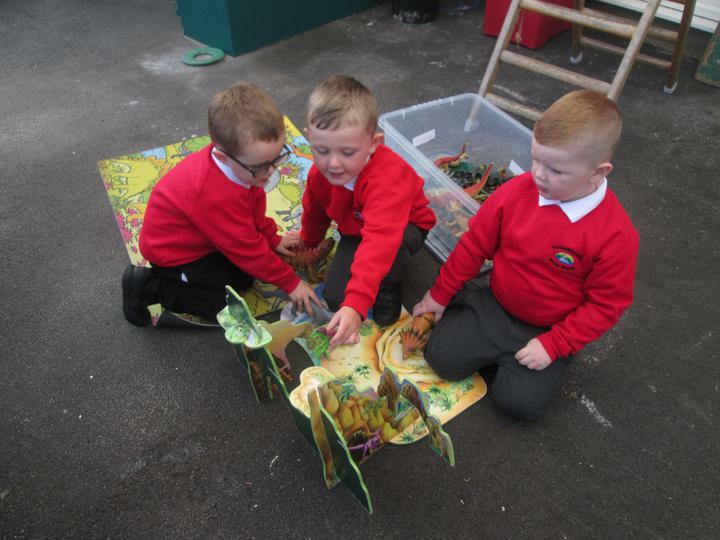 Some of our teachers read their favourite story to us and finally we had a book swap. 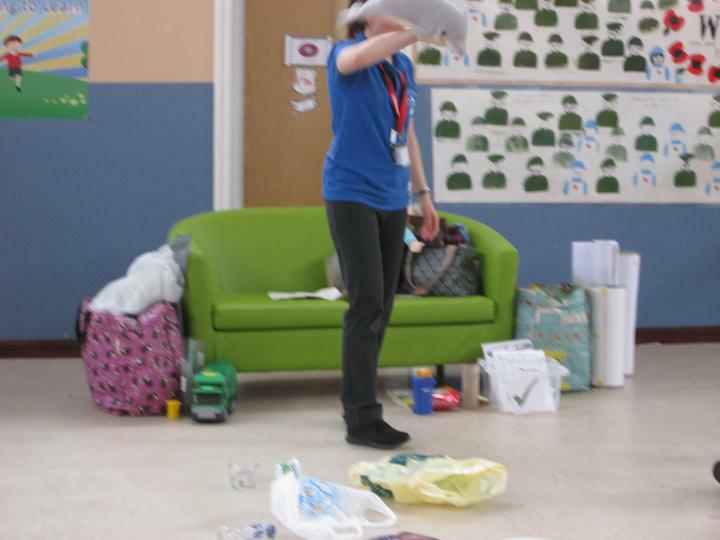 It was a fun day. 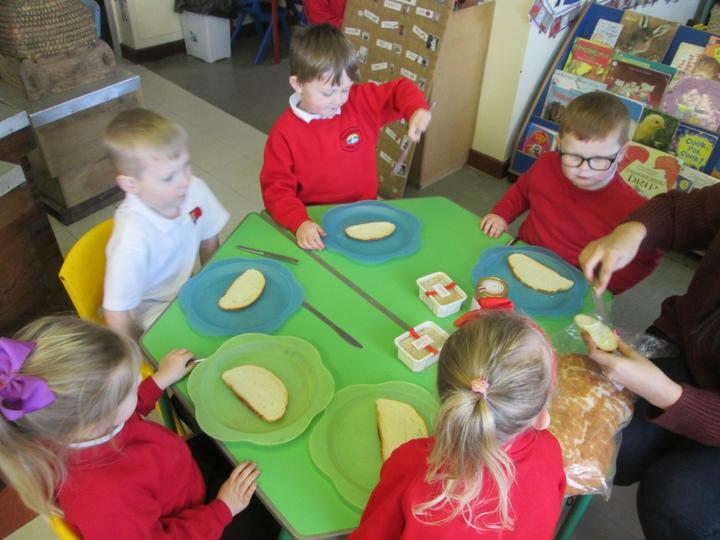 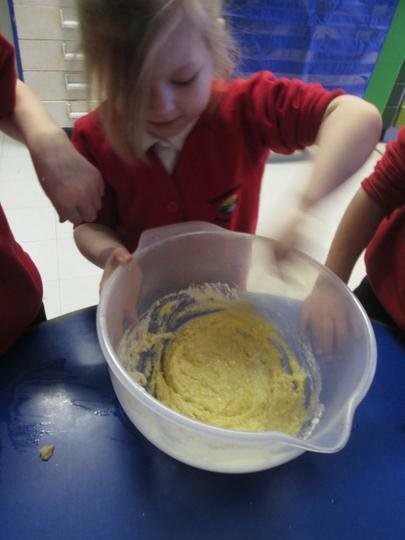 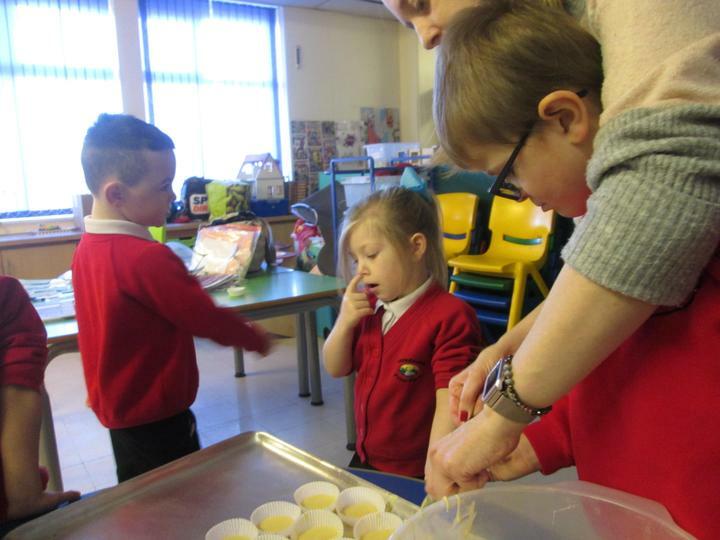 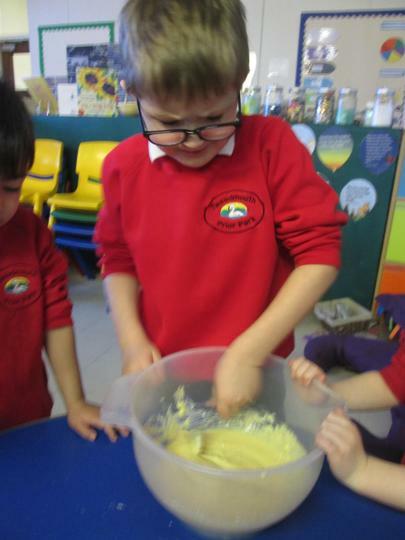 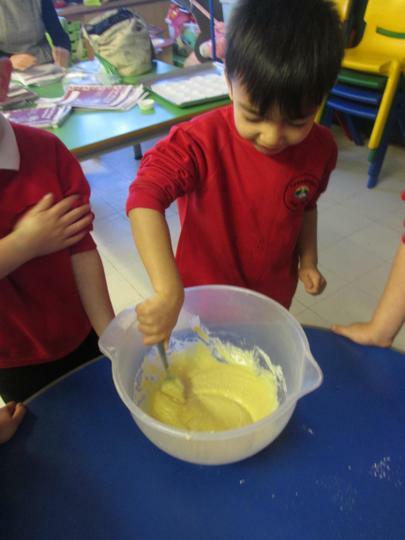 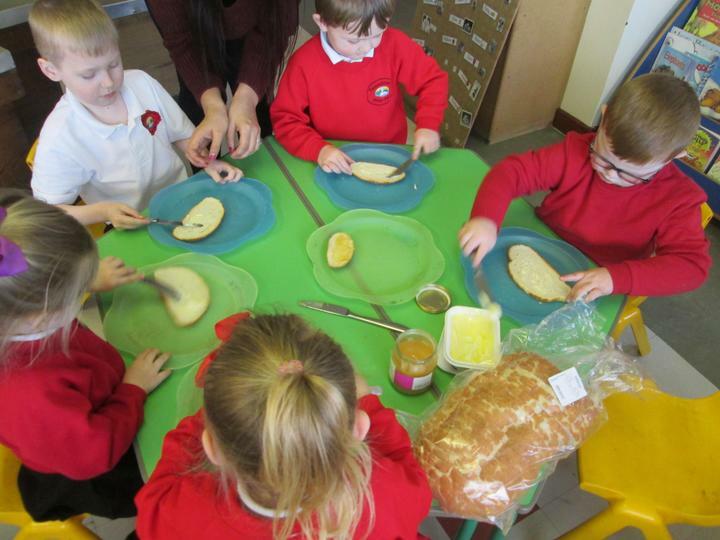 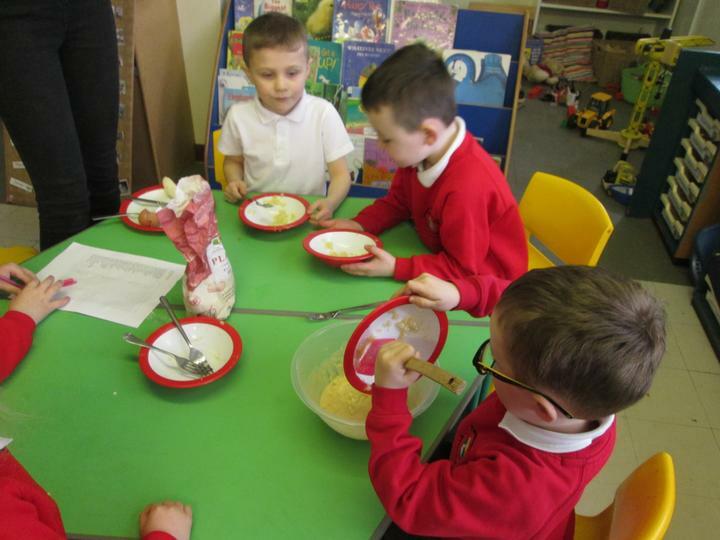 We made delicious banana pancakes on Shrove Tuesday, they were delicious. 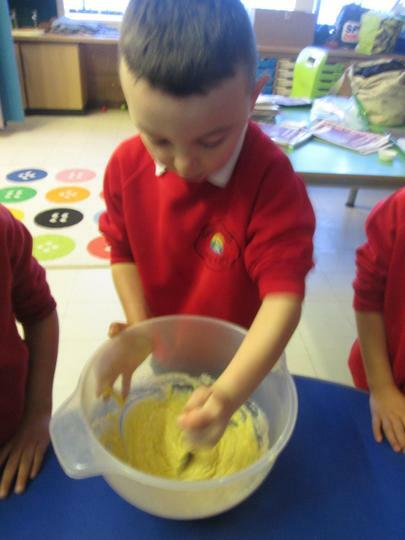 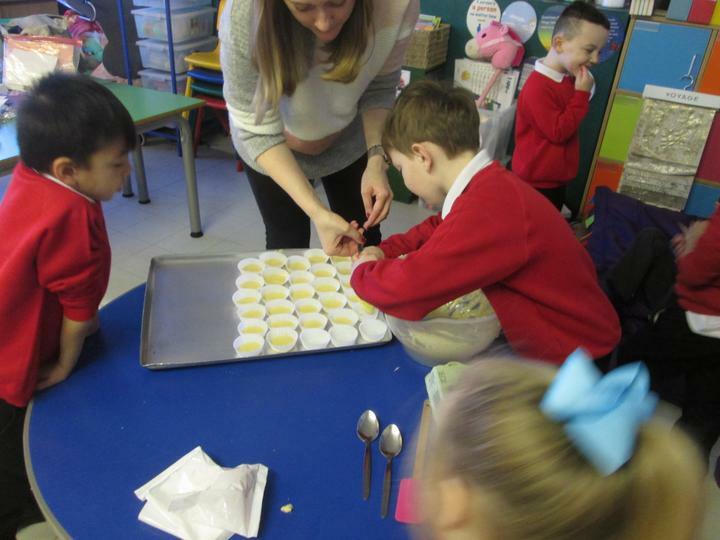 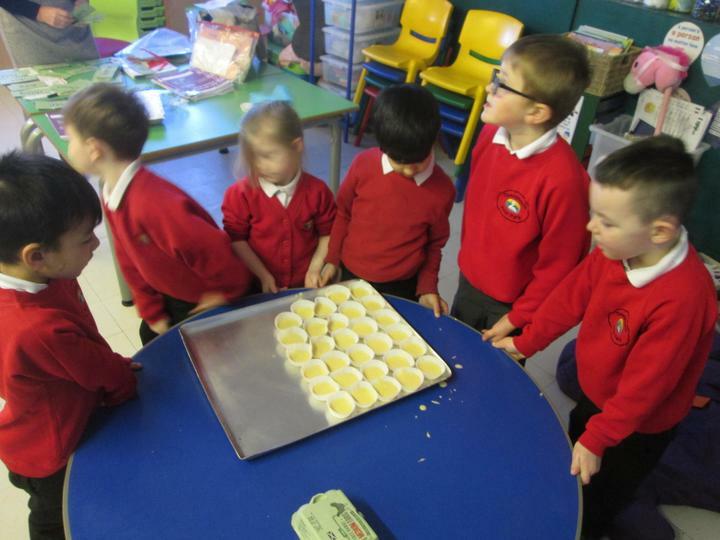 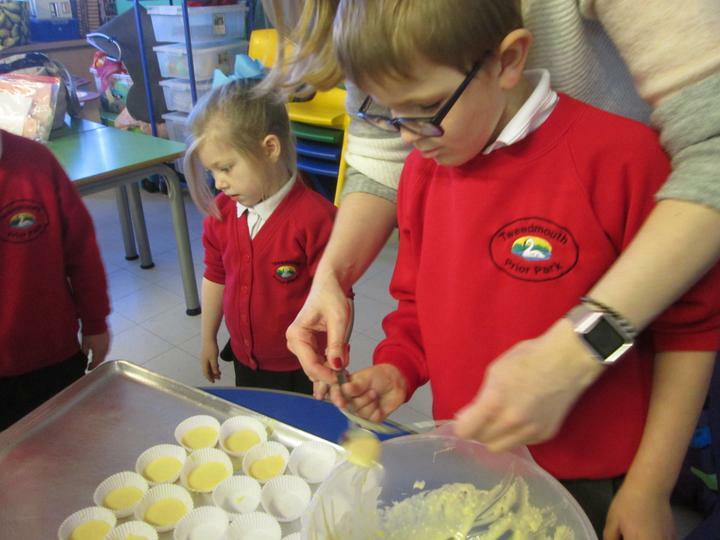 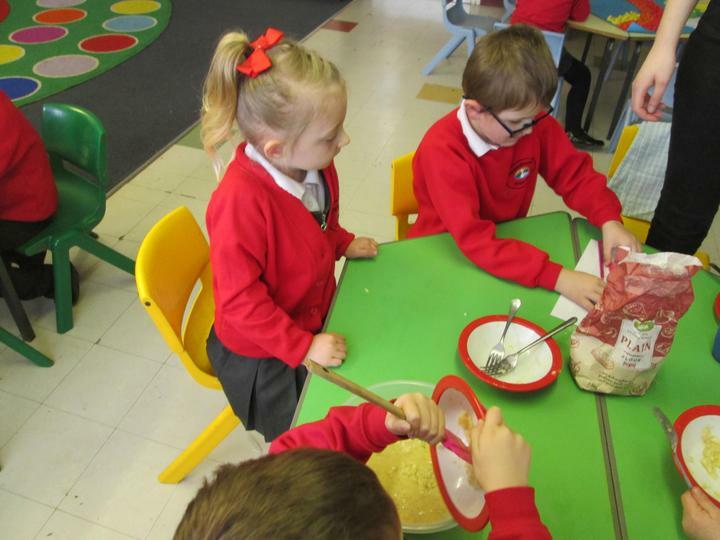 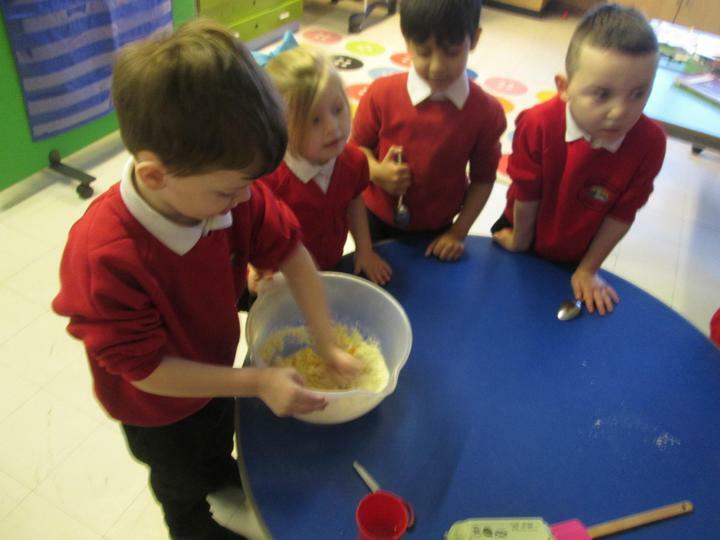 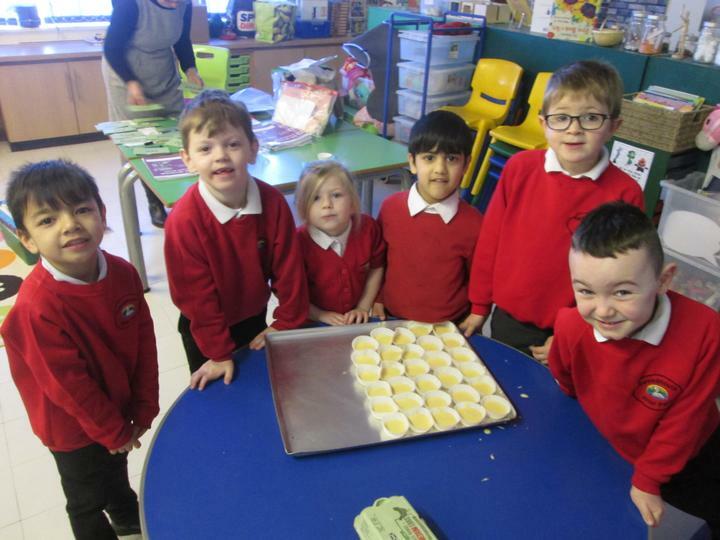 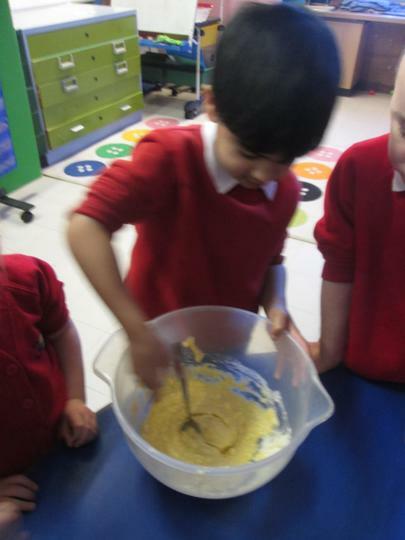 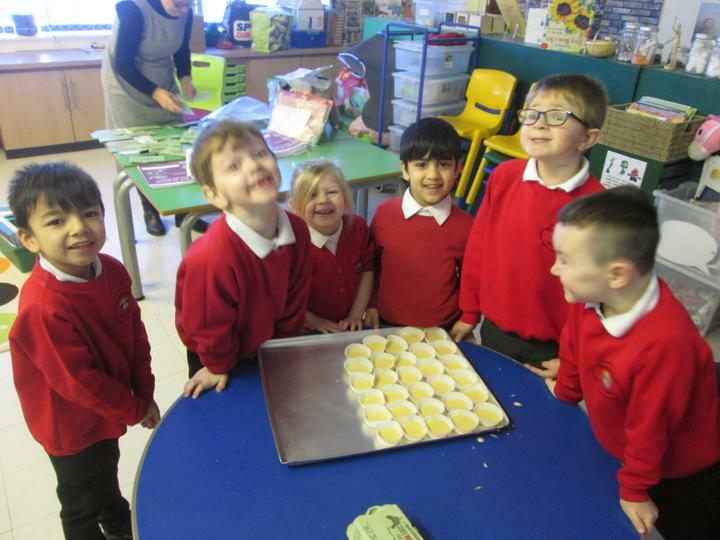 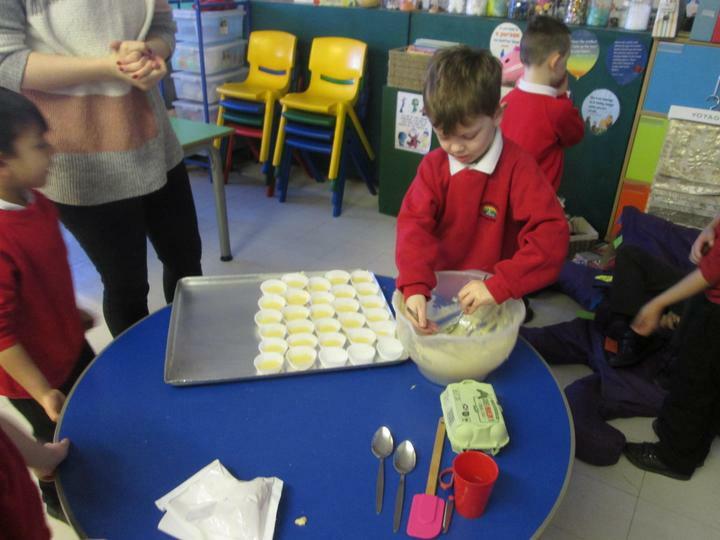 We have decided to bake in our class every Friday as a treat to celebrate all our hard work. 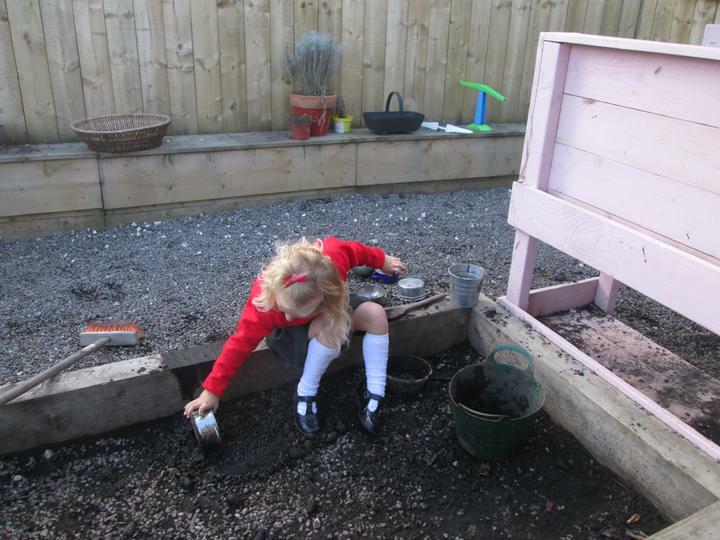 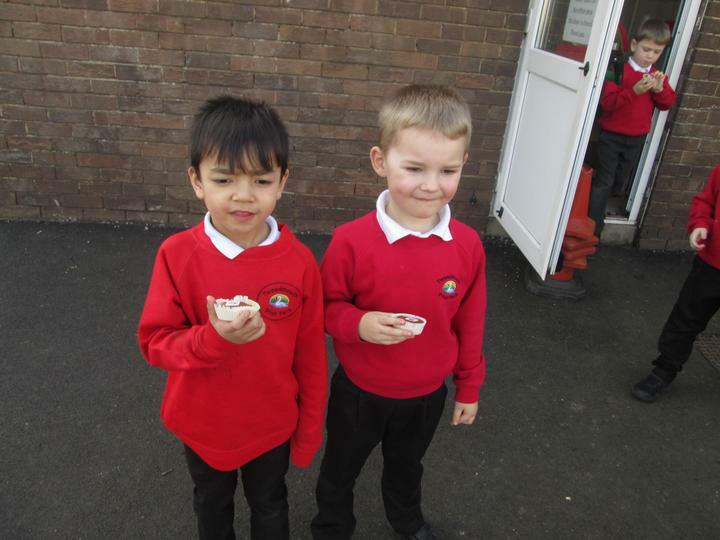 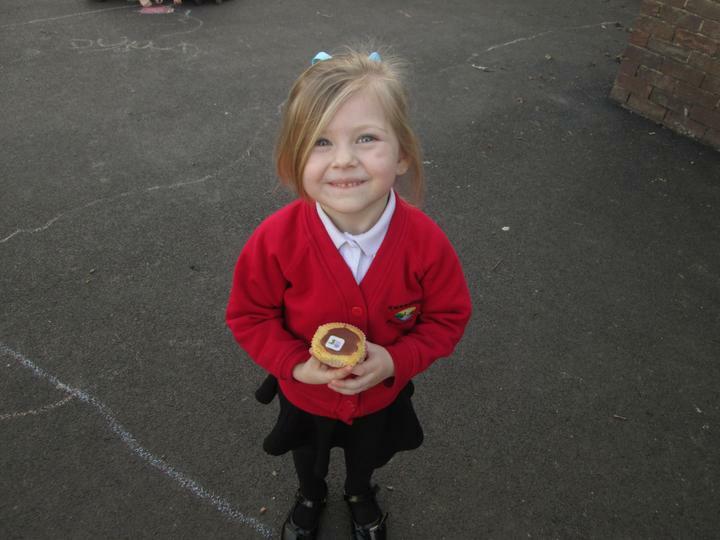 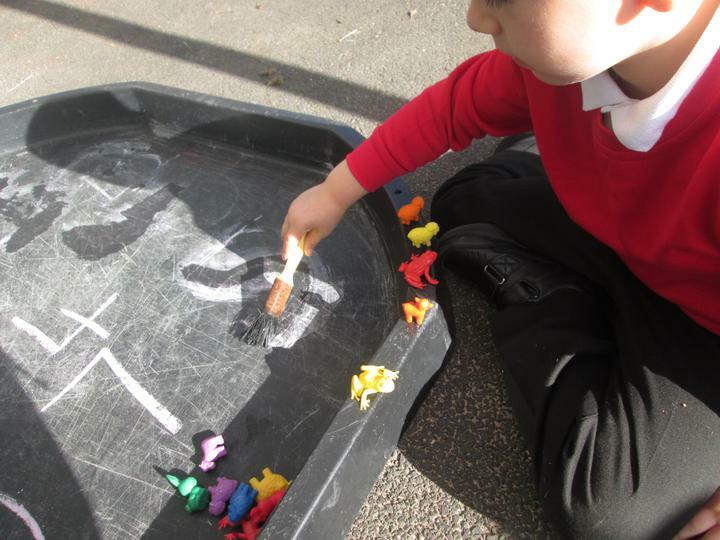 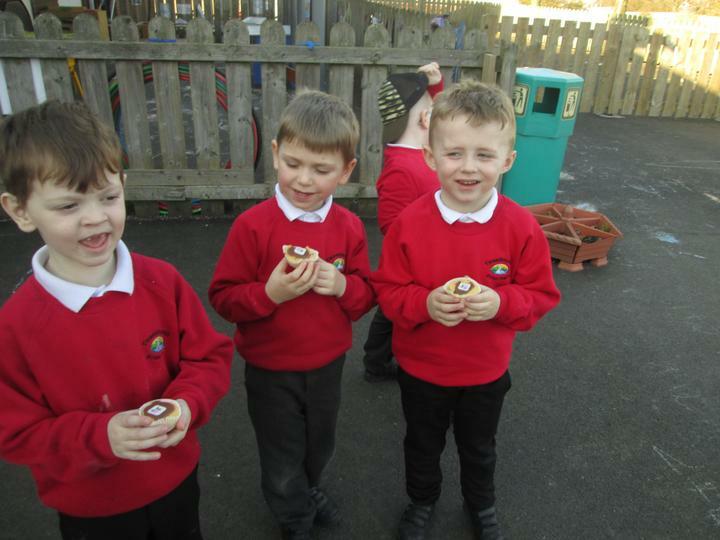 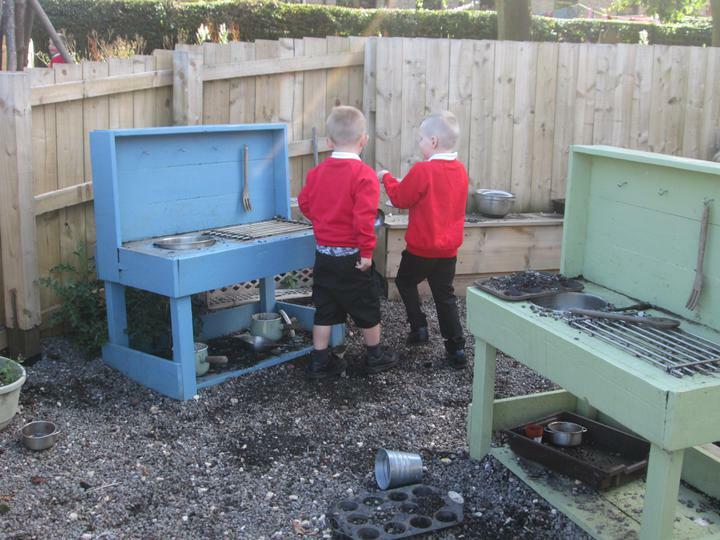 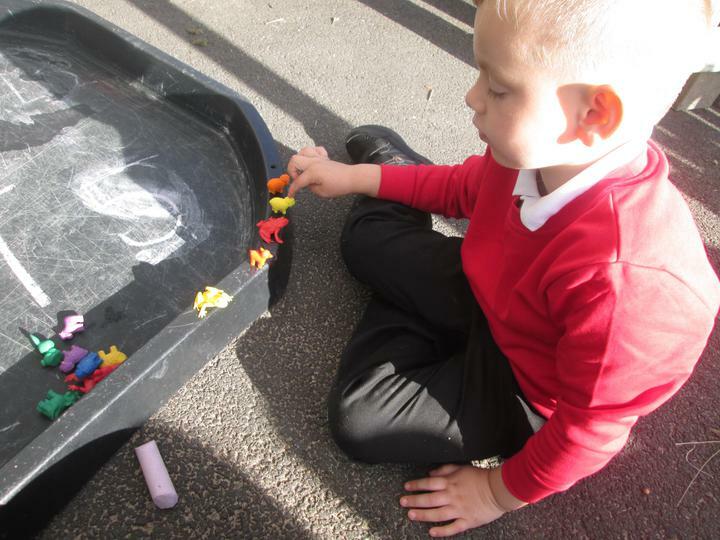 This week we baked little cakes and enjoyed them in the sunshine. 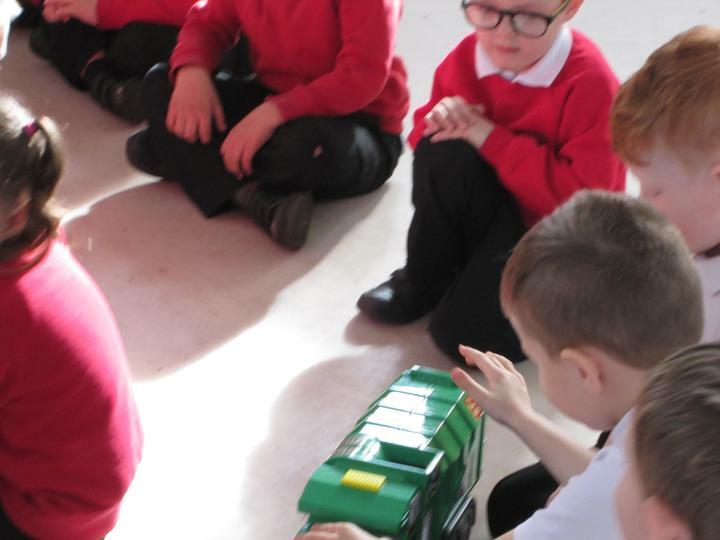 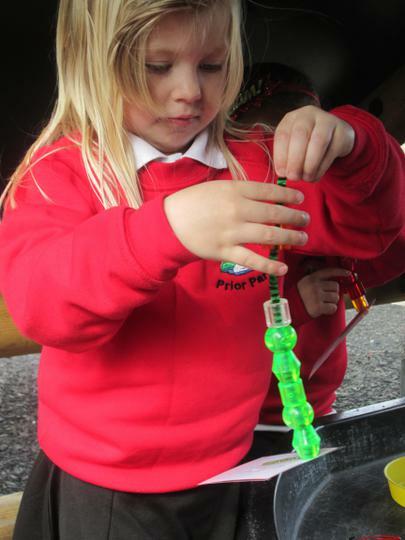 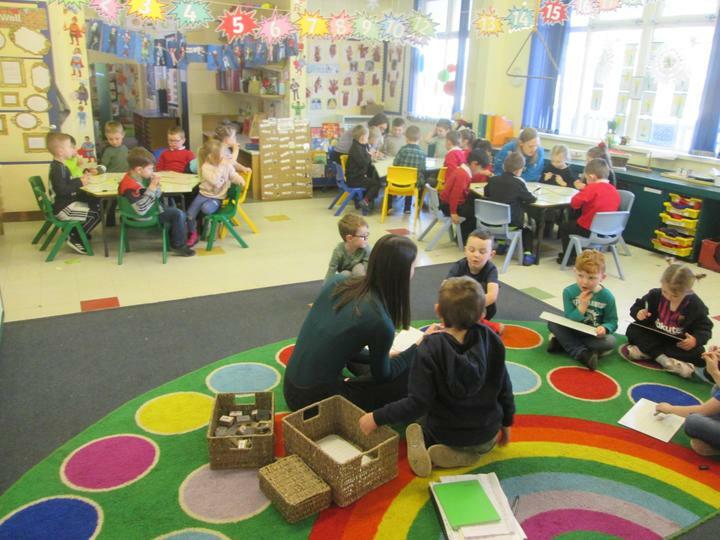 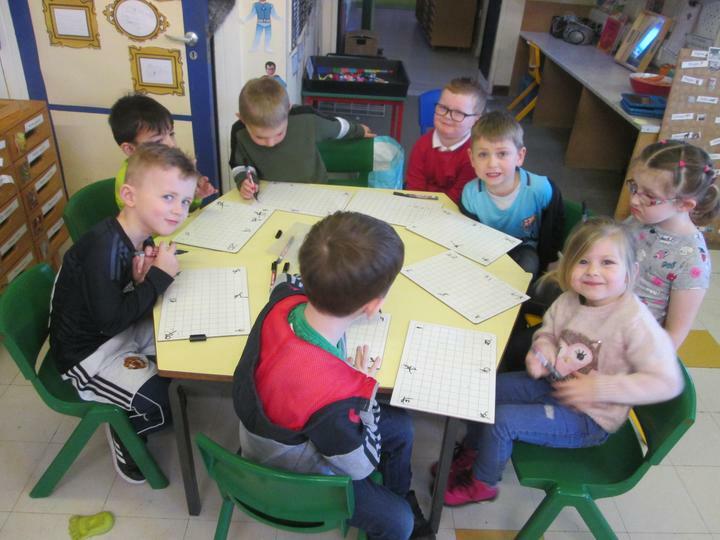 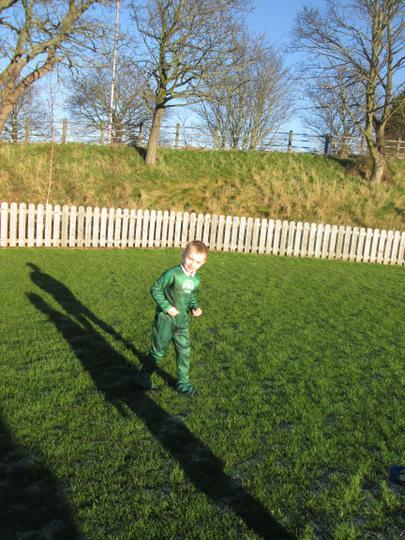 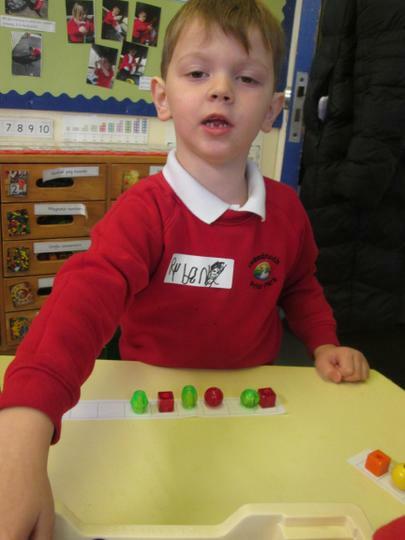 We celebrated the NSPCC Number Day on Friday 1st February. 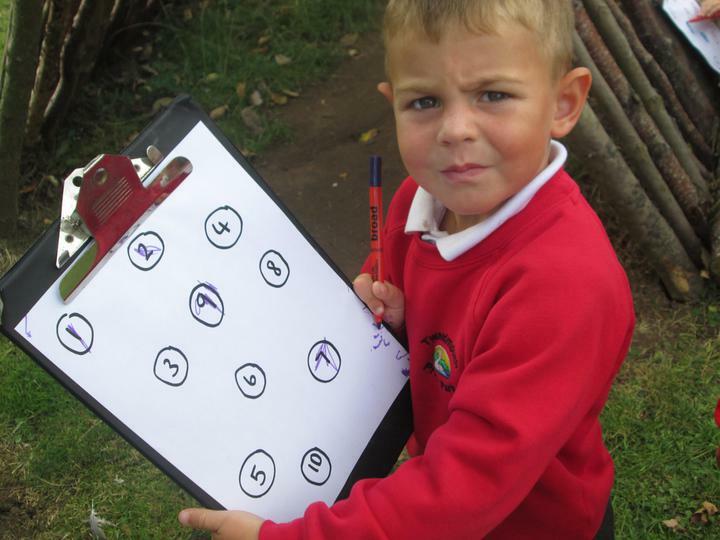 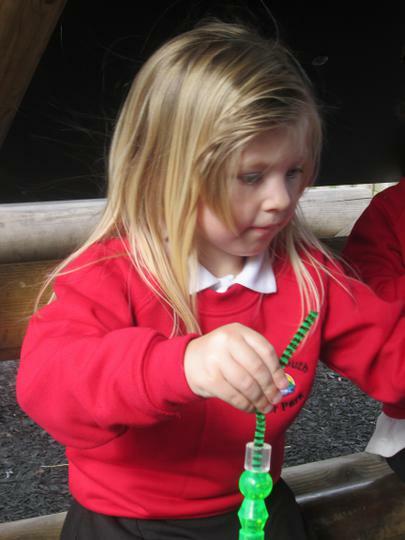 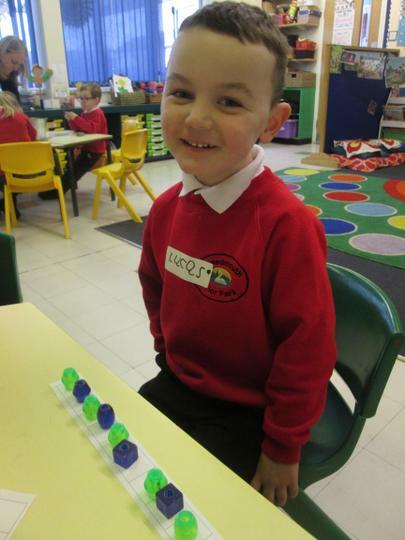 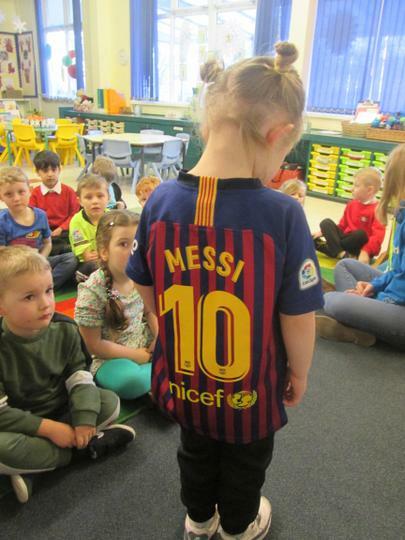 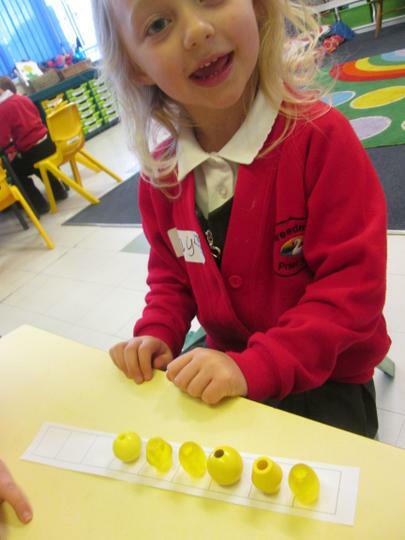 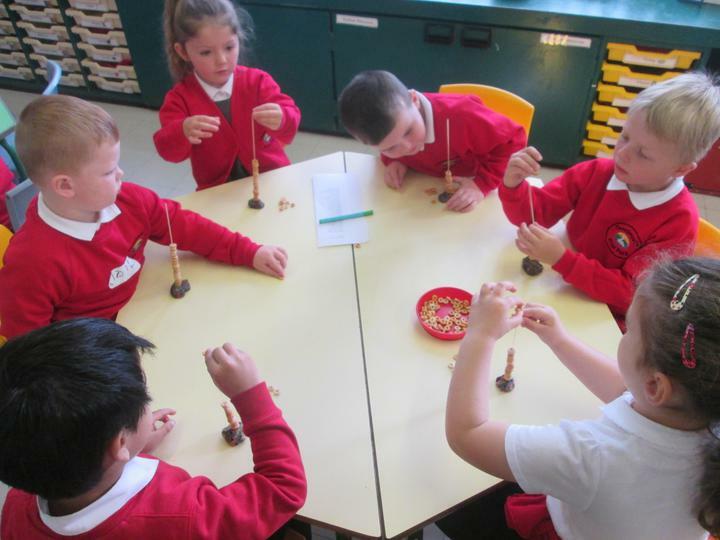 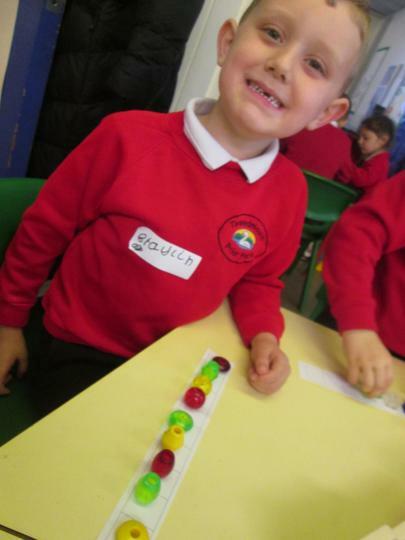 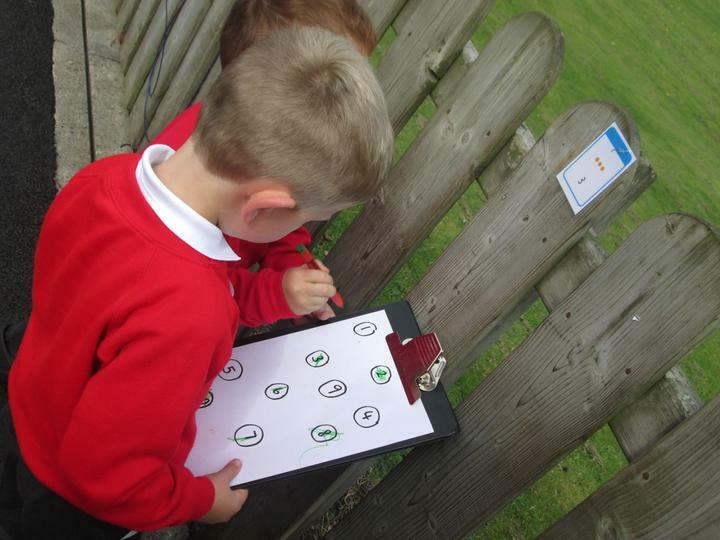 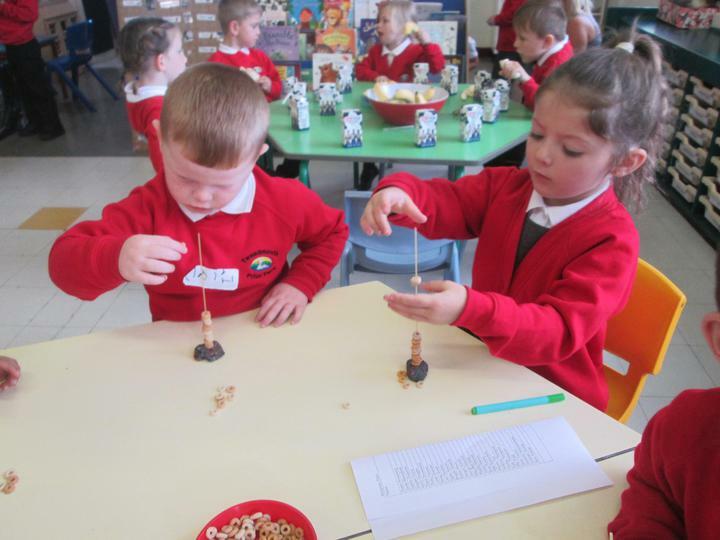 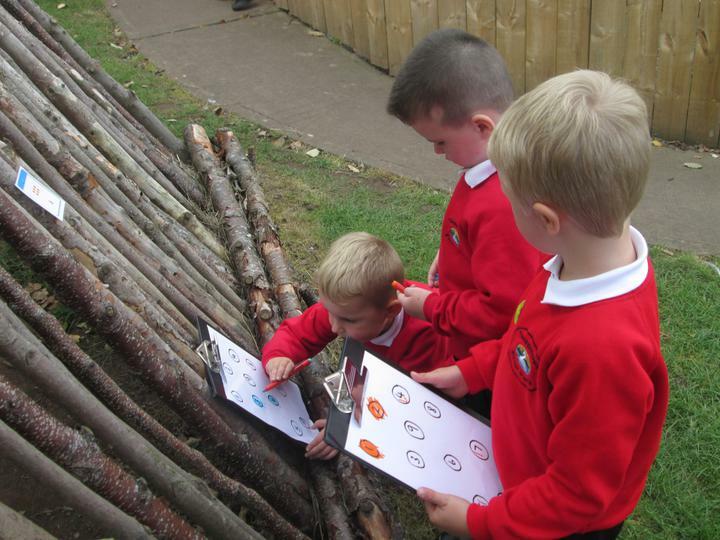 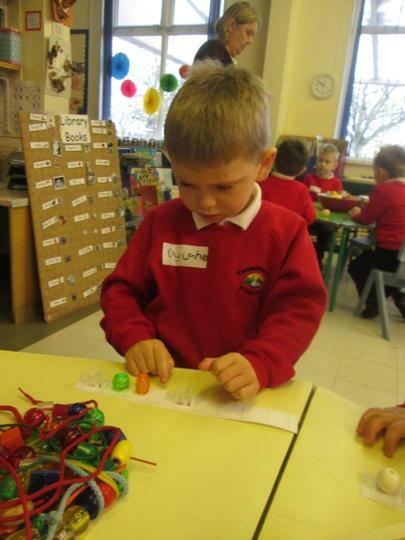 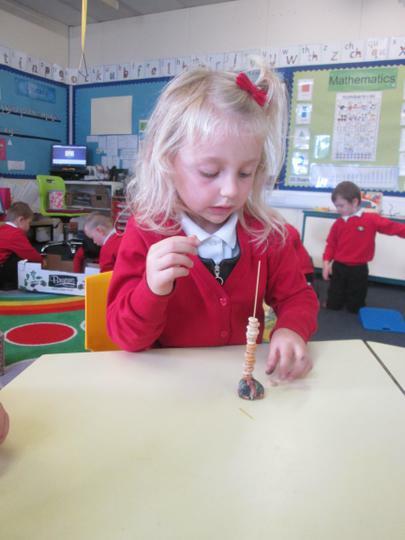 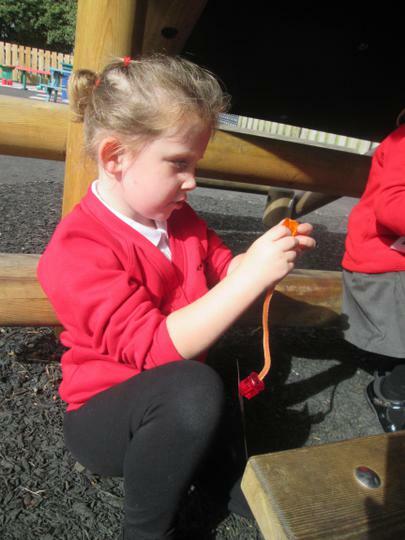 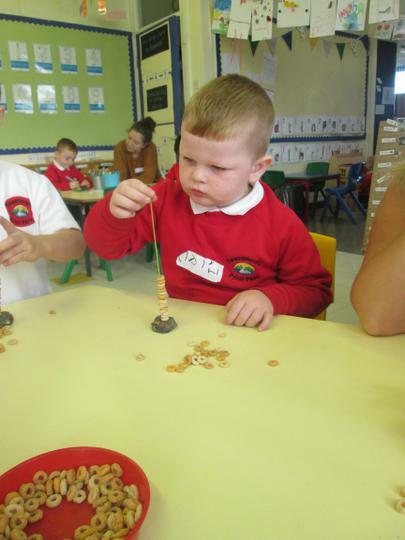 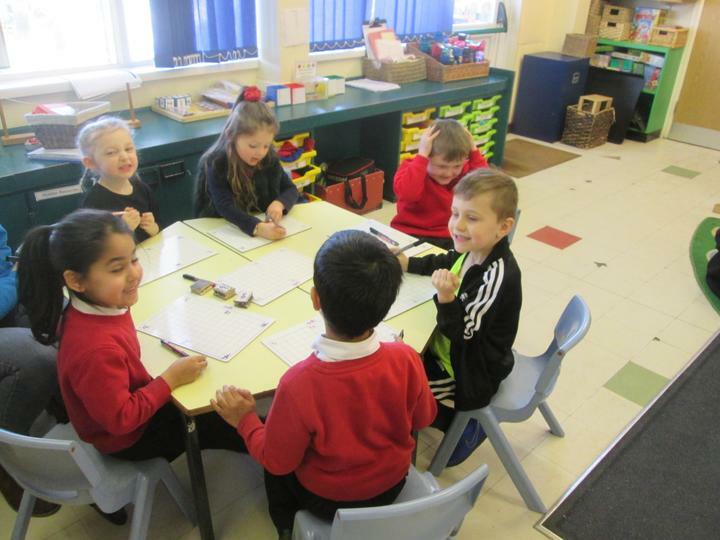 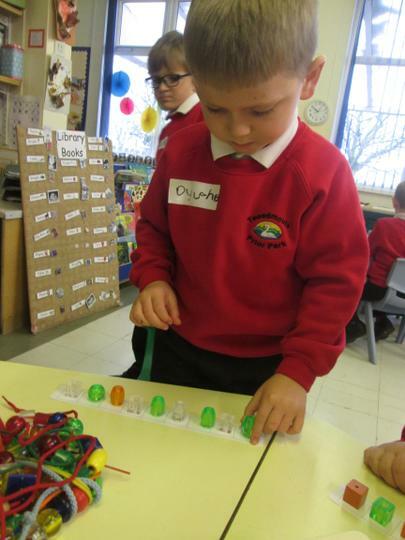 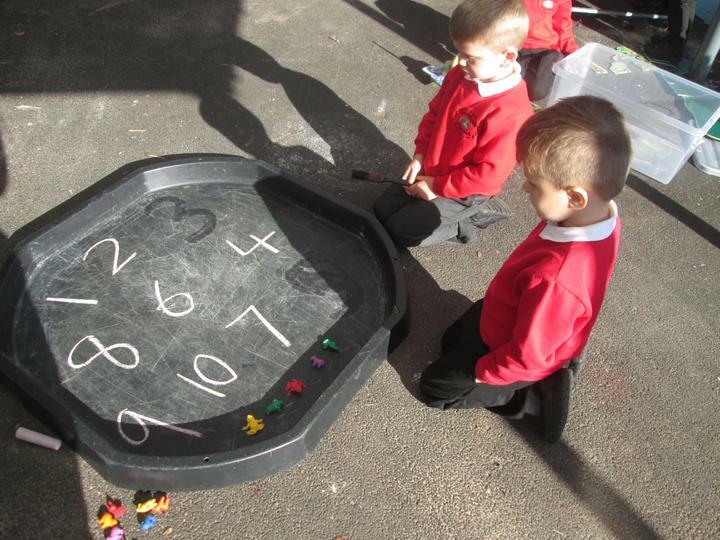 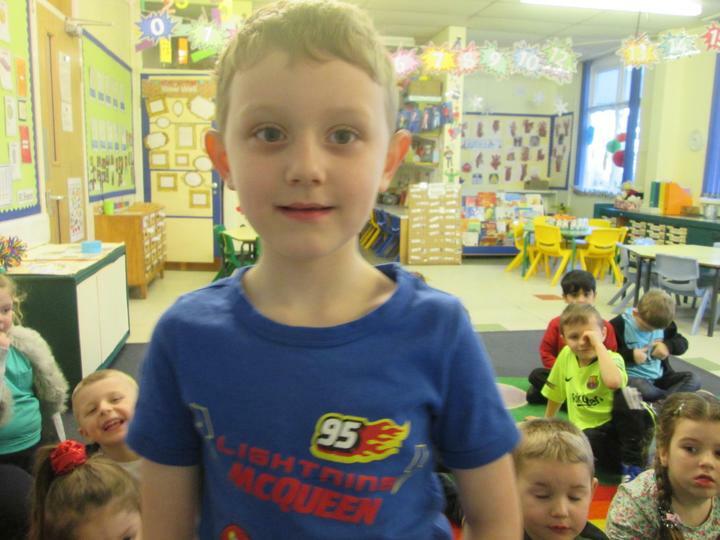 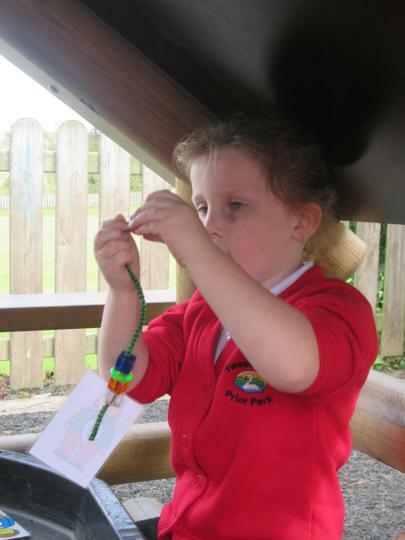 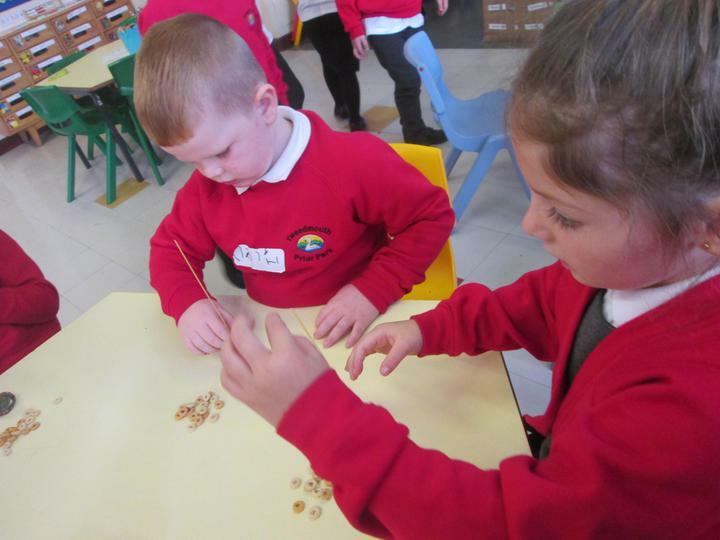 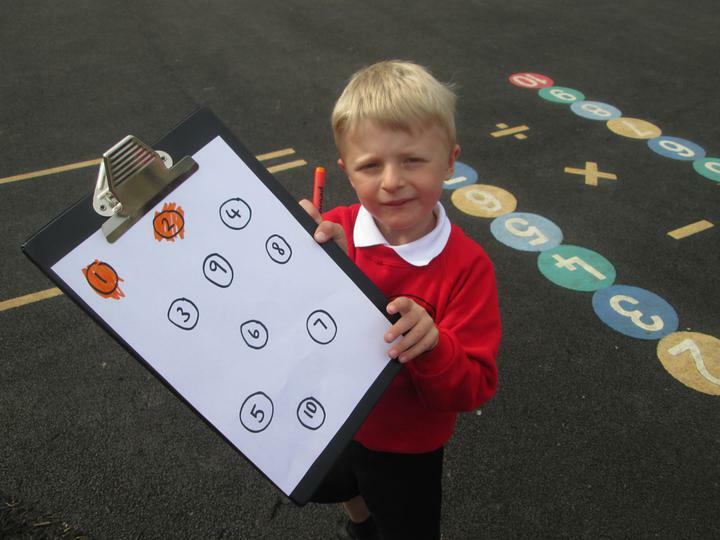 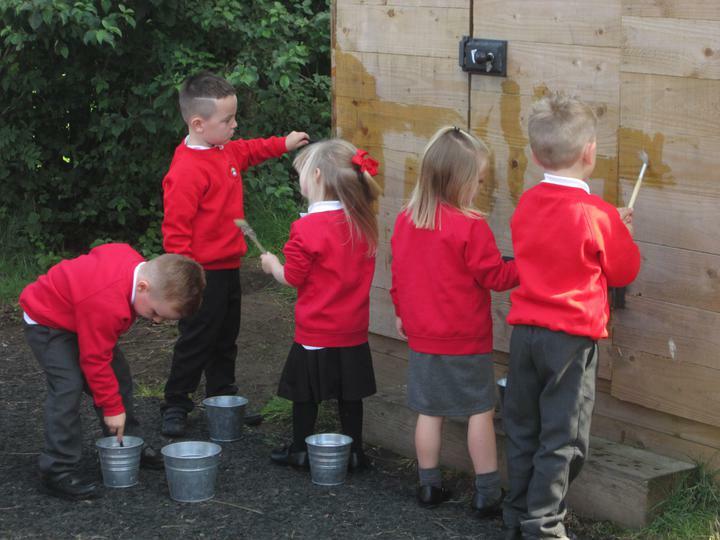 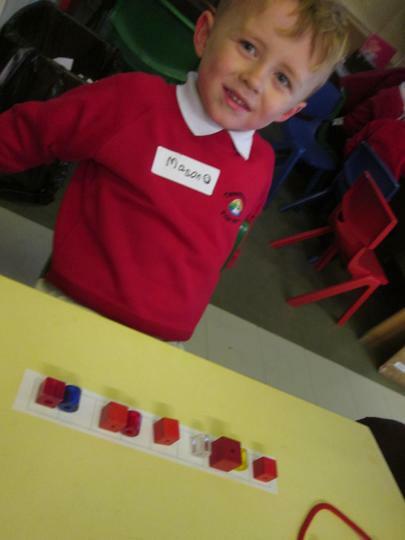 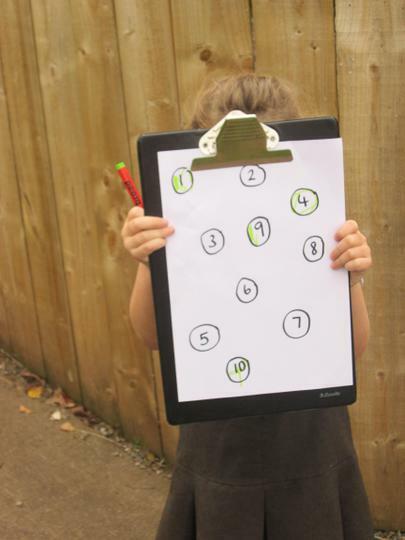 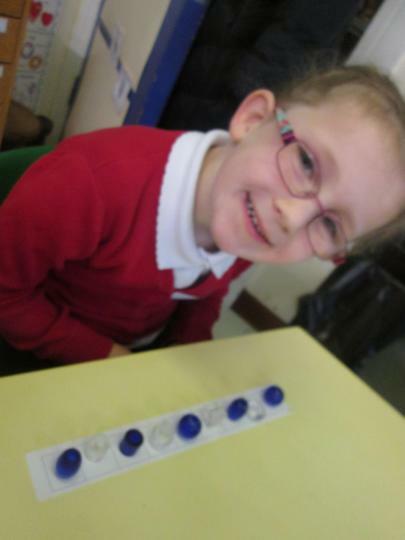 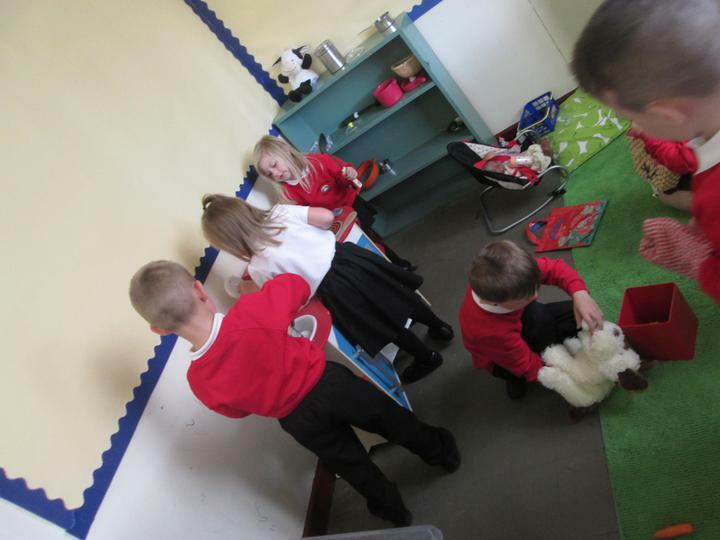 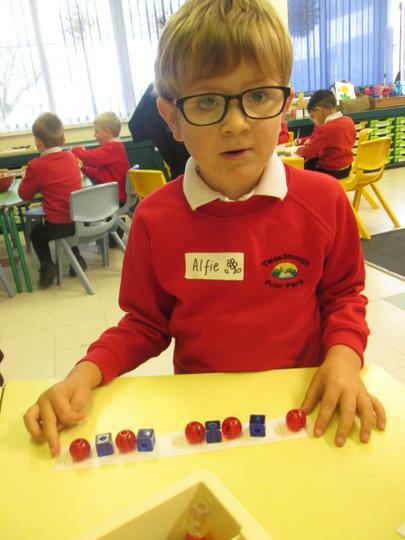 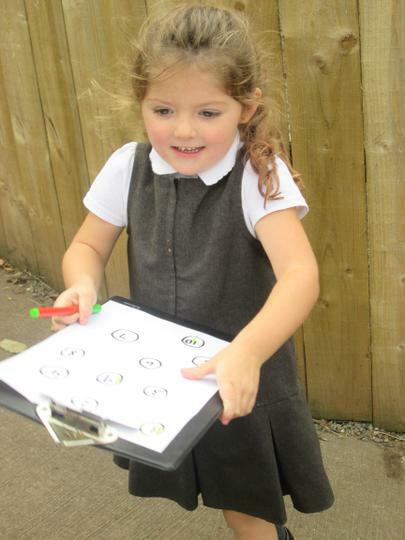 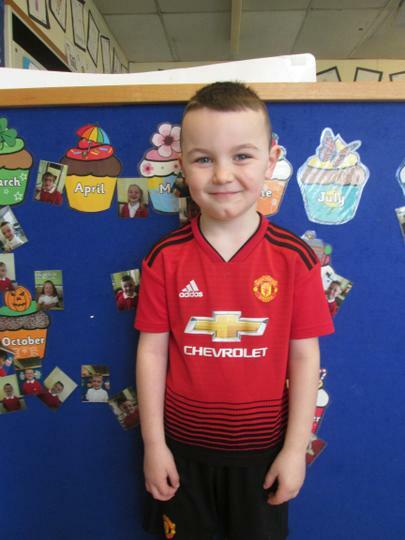 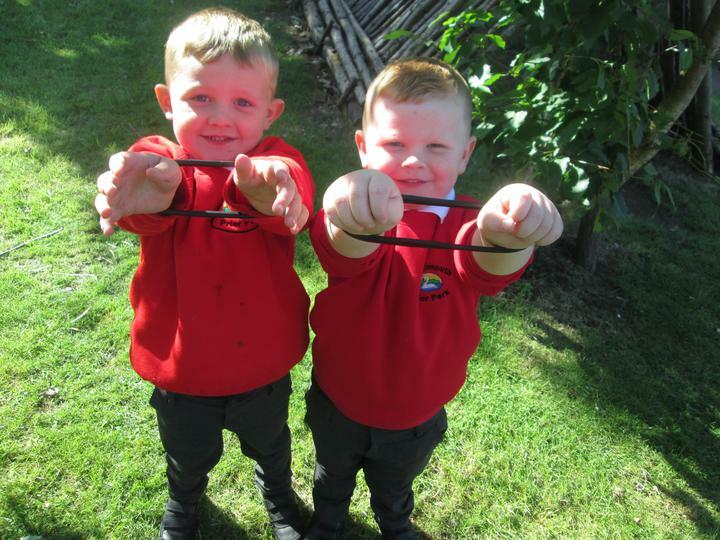 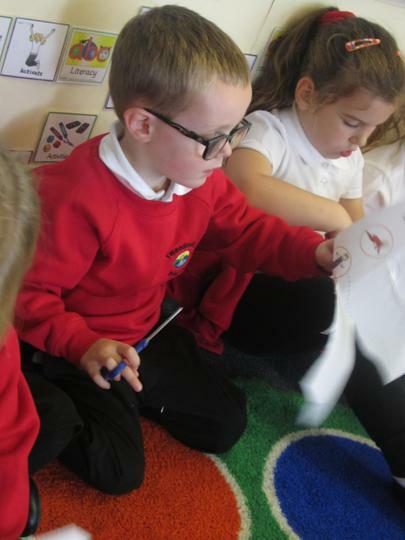 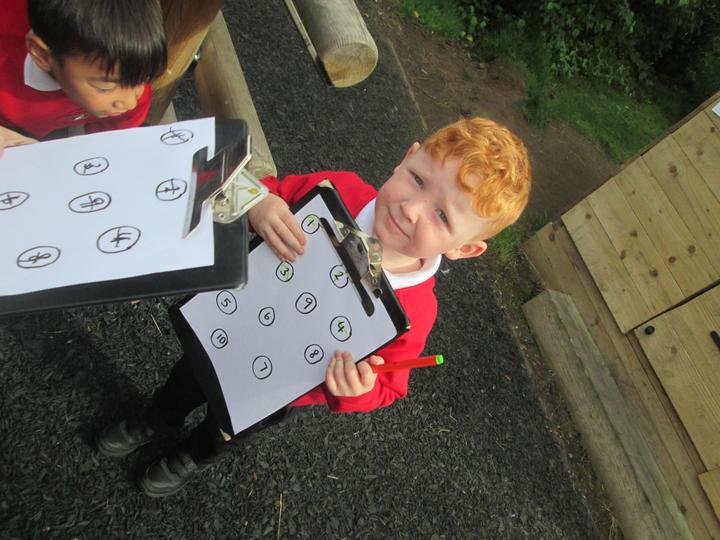 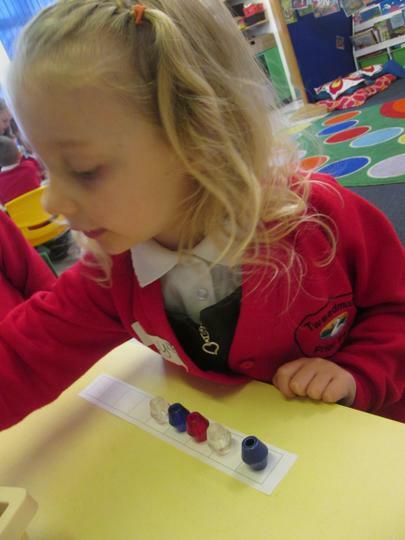 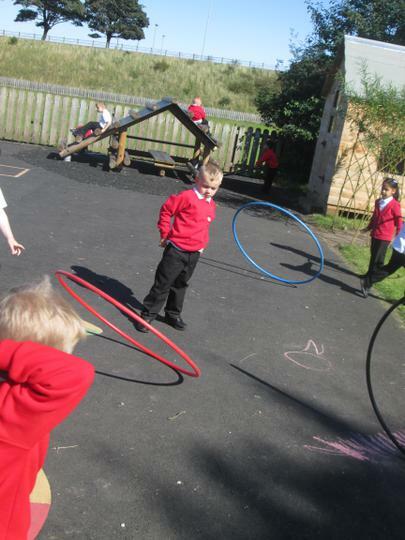 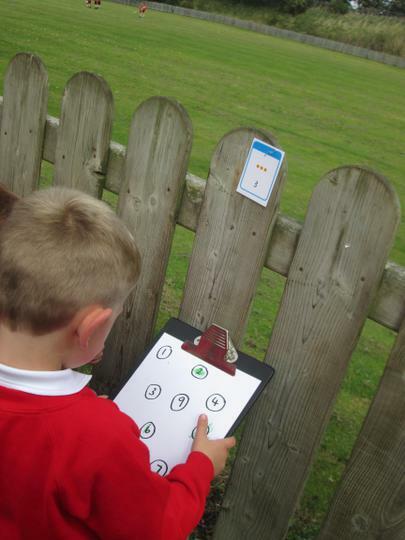 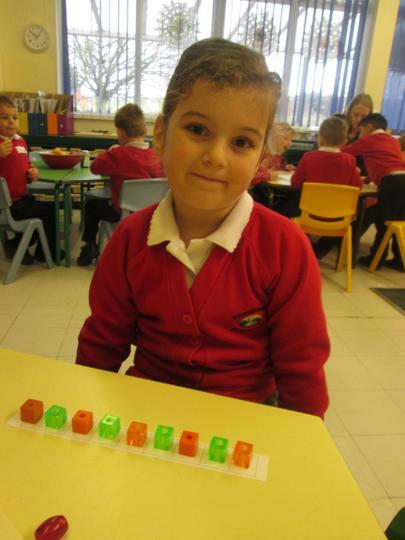 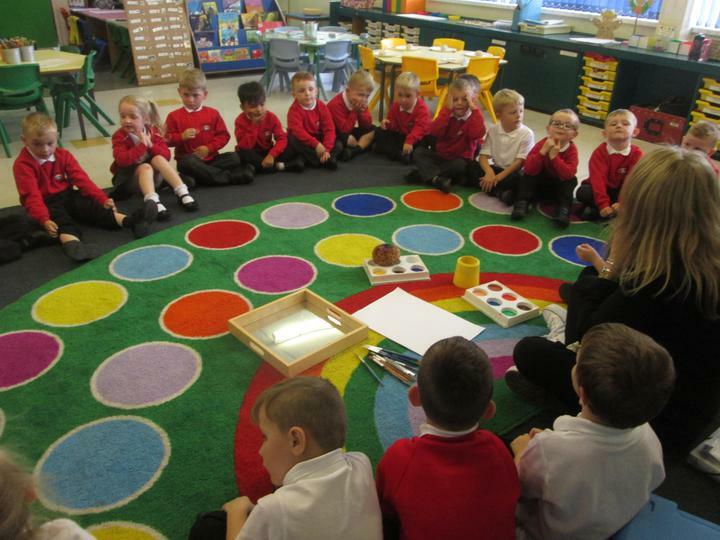 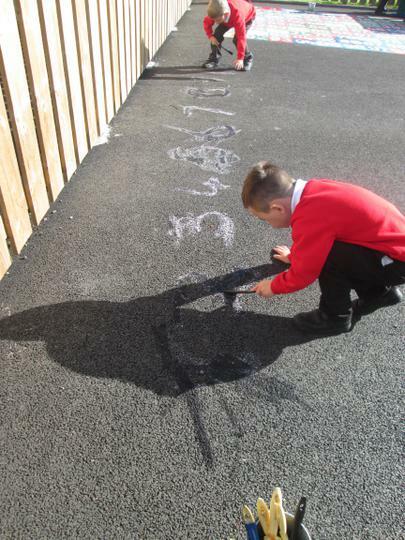 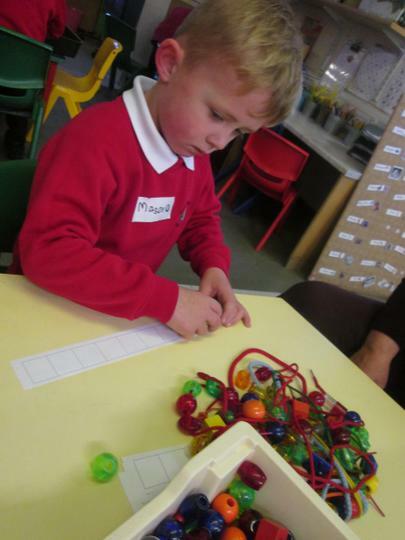 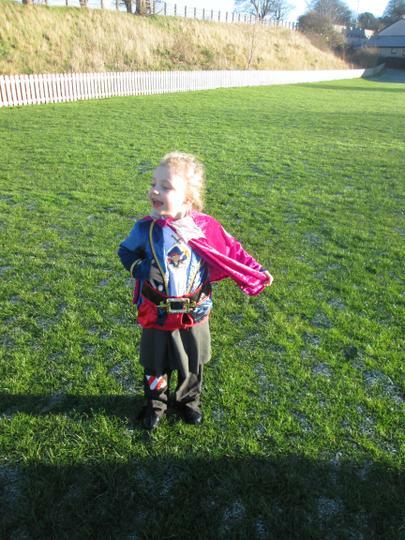 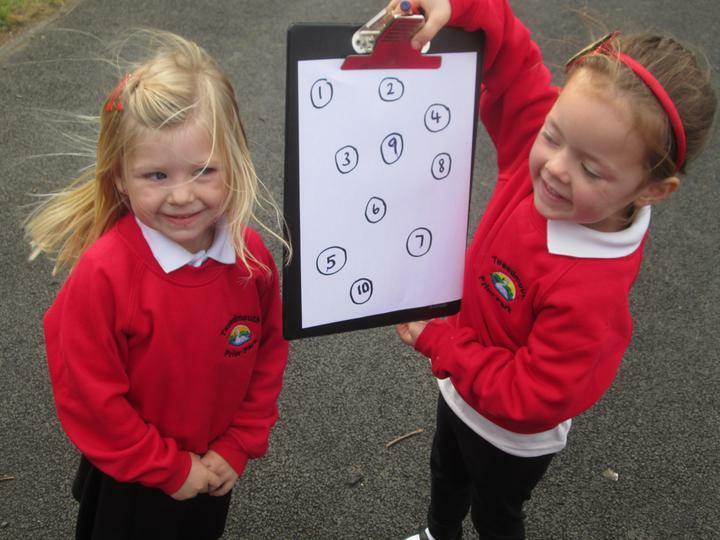 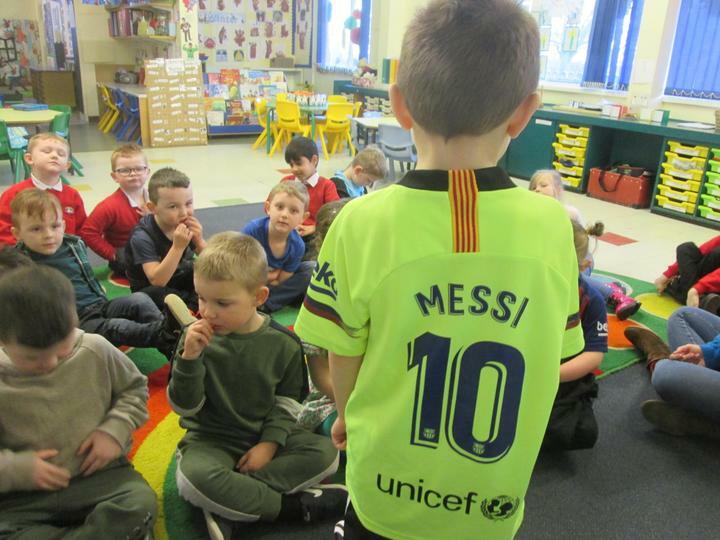 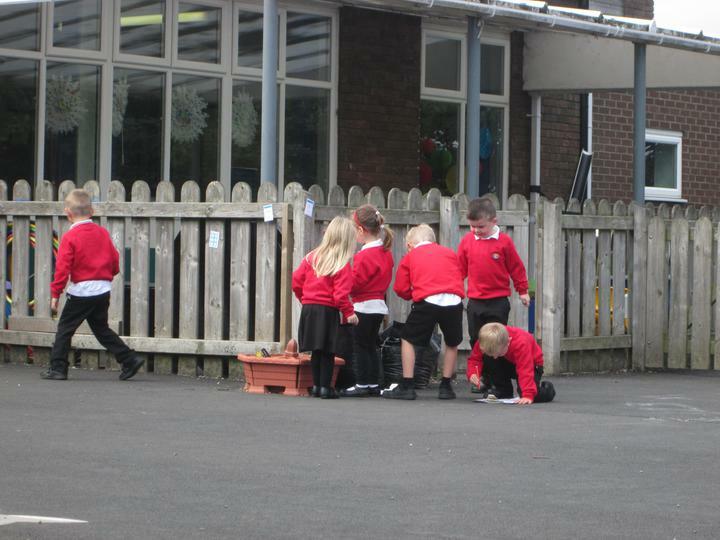 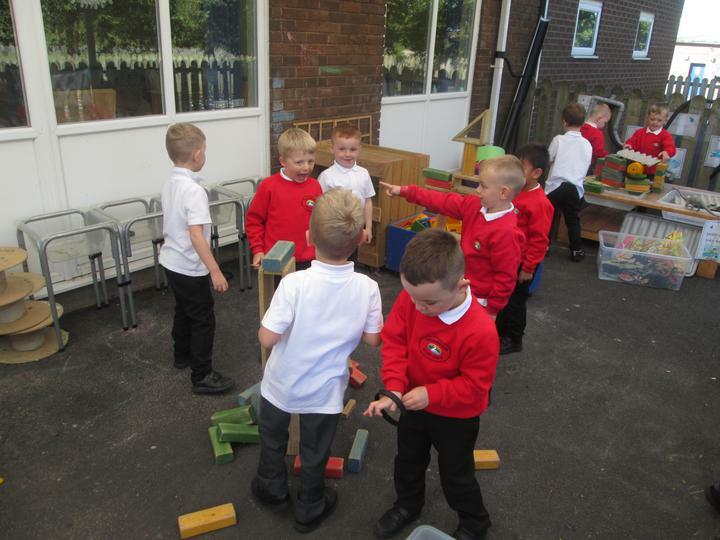 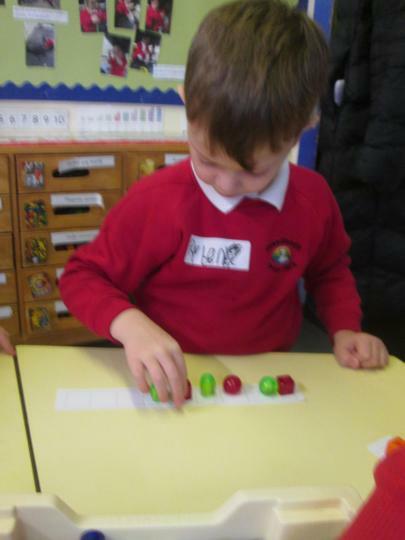 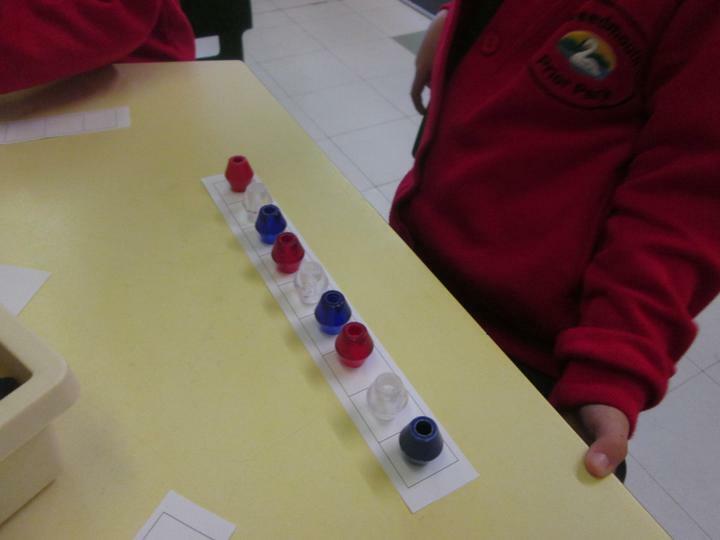 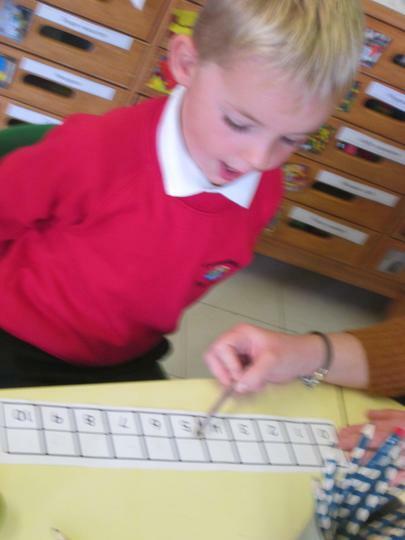 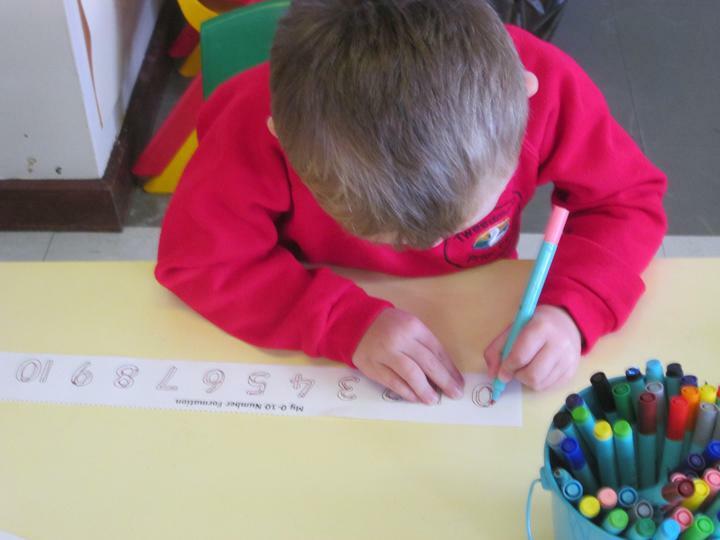 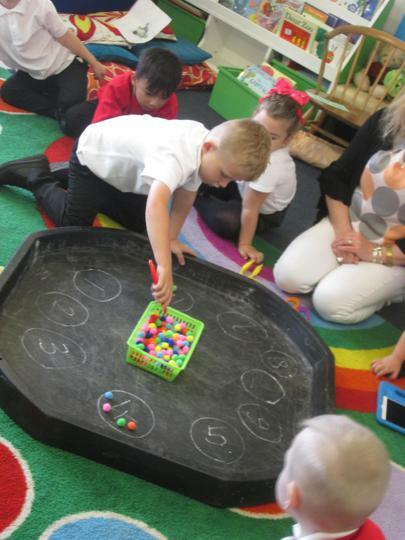 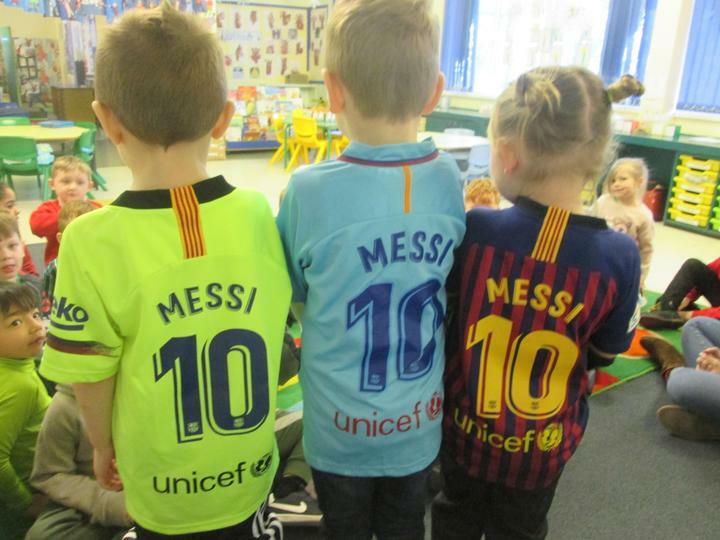 Lots of us came to school with numbers on our clothes and we took part in lots of number activities. 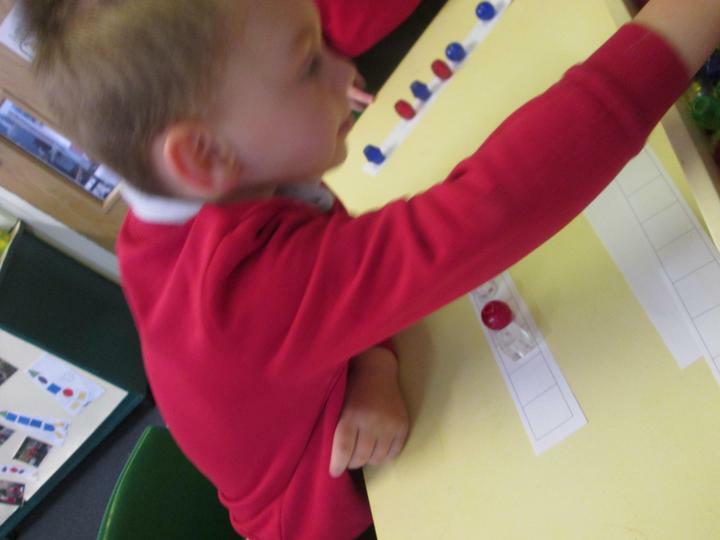 We played number bingo and loved it! 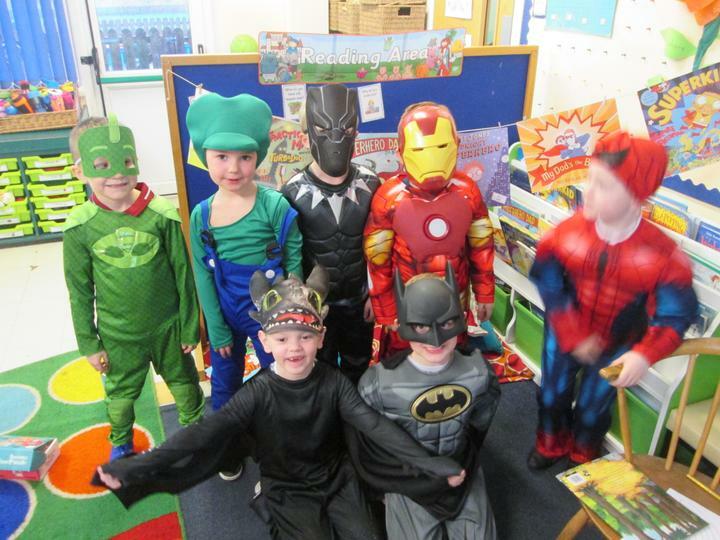 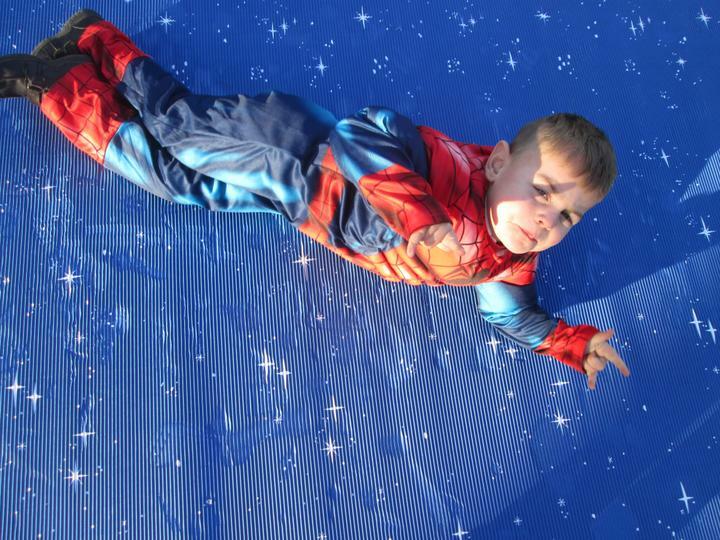 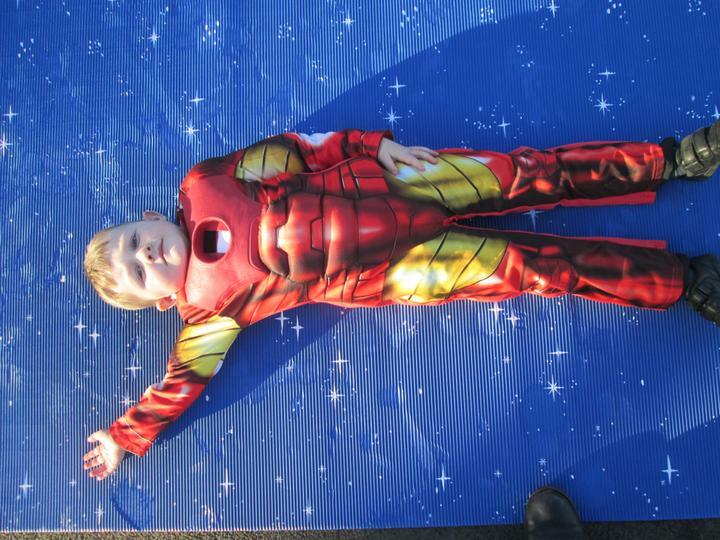 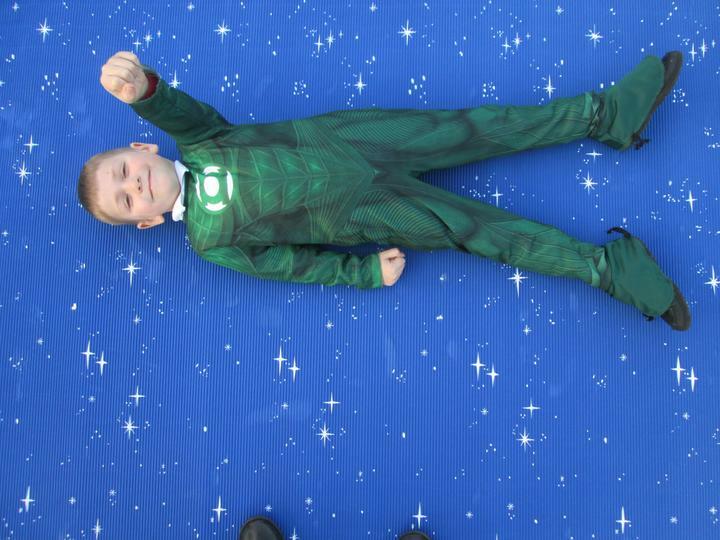 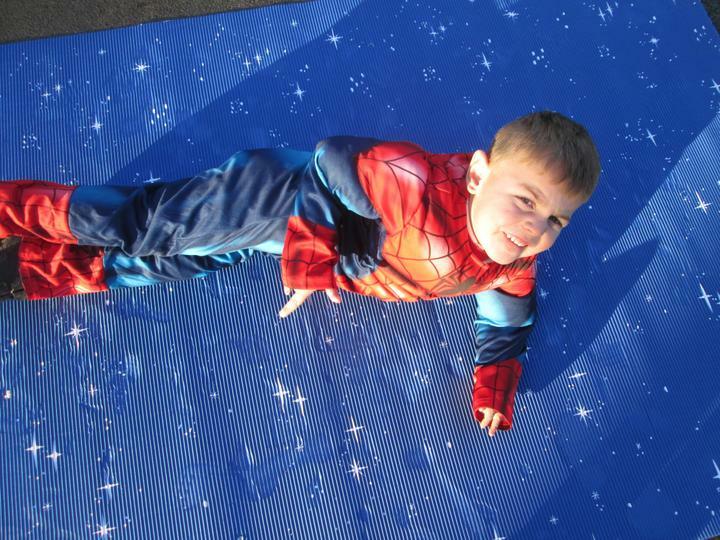 This half term our topic is 'Superheroes' here is what we are learning about. 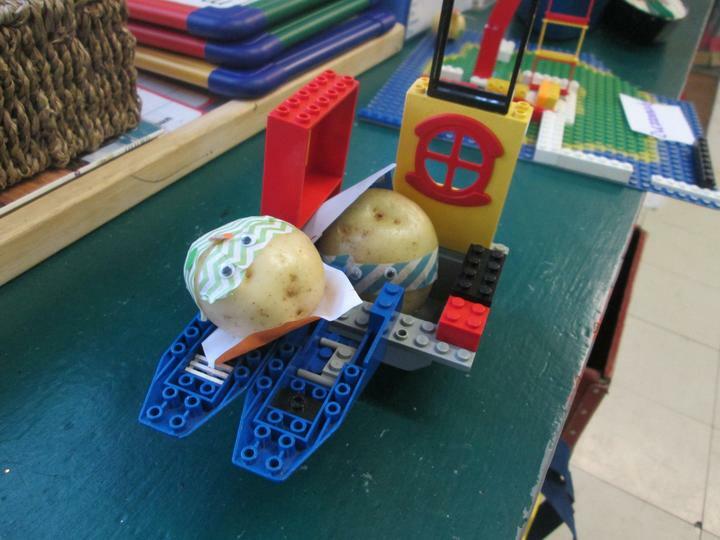 We love the story, 'Supertato. 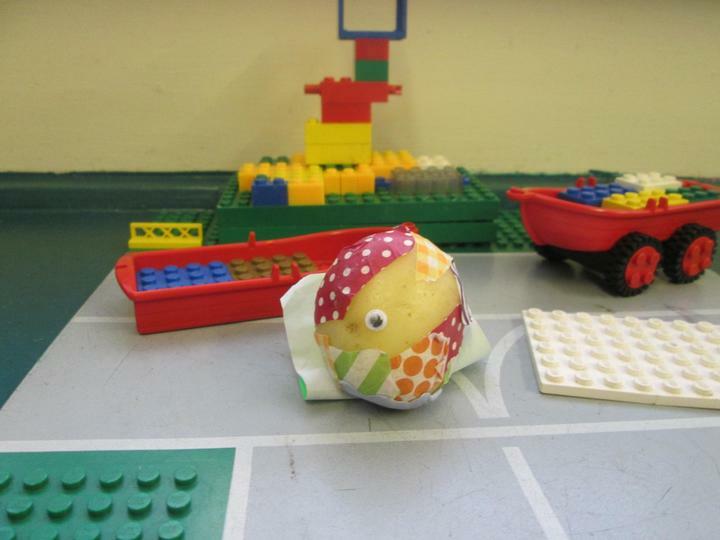 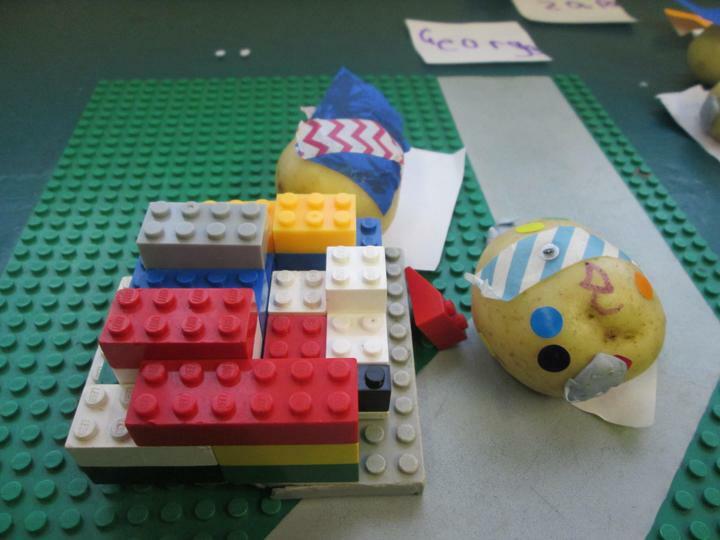 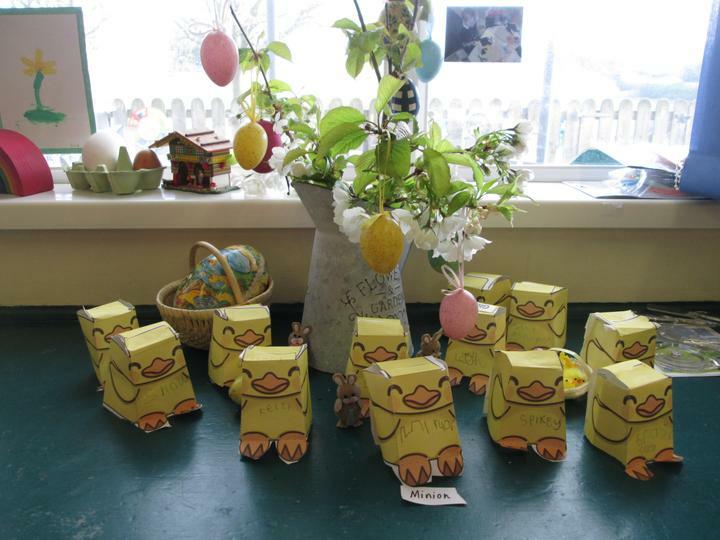 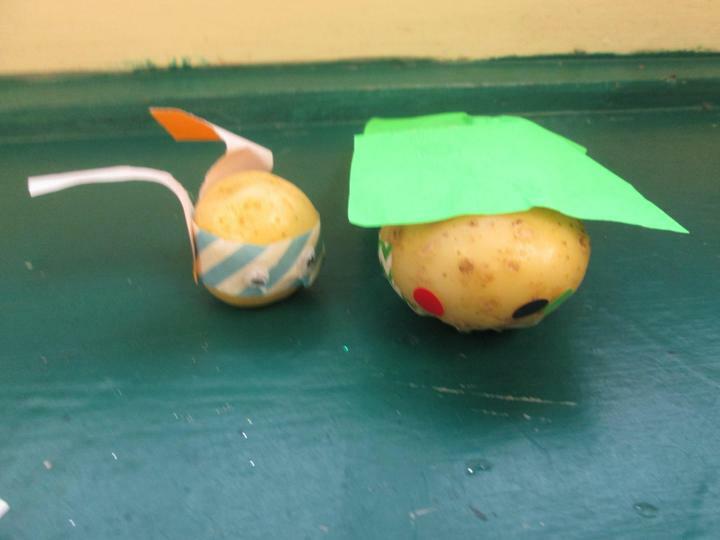 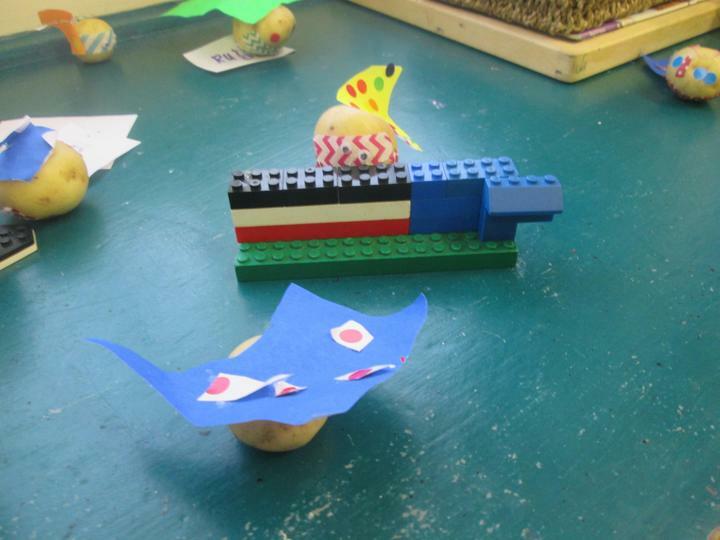 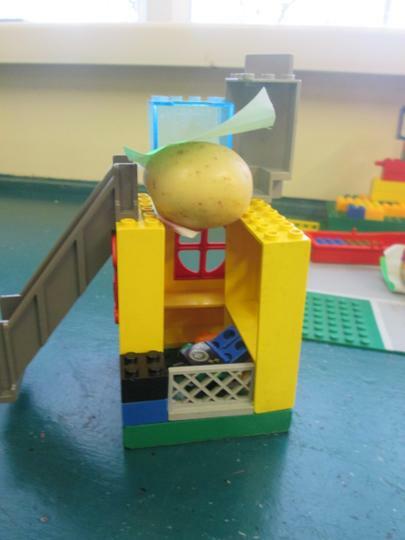 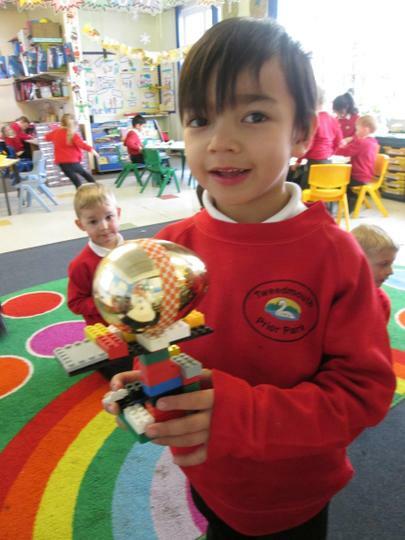 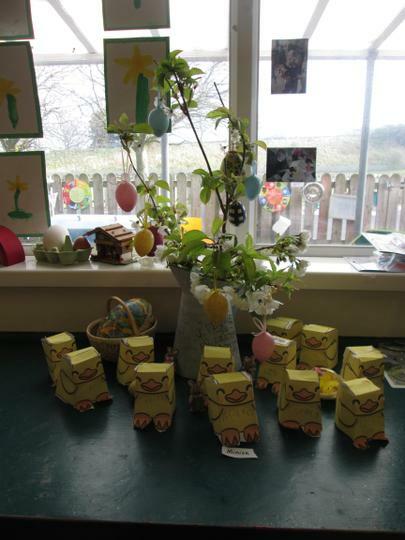 by Sue Hendra and we have made our very own Supertato characters. 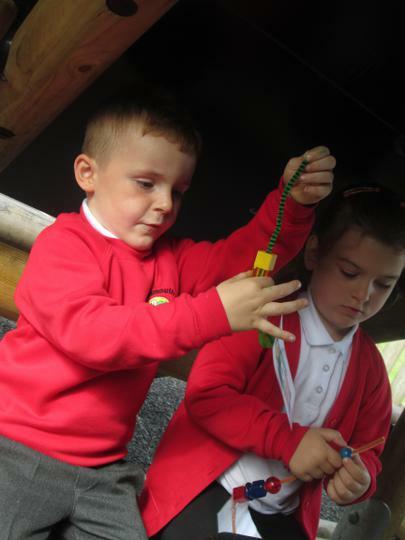 We have enjoyed taking them on adventures. 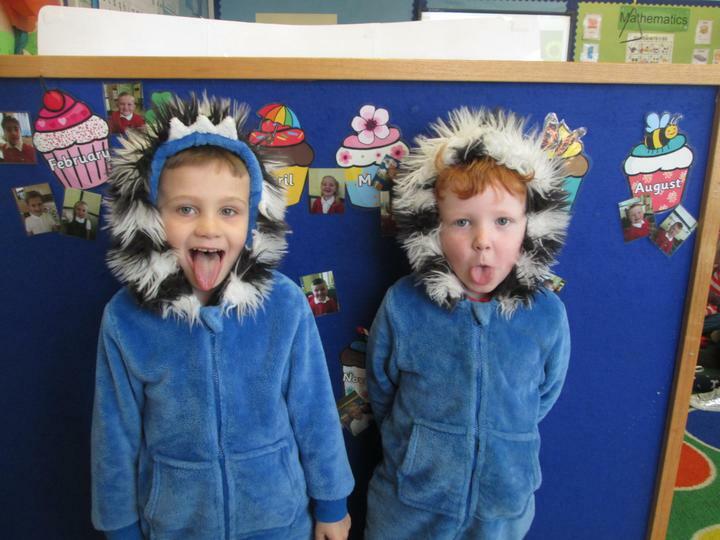 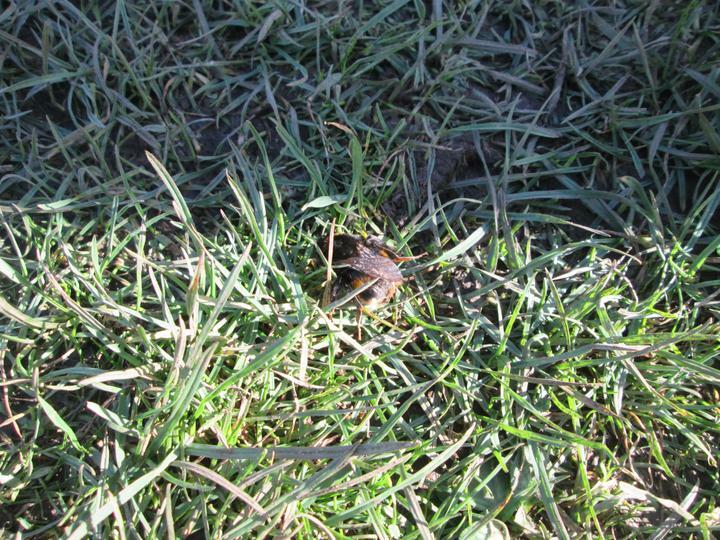 It is getting colder and we have been looking for signs of winter. 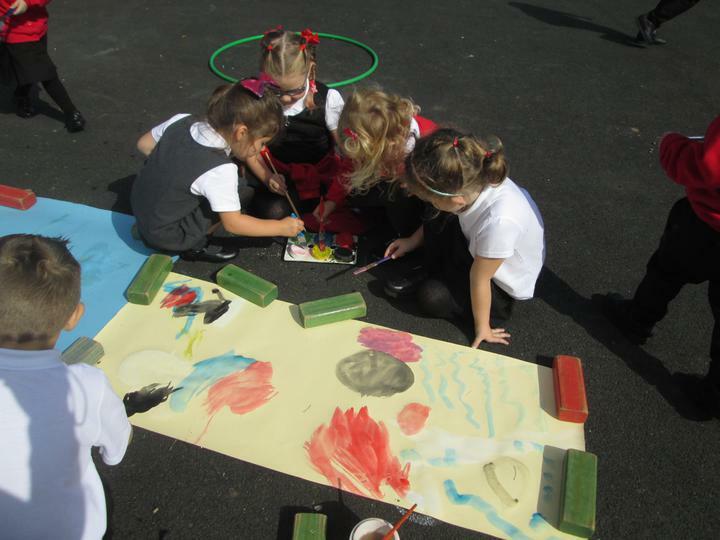 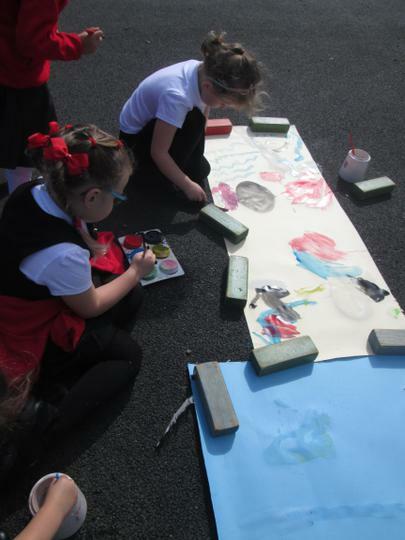 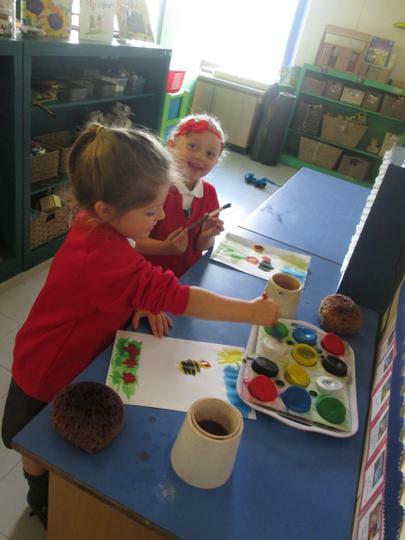 We painted some beautiful pictures of the winter trees in our playground. 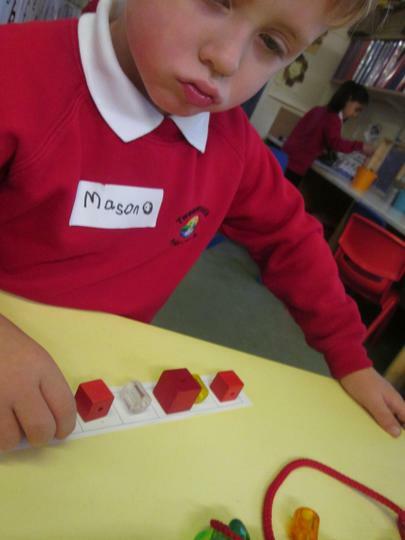 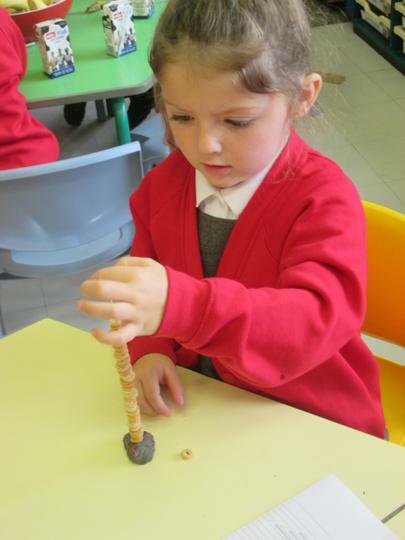 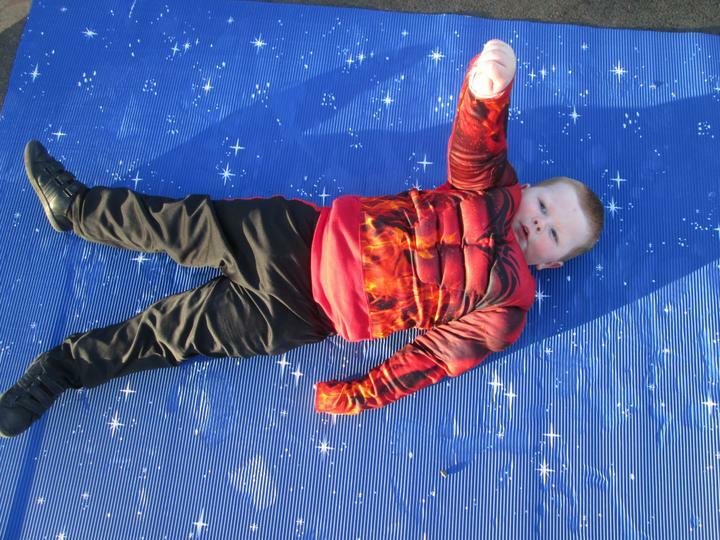 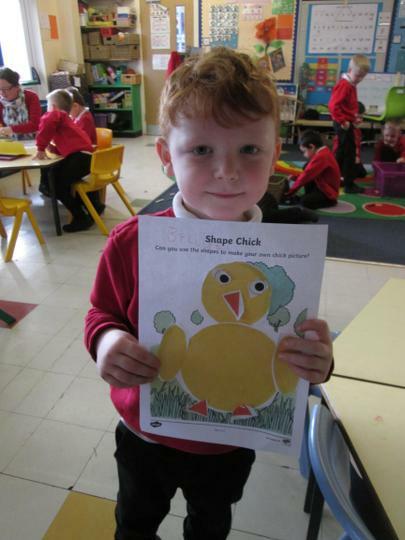 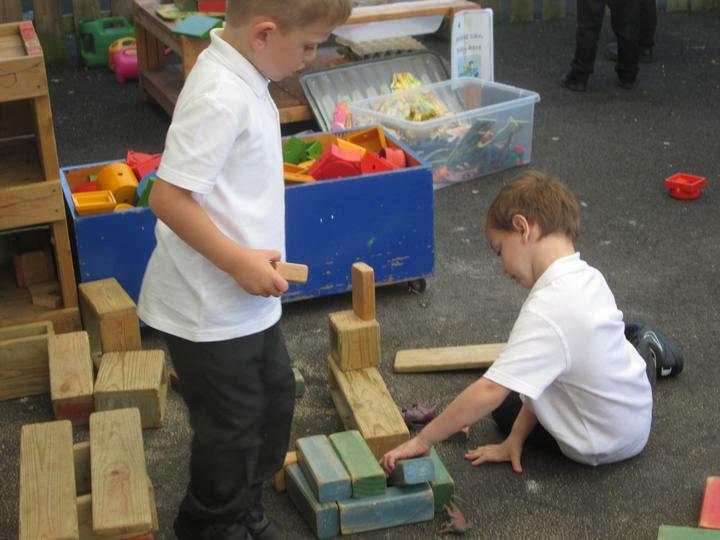 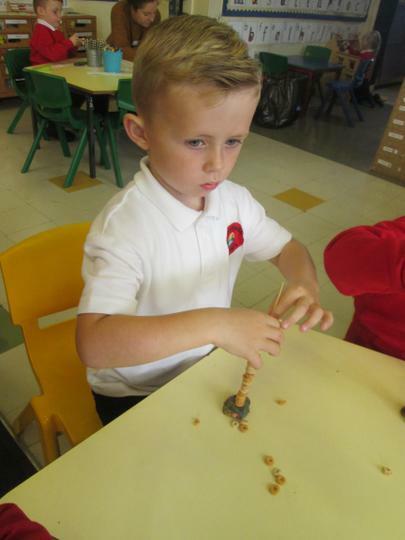 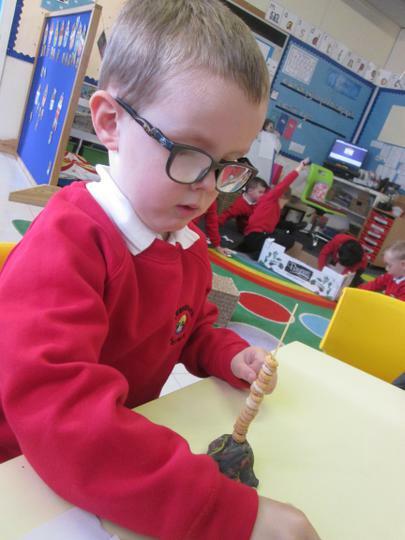 This half term we are learning all about shape and pattern. 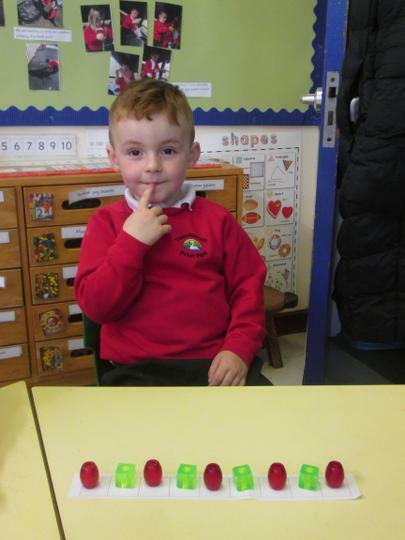 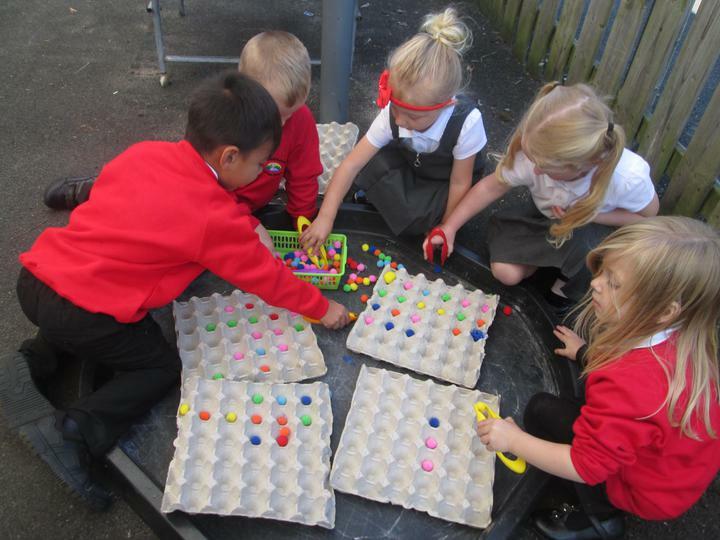 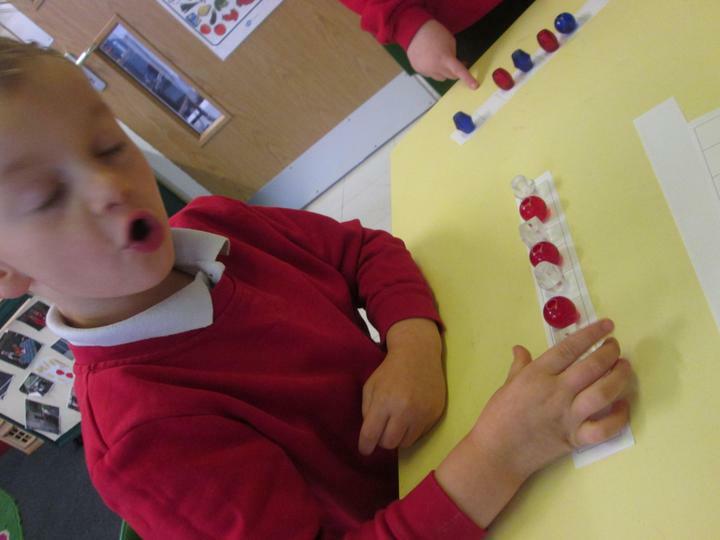 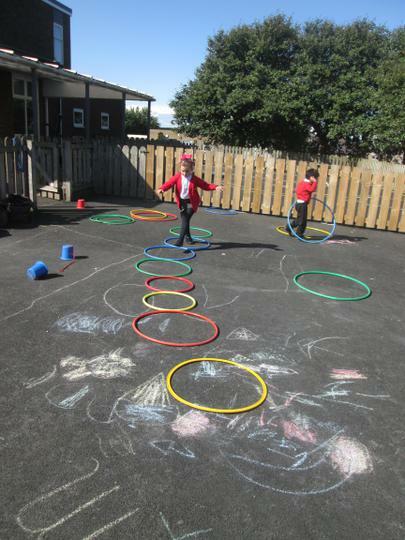 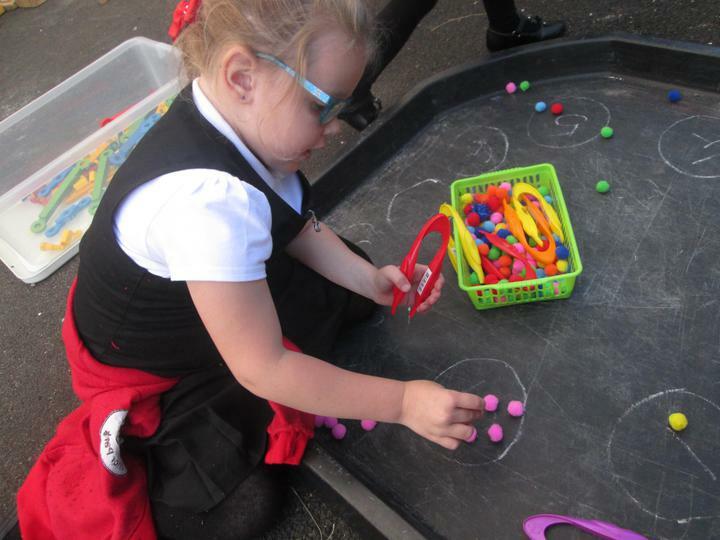 We have been very busy making patterns with shapes and colours. 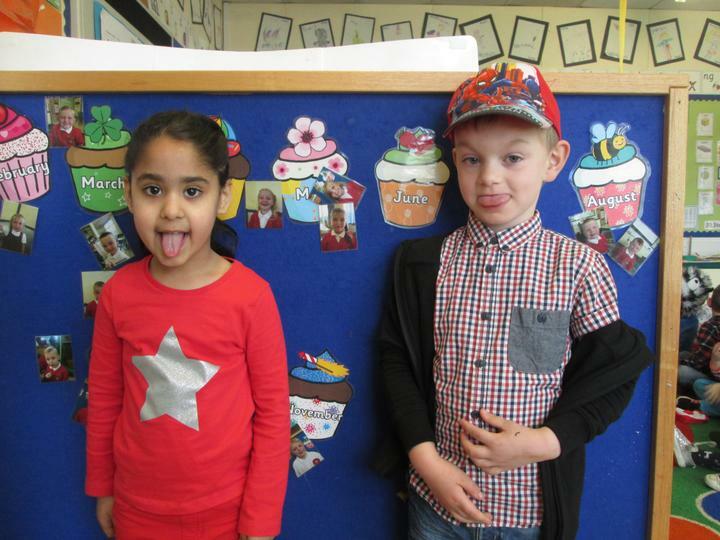 This term our topic is 'All about me' and you can find out what we are learning on our topic web. 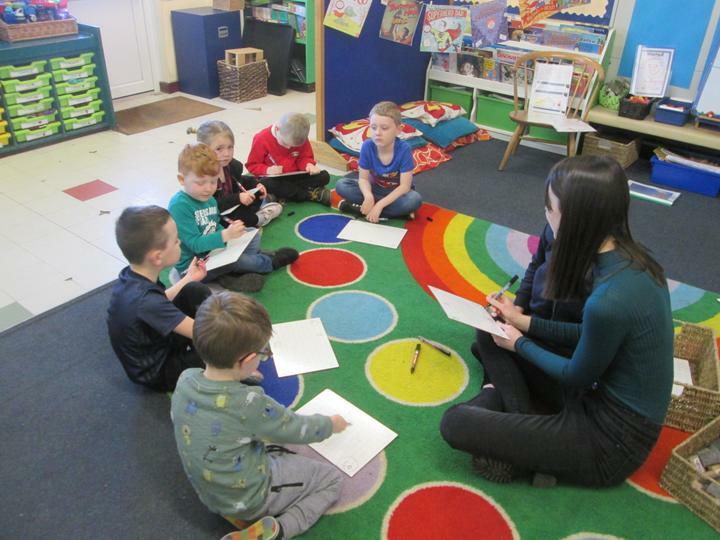 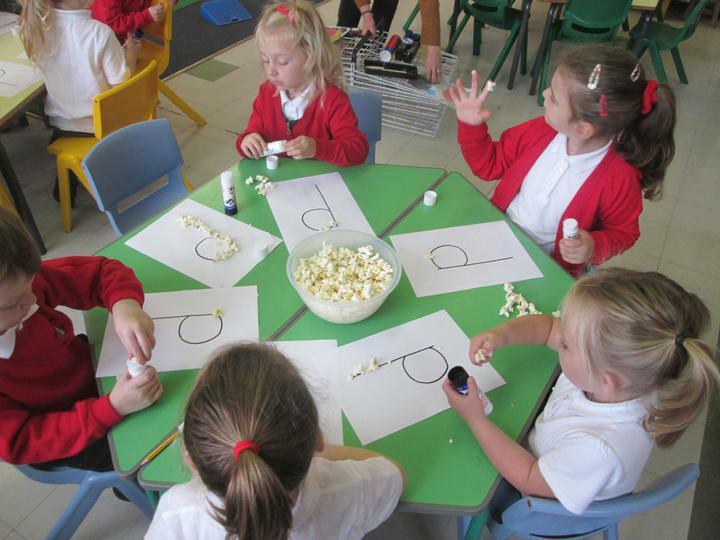 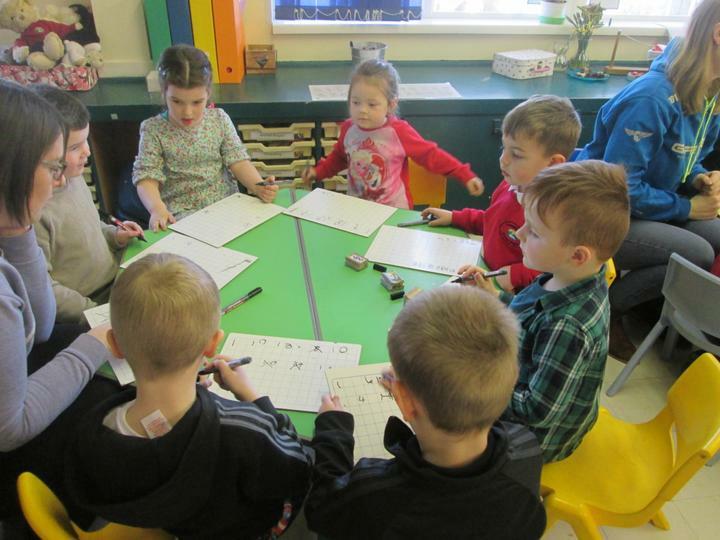 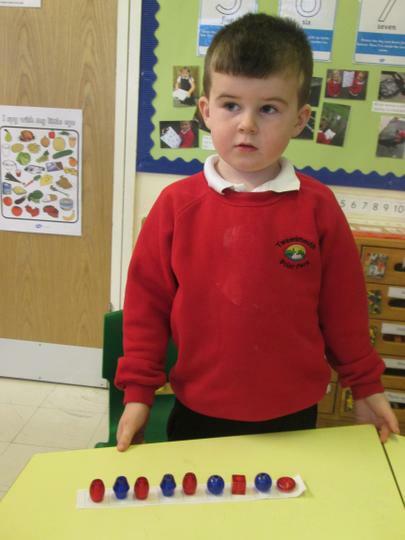 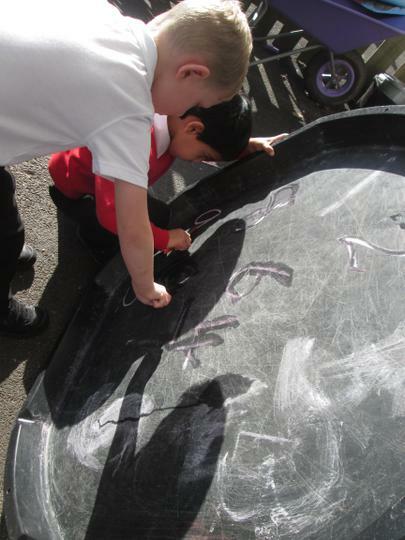 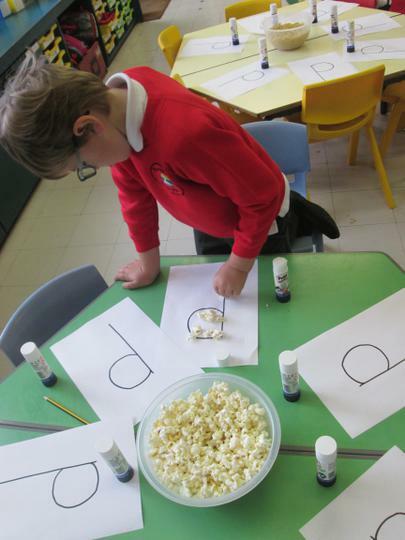 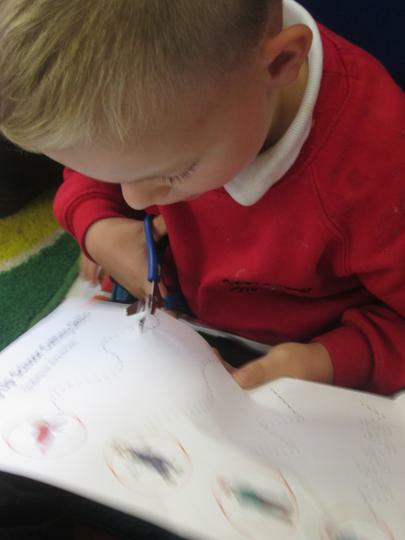 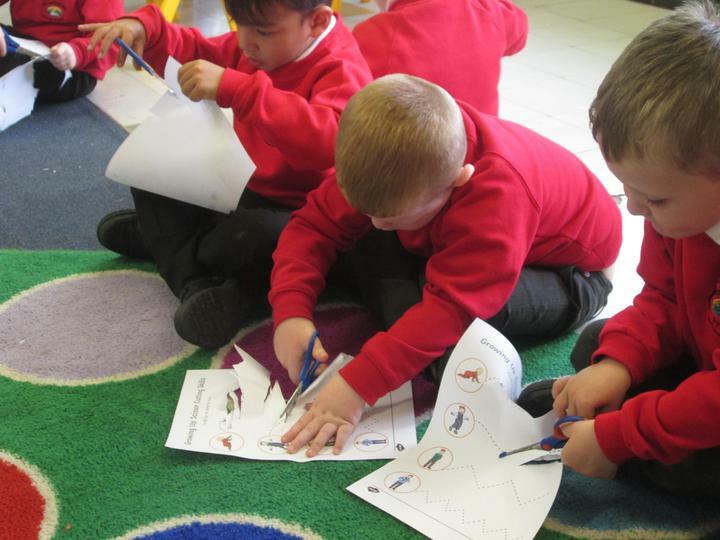 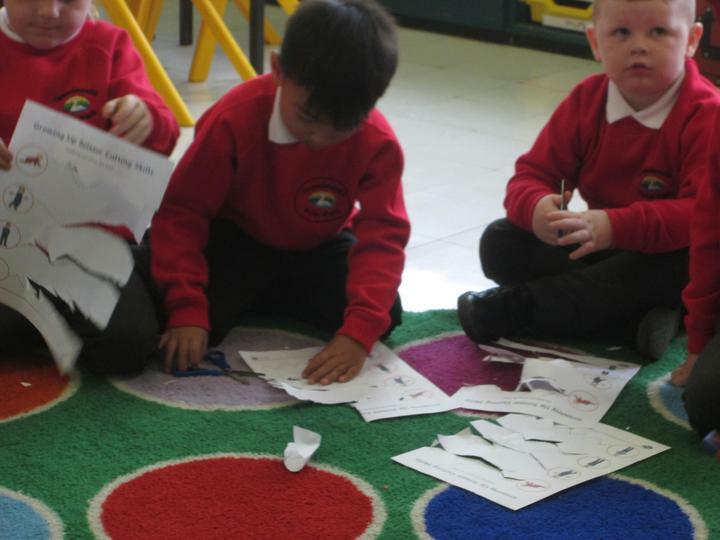 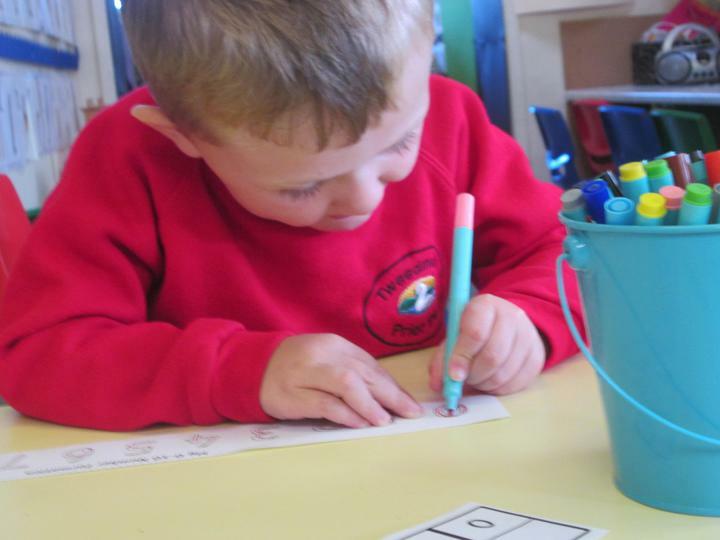 We are learning to read and write lots of letter sounds.